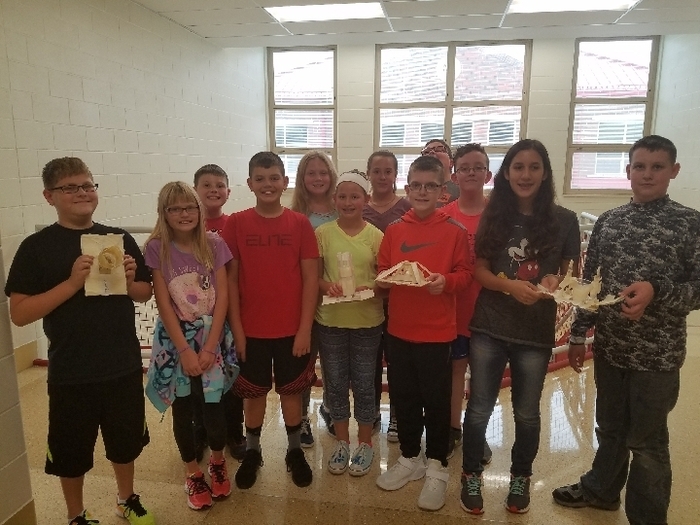 The Miami Valley CTC is once again hosting summer camp opportunities for students in the Milton-Union School district and surrounding districts. 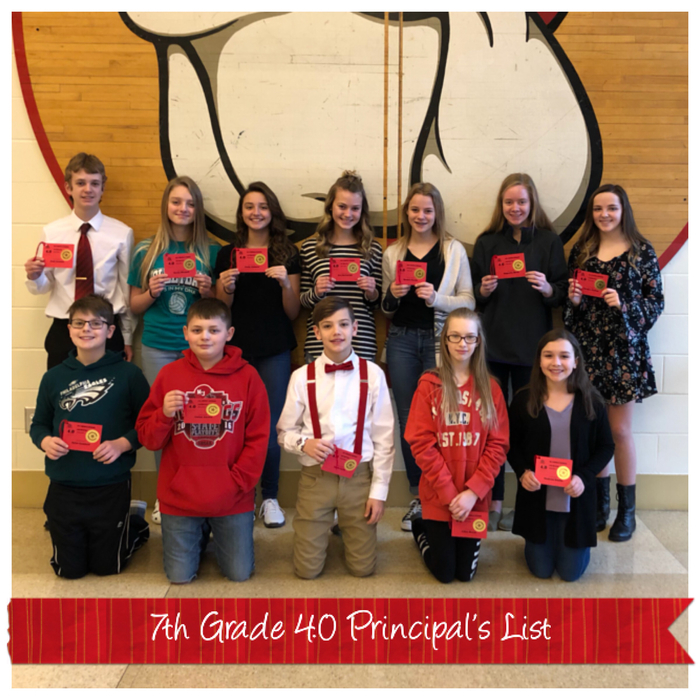 Informational flyers are available in the Middle School office. Please visit http://www.mvctc.com/camps to register. 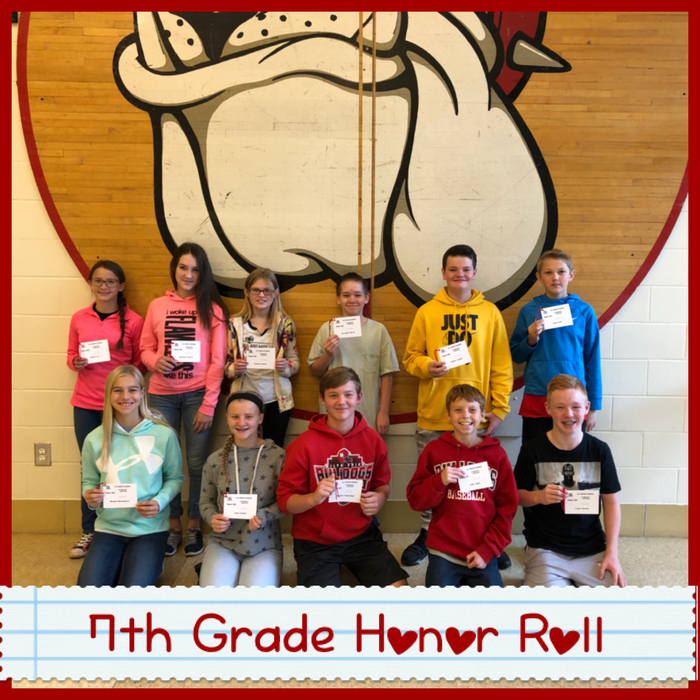 Way to go Betty, Eli, Grace, John, Addy, Collin, and Hazel!! 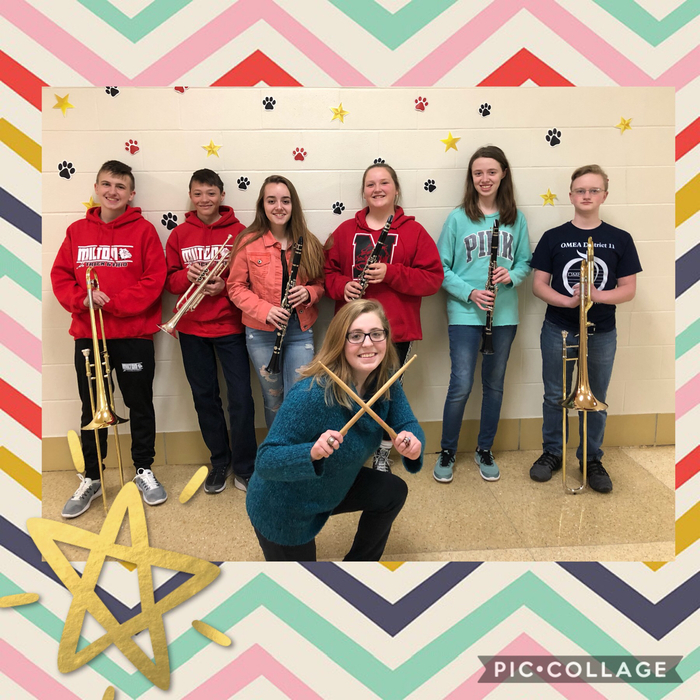 These students were all accepted into the Bowling Green State University Middle School Honor Band! Good luck to Ben Iddings! 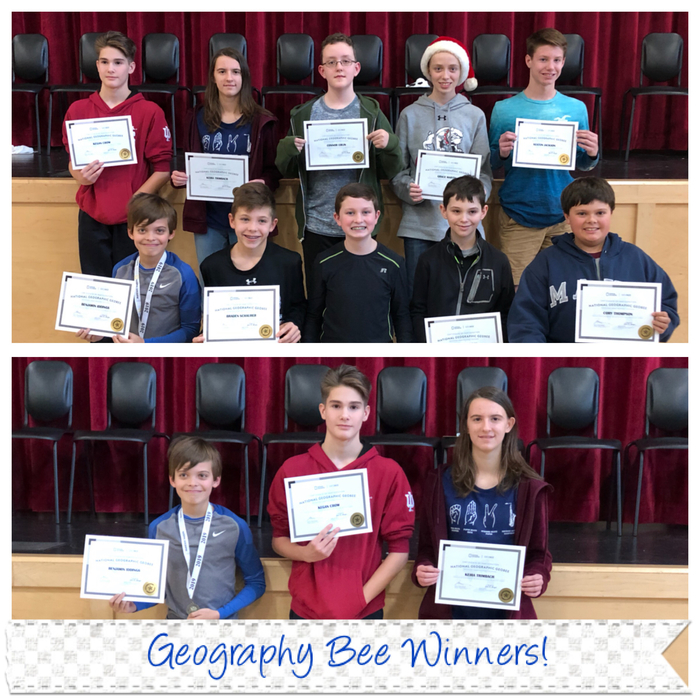 Ben was the winner of our school’s Geography Bee back in December. 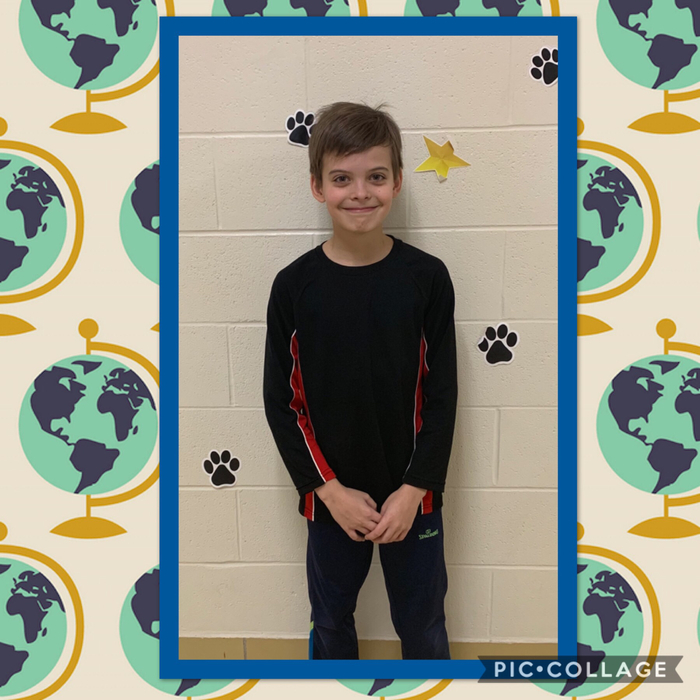 He then competed online at the regional level, and qualified for the State Geography Bee this Friday in Columbus. 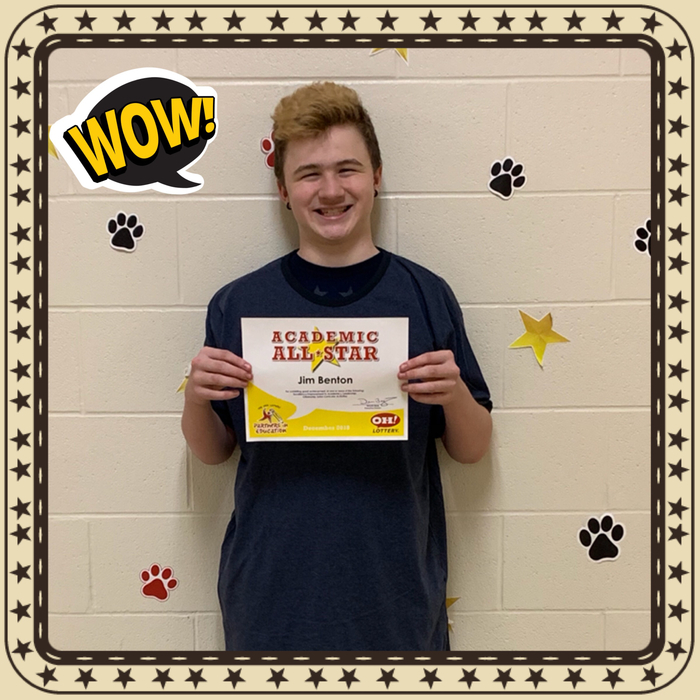 Best of Luck, Ben!! 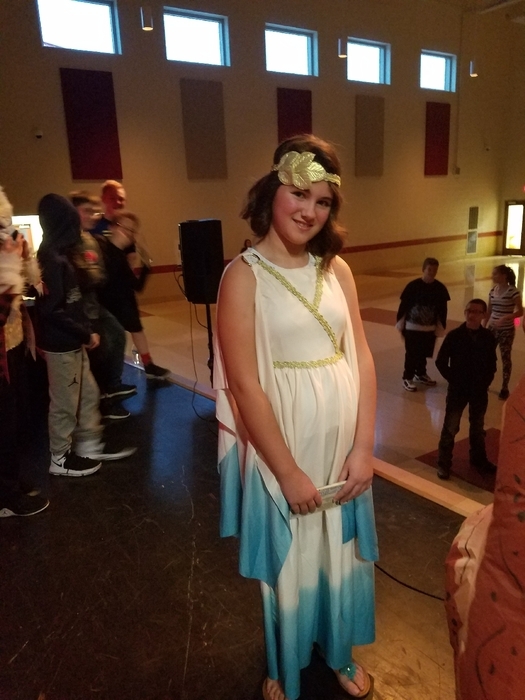 The MS drama class is getting ready for their April production! 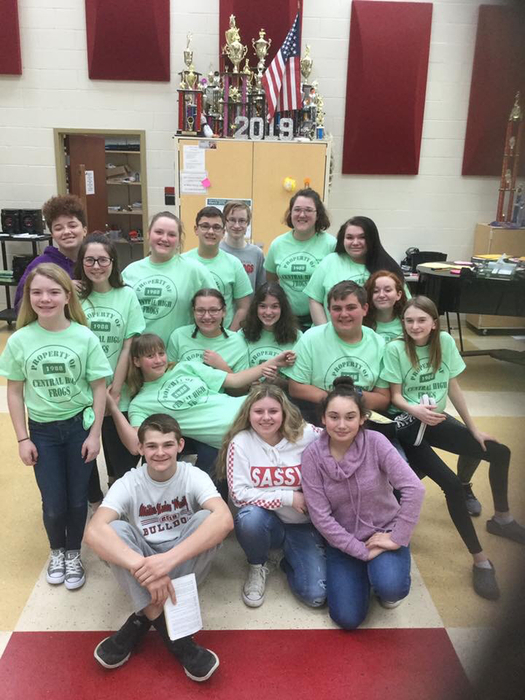 The MS and HS choirs will have their annual Spring Sing! on May 13th at 7pm. 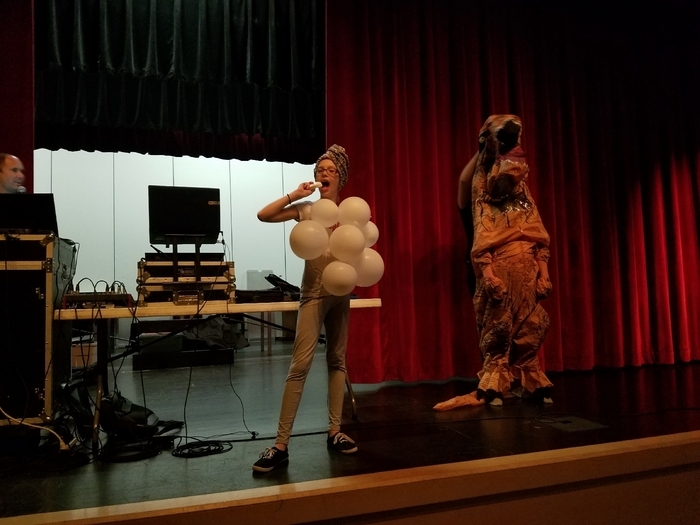 Students in grades 6-12 will perform! 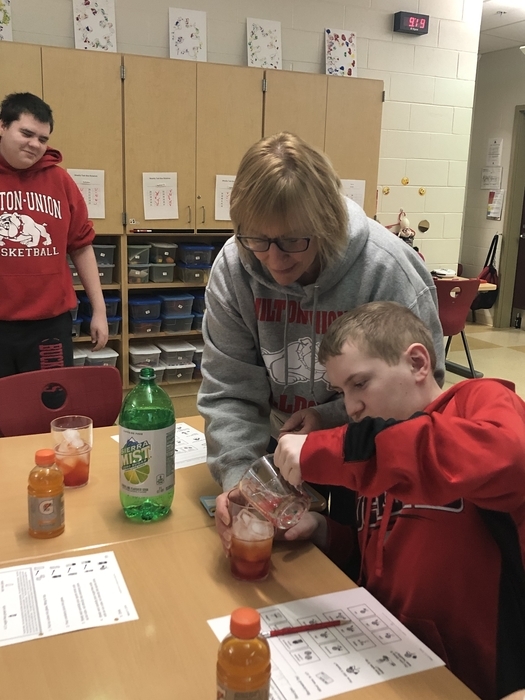 Mrs. Spaugy’s MS/HS class combined science, art, and cooking with this triple layered spring drink: cranberry juice, orange sports drink, and sugar free soda! 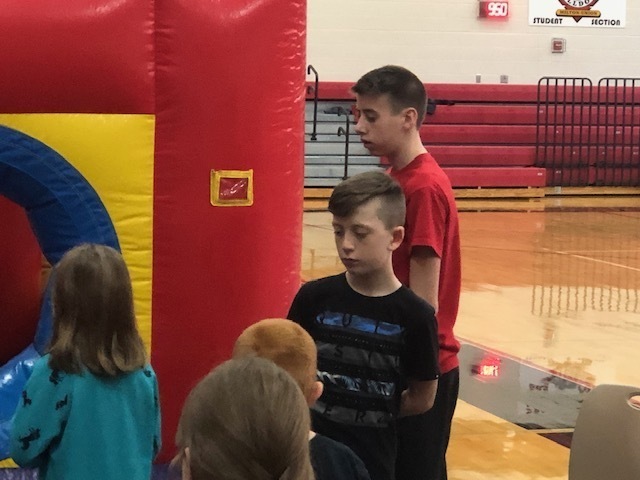 NJHS Students Tyler Kress, Carson Brown, Matthew Mayor, Ozzie Gregg, and Grace Martin helped out at the Spring Sling this past Saturday. 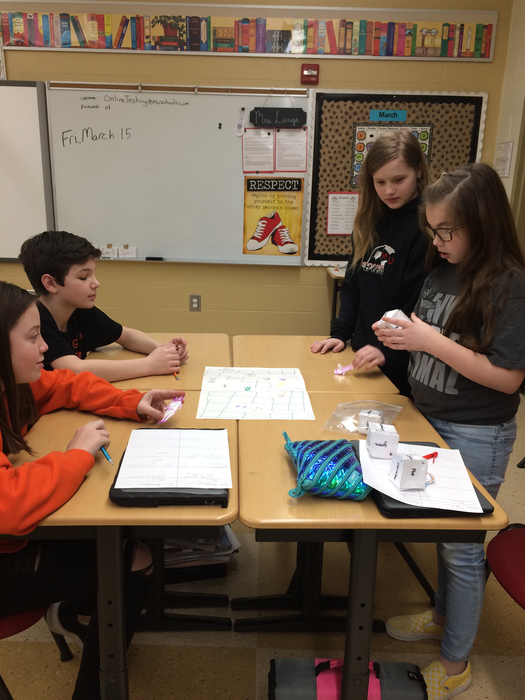 Mrs. Lange’s 6th grade LA students review important content vocabulary with games they designed and created using educational software, video game websites, or good old fashioned craft supplies! 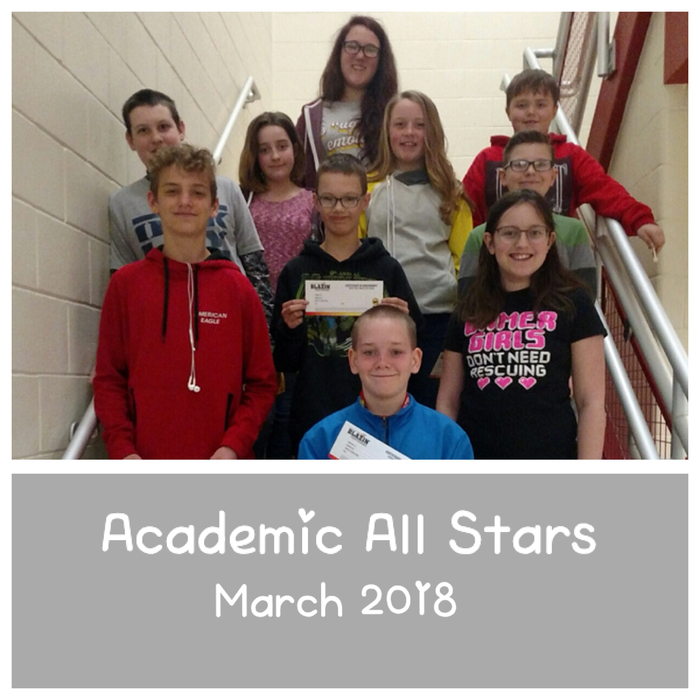 Congratulations to our Academic All Stars nominees this month! 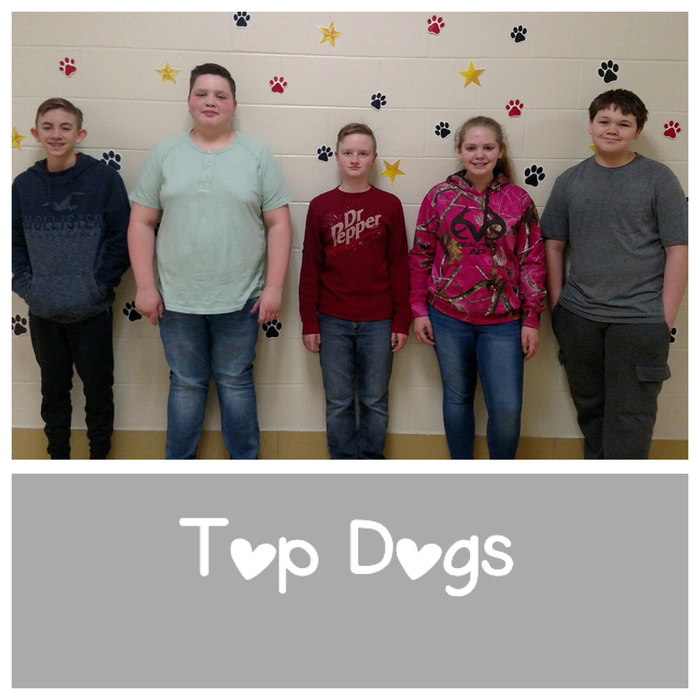 Congratulations to this month’s Top Dogs winners! 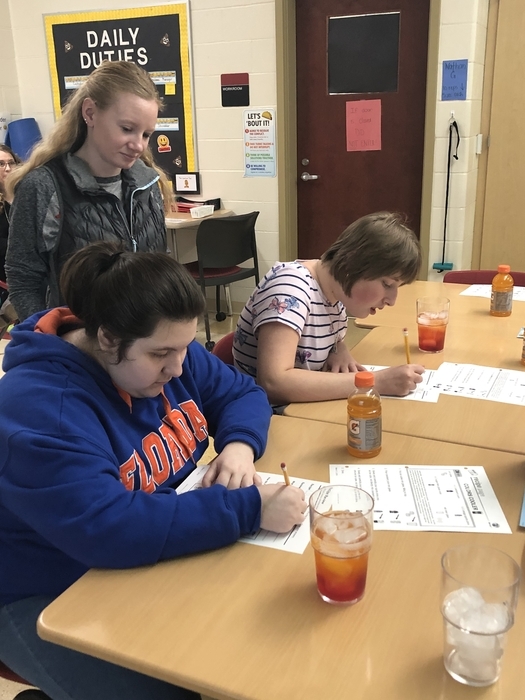 YWCA Offers “Safe Sitter” Class Students ages 11-13 can sign up to become a “Safe Sitter” with 3 classes held on Tuesdays, March 19 & 26 and April 2 at the Piqua YWCA. Class sessions are from 4-6 pm. This program is more than babysitting, but a youth developmental program focusing on safety and life skills. 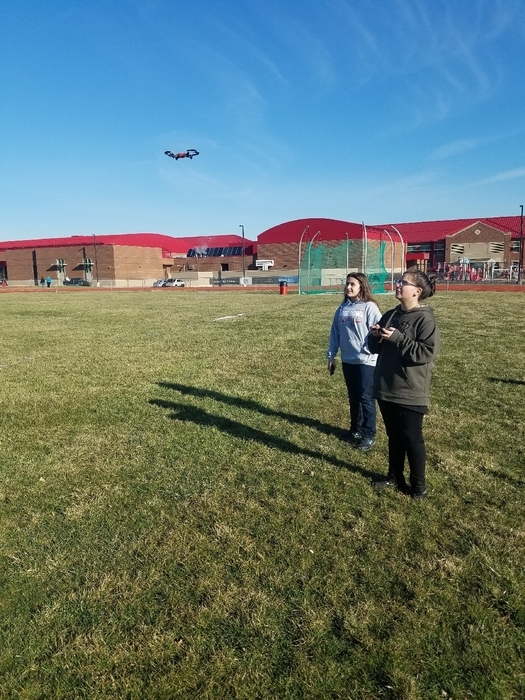 Students will participate in small group interactive learning, role-play games and practice rescue skills with manikins. Upon completion of this 6 hour course, students will be a registered safe sitter. Students must attend all classes in order to be certified. YWCA membership is not required. Class size is very limited so sign up early. A waiting list will be taken and more classes will be scheduled if needed. 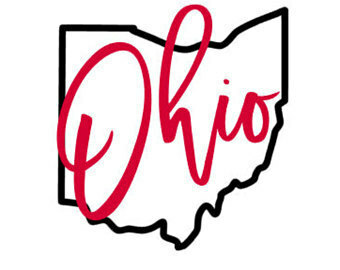 For more information on class fees or to register, stop at the YWCA at 418 N. Wayne Street Piqua or call 773-6626. 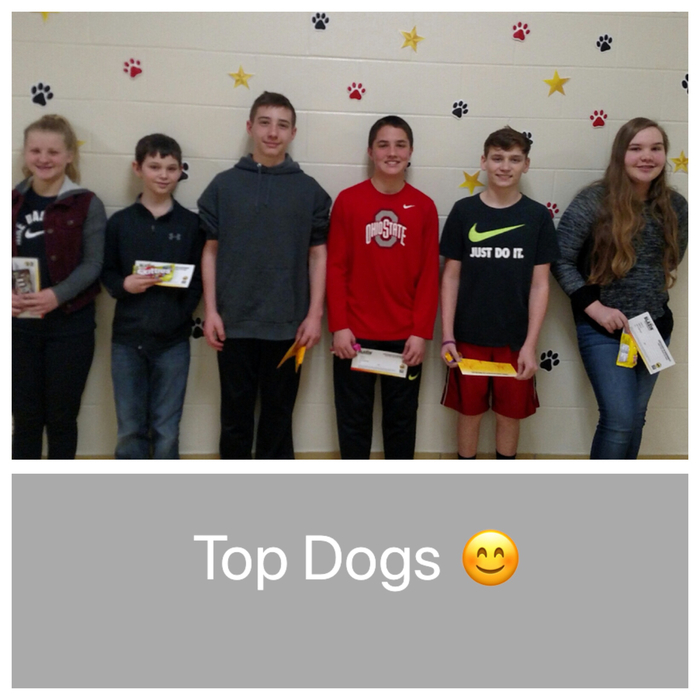 Congratulations to our Top Dogs raffle winners this month! 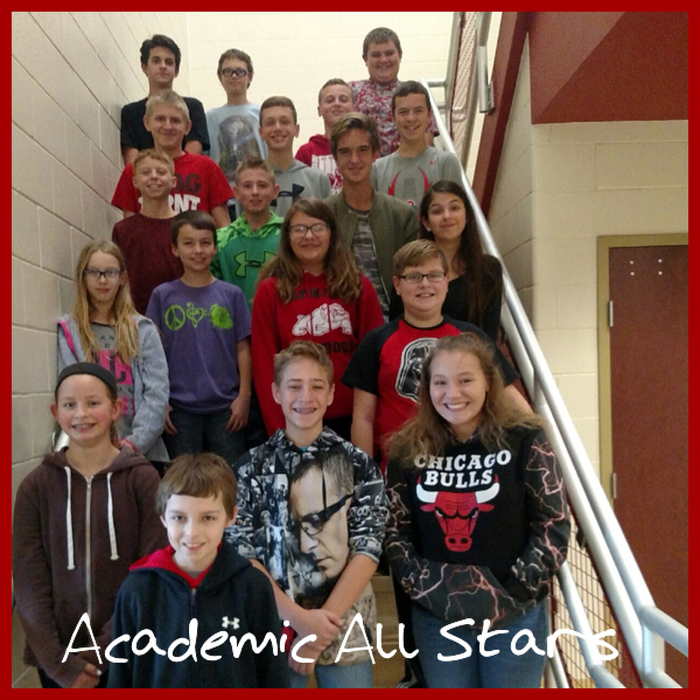 Congratulations to the students who were nominated as Academic All Stars this month! 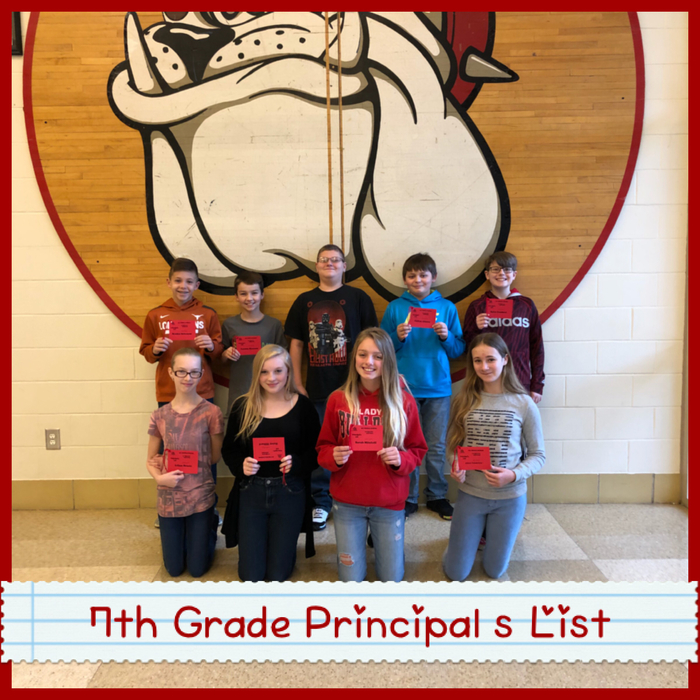 ⭐️ Teachers nominate students based on academics, responsibility, attitude, leadership, school spirit, citizenship, extracurricular activity, and community service. 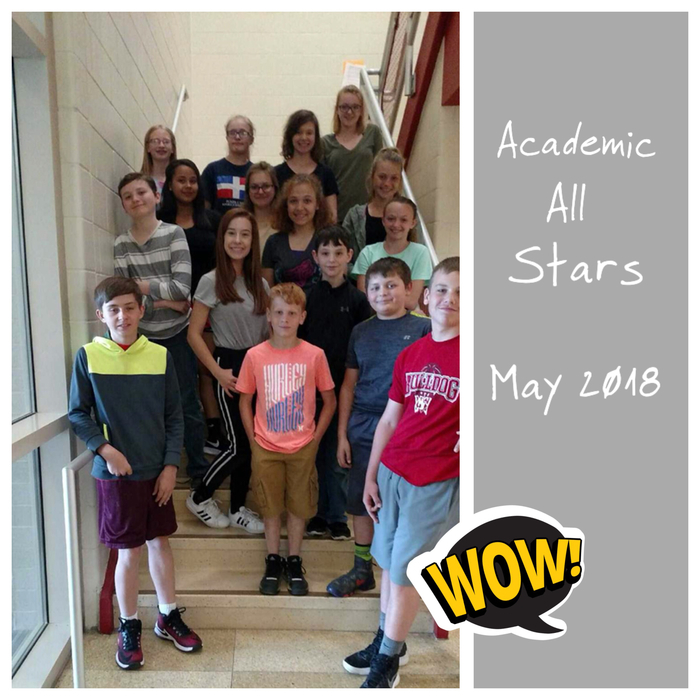 Way to go, All Stars! Congratulations to Megan! Megan, and the rest of our Power of the Pen team, competed last month. Megan’s score qualifies her to move on to the Regional competition in March! 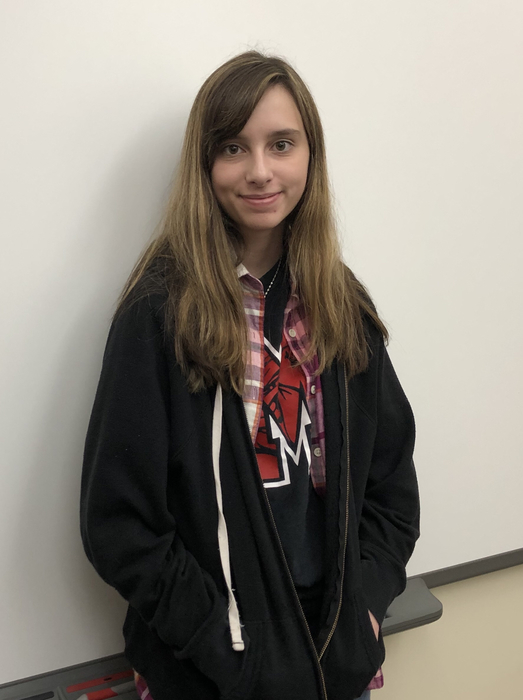 Megan also received the 8th Grade Director’s Choice Award for her story, “Amir’s Memories.” Way to go, Megan! 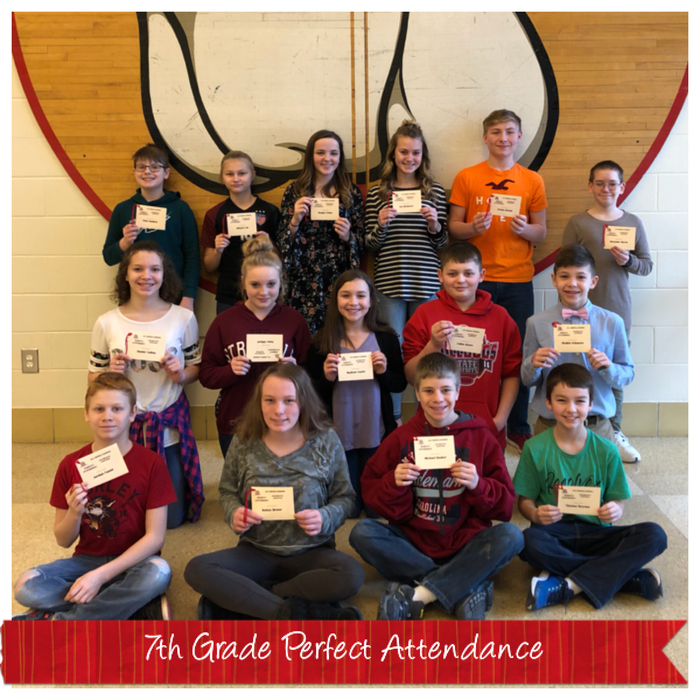 Attendance is an important factor in school success. 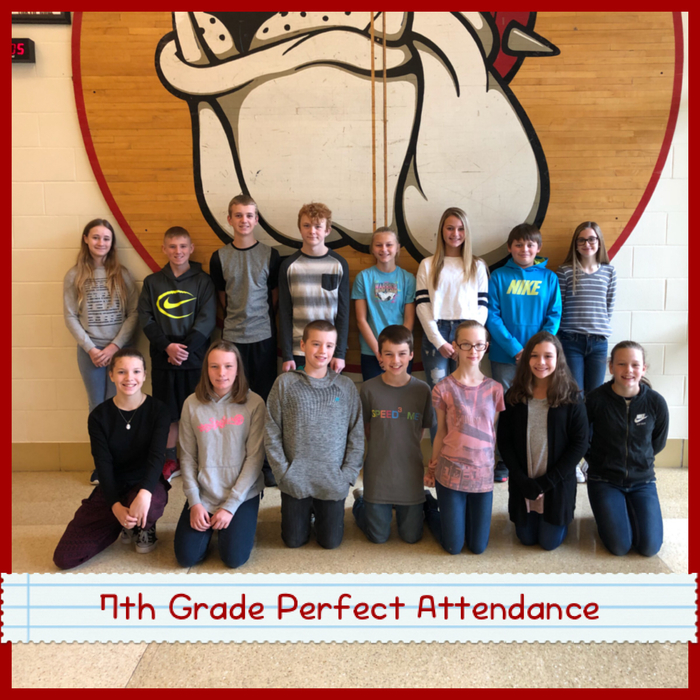 Congratulations to these 6th graders who had perfect attendance last quarter! 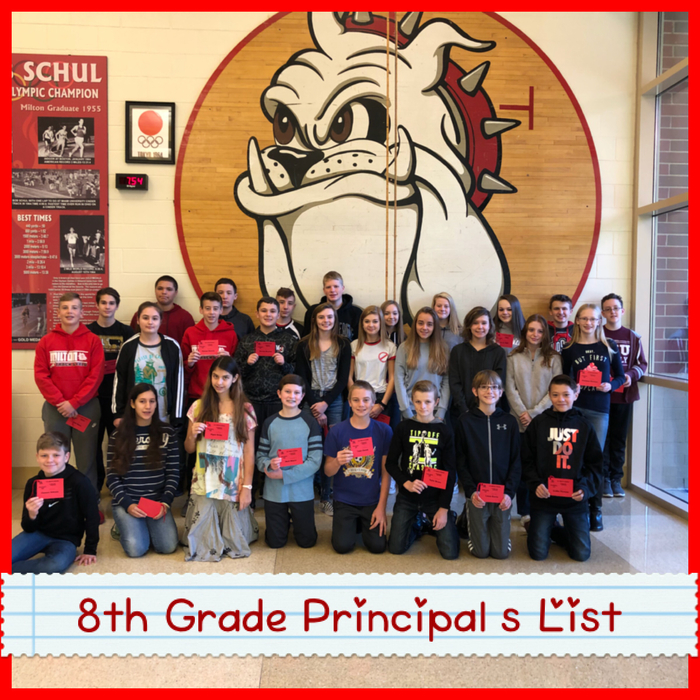 Way to go, 8th Graders! 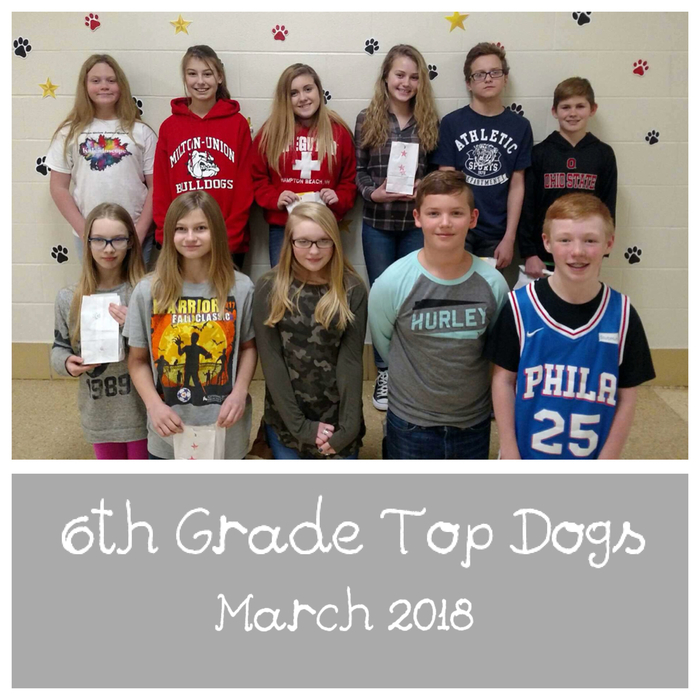 Top Dogs is a monthly raffle drawing, and these are this month’s winners! 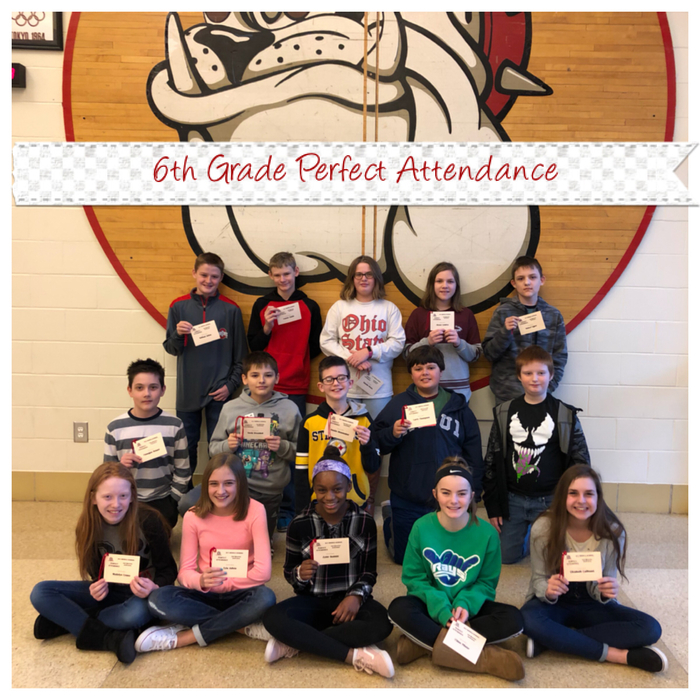 😊 Students earn tickets for good grades, perfect attendance and excellent behavior. 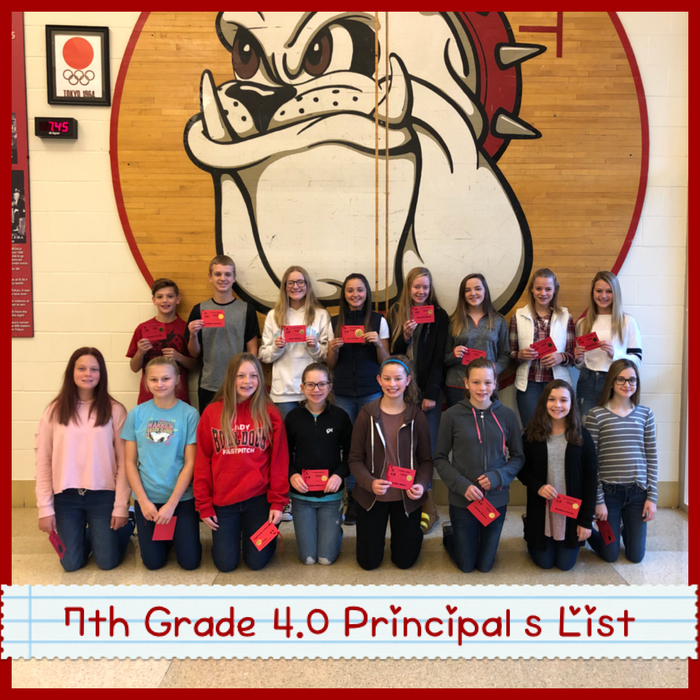 Way to go, 7th Graders! 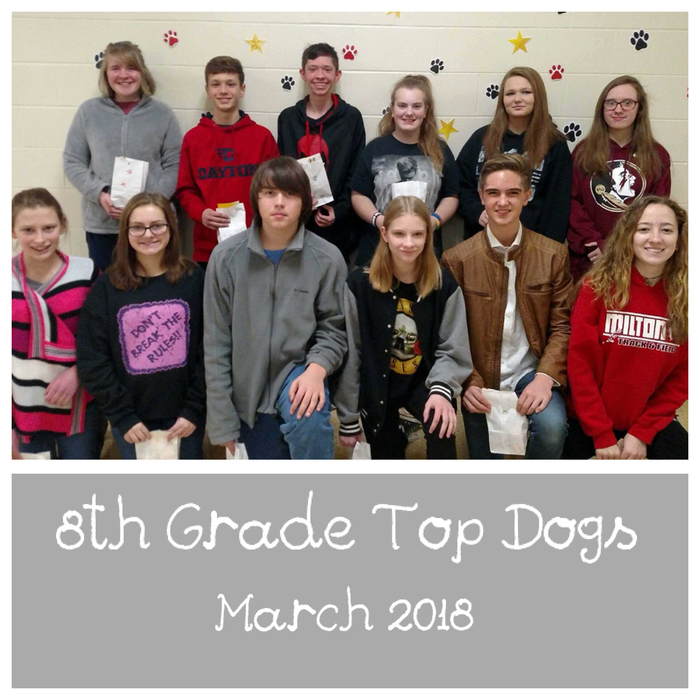 Top Dogs is a monthly raffle drawing, and these are this month’s winners! 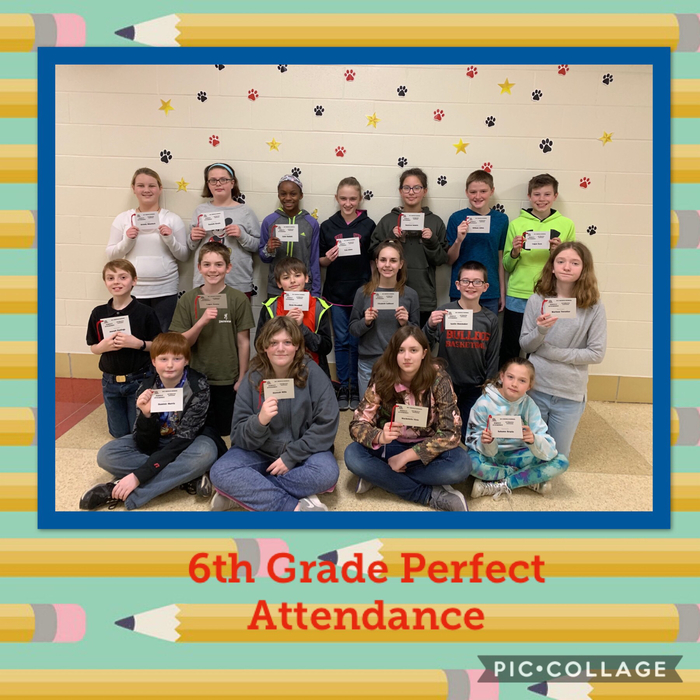 😊 Students earn tickets for good grades, perfect attendance and excellent behavior. 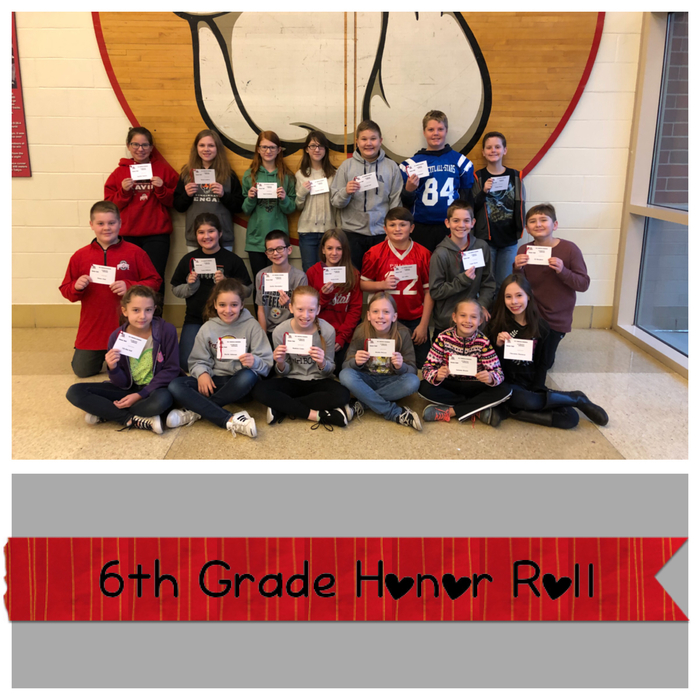 Way to go, 6th graders! 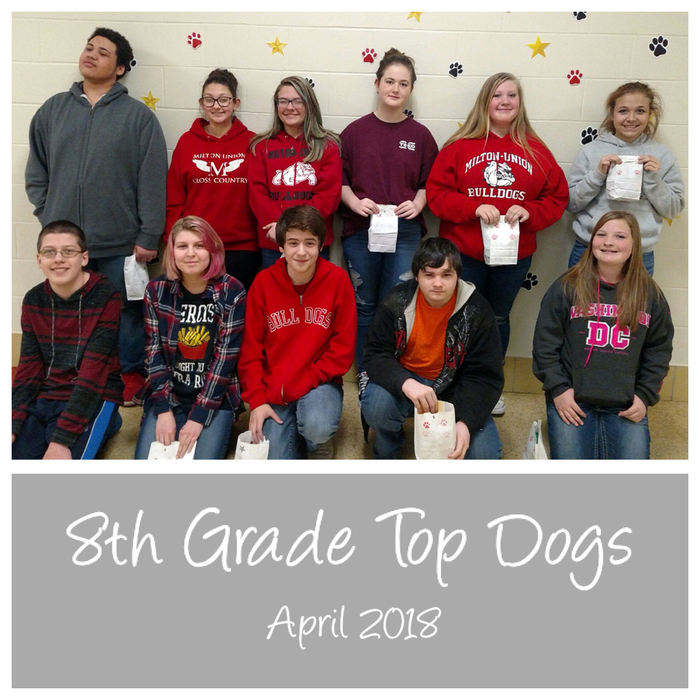 Top Dogs is a monthly raffle drawing, and these are this month’s winners! 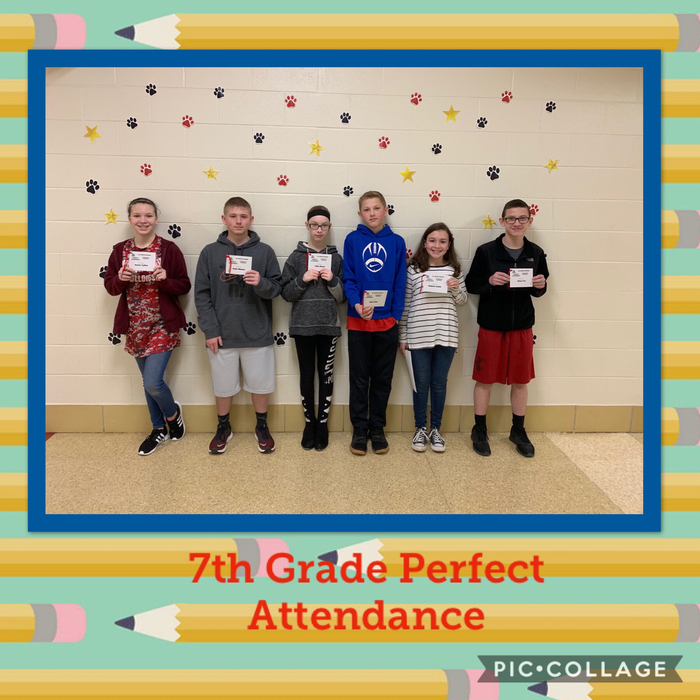 😊 Students earn tickets for good grades, perfect attendance and excellent behavior. 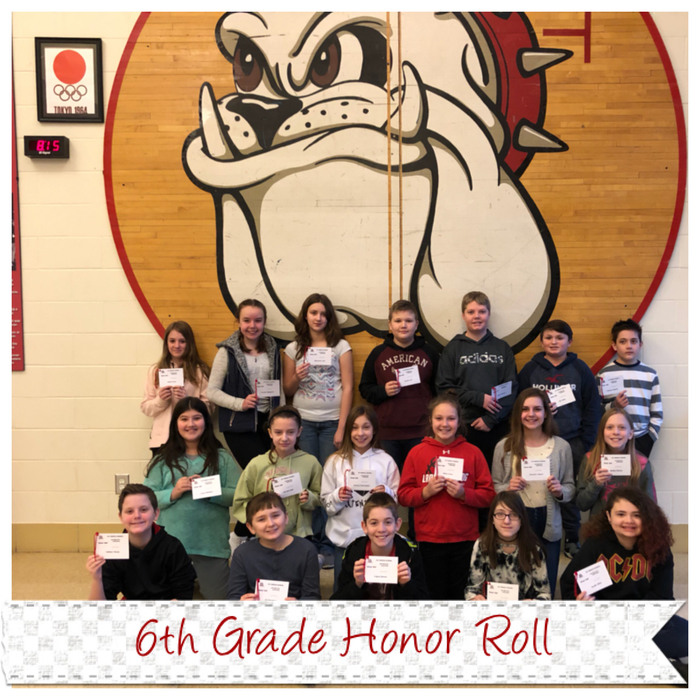 It’s always wonderful to celebrate our students’ successes. 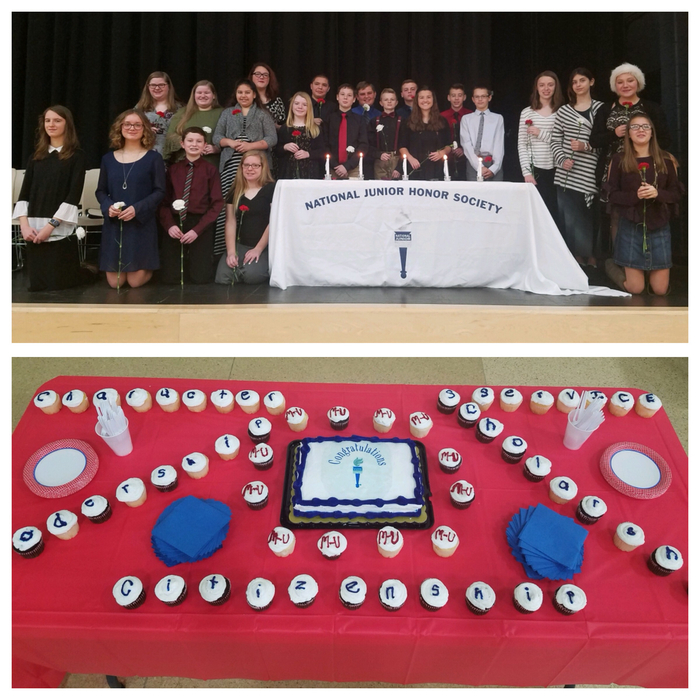 But inducting members into our school’s chapter of the National Junior Honor Society is always such a pleasure. 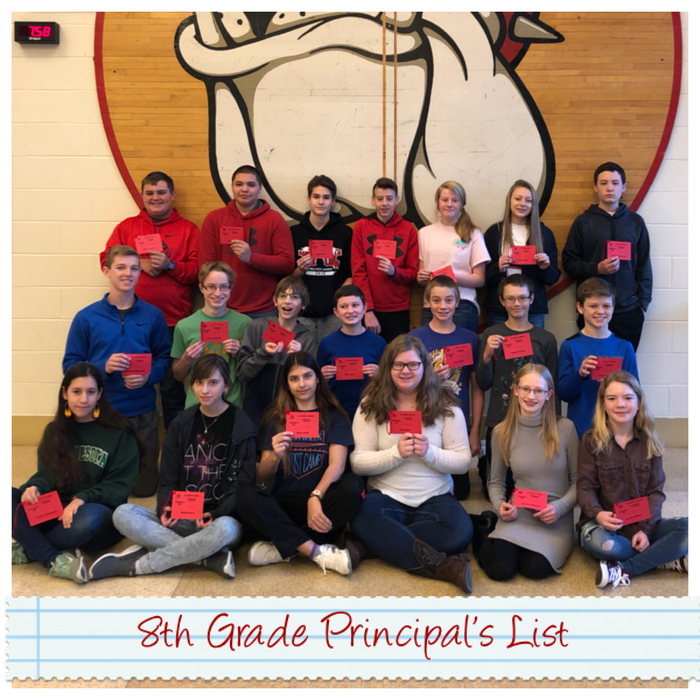 😊 Congratulations to these 8th graders! 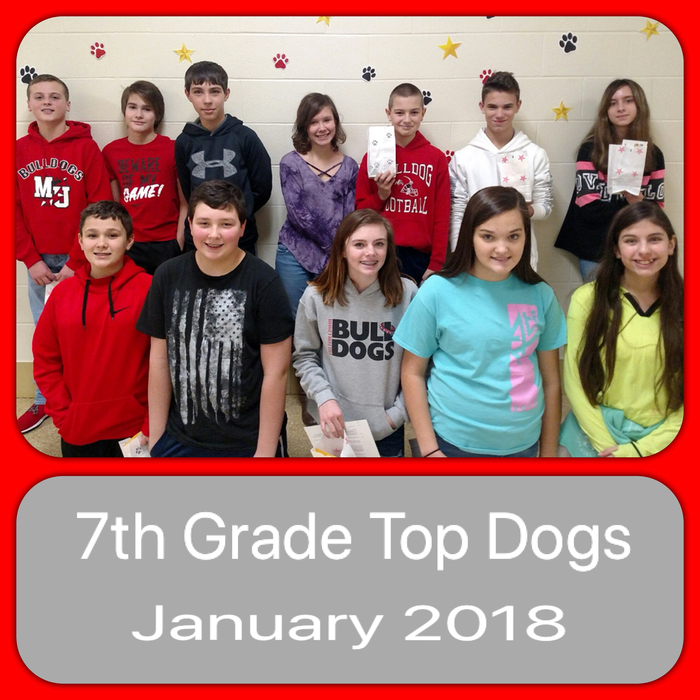 Top Dogs is a reward raffle that we do at the Middle School every month to encourage our students to work hard, come to school, and follow the rules. 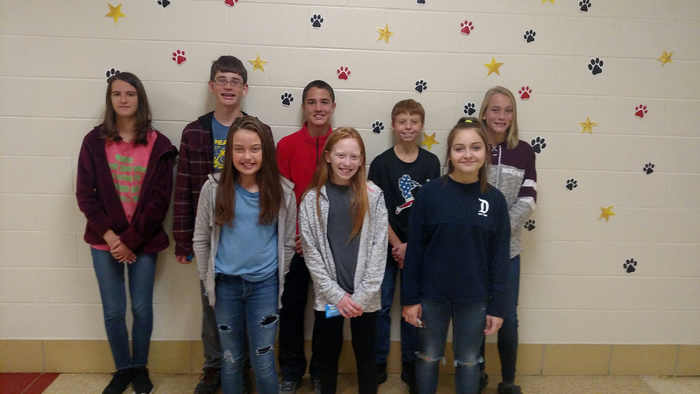 Congratulations to this month’s 8th Grade winners! 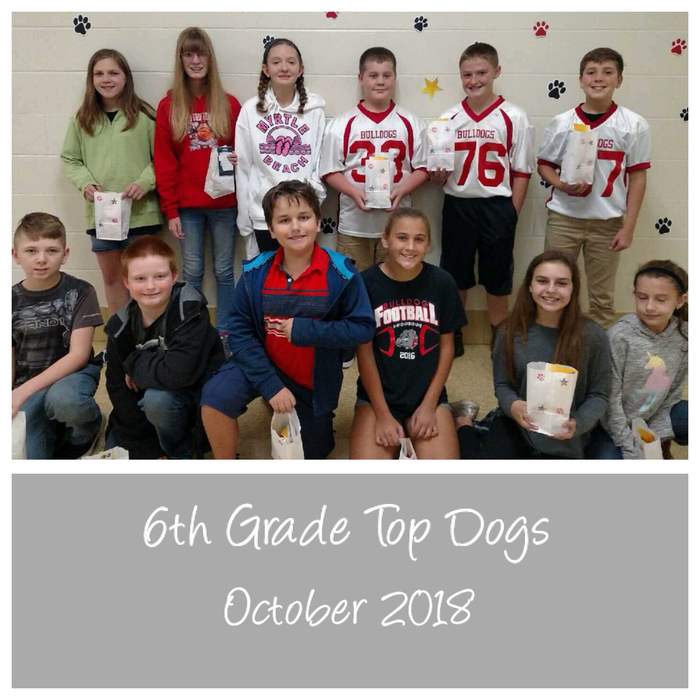 Top Dogs is a reward raffle that we do at the Middle School every month to encourage our students to work hard, come to school, and follow the rules. 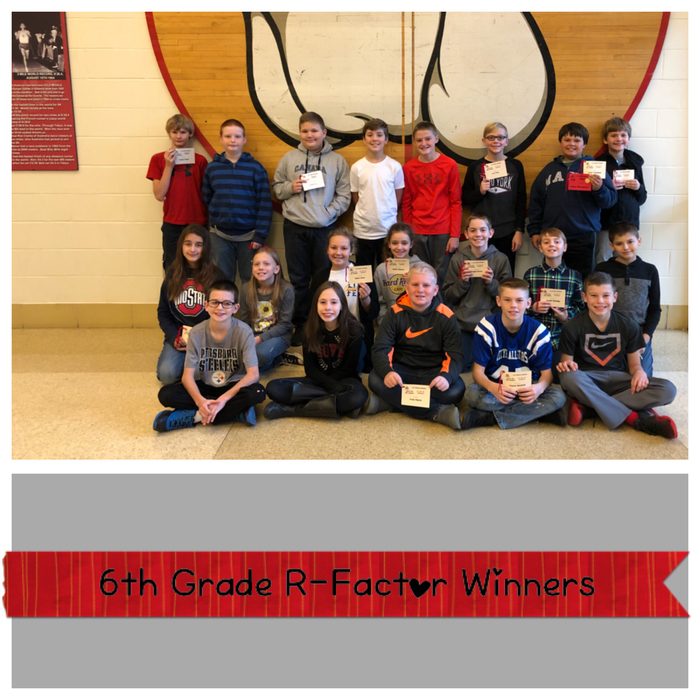 Congratulations to this month’s 6th Grade winners! 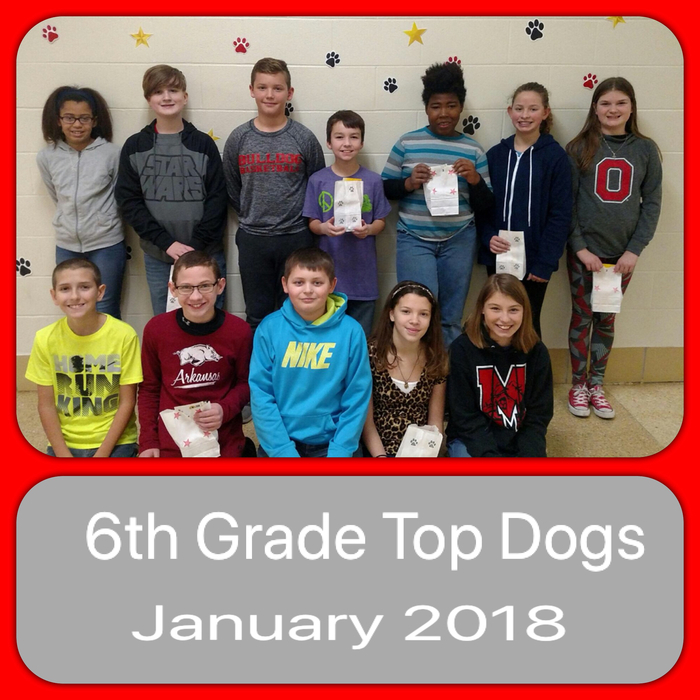 Top Dogs is a reward raffle that we do at the Middle School every month to encourage our students to work hard, come to school, and follow the rules. 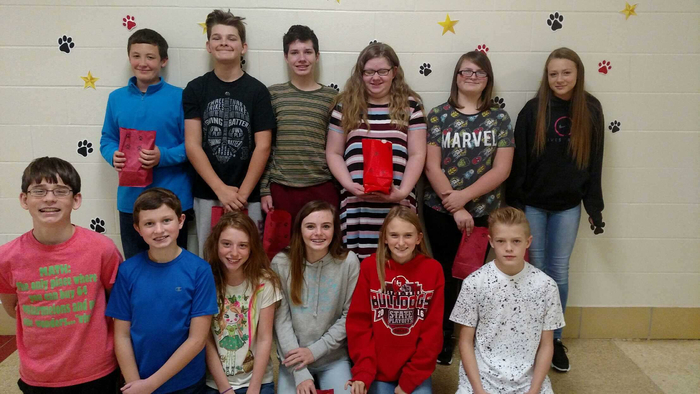 Congratulations to this month’s 7th Grade winners! 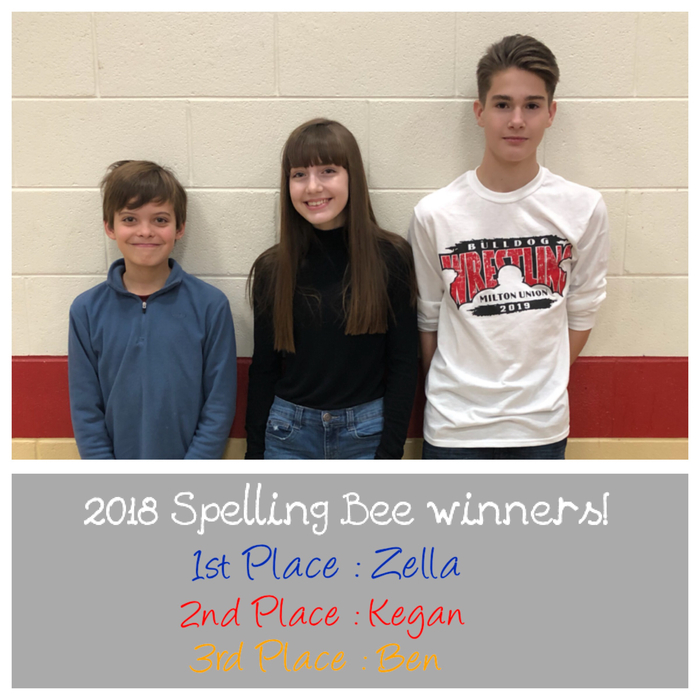 Congratulations to all of our students who participated in this morning’s school Spelling Bee, but special congrats to our winners! 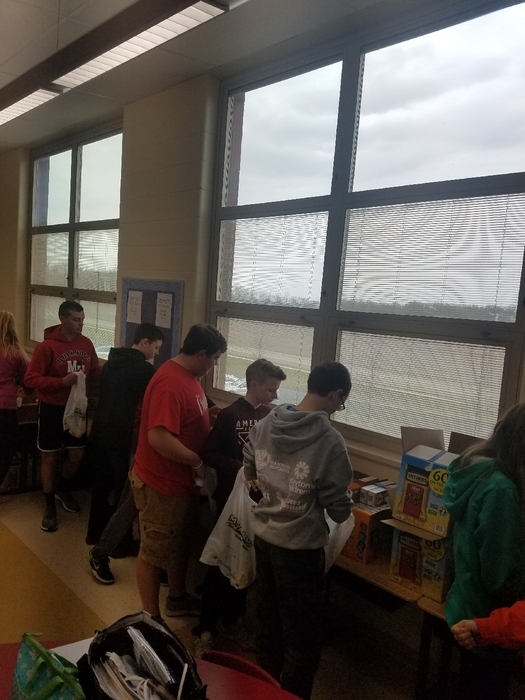 Thanks to NJHS for providing a yummy breakfast for the classroom winners after the Bee! 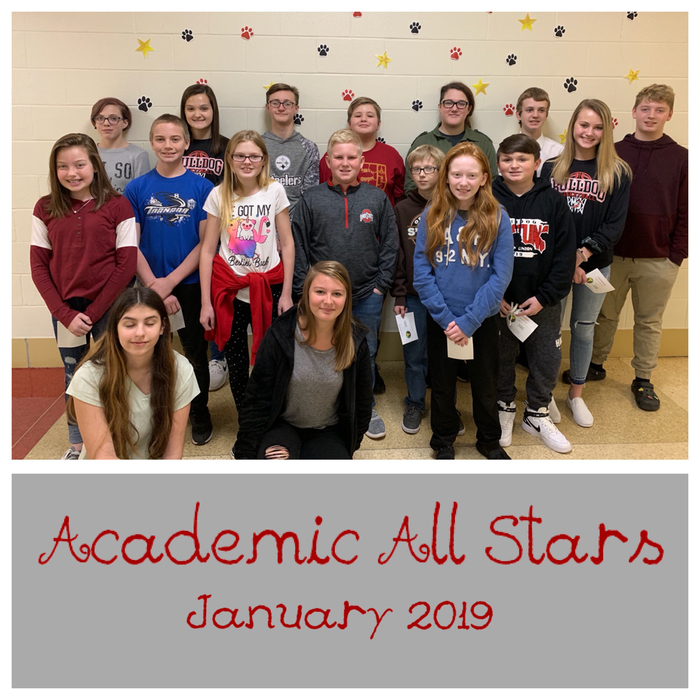 Congratulations to our Academic All Stars nominees this month! 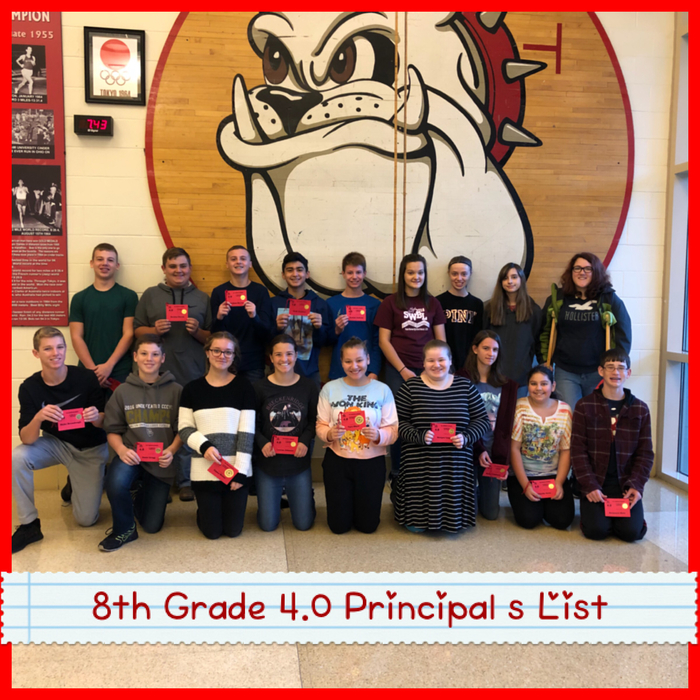 Teachers nominate students for this award, sponsored by The Ohio Lottery, based on academics, responsibility, attitude, leadership, school spirit, citizenship, extracurriculars, and community service. 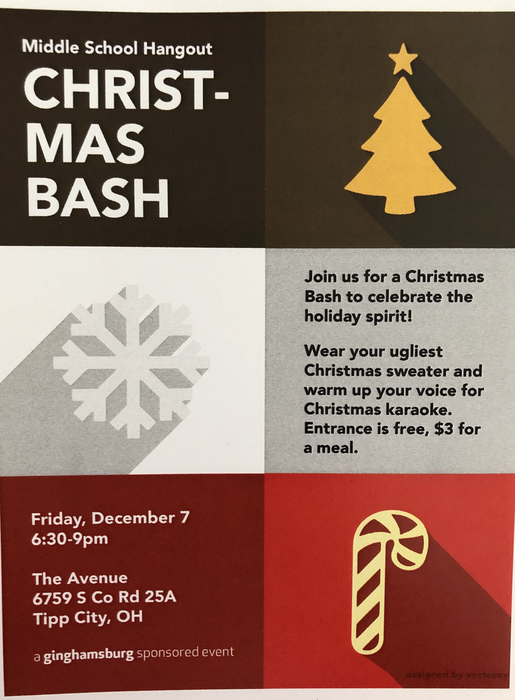 Looking for something fun to do Friday? 2nd Quarter Parent-Teacher Conferences are this coming Monday, December 3rd from 3:00 to 6:30. 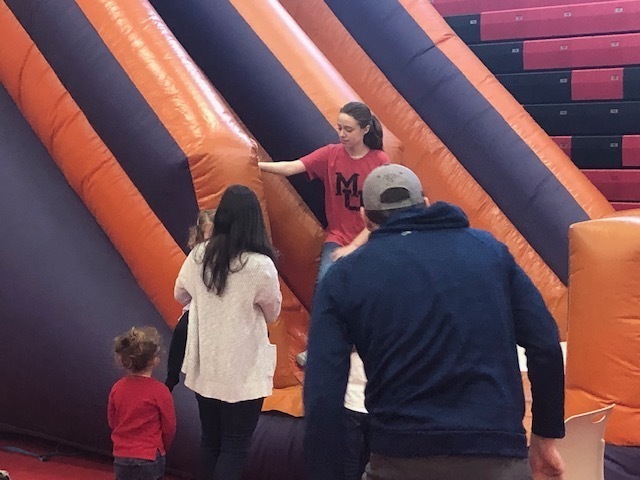 We will have printed midterms for parents to pick up outside the office, and teachers will be available in their rooms for parents to meet with as needed. Hope to see you all there! 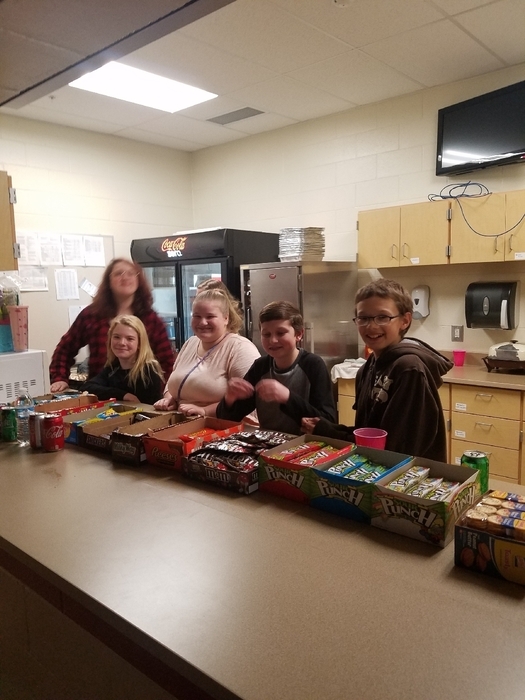 The Science Connections class will soon collect pull tabs from aluminum cans for Tab-a-Pull-ooza, sponsored by Miami County Solid Waste District. Last year 26 pounds were collected, and we'd like to beat that this year! 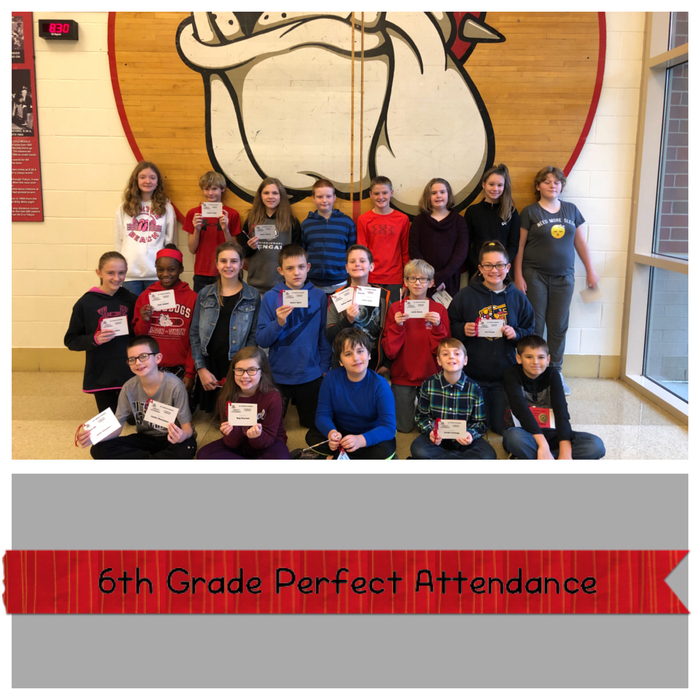 We’re very proud of our 6th graders who had perfect attendance and excellent choices first quarter! 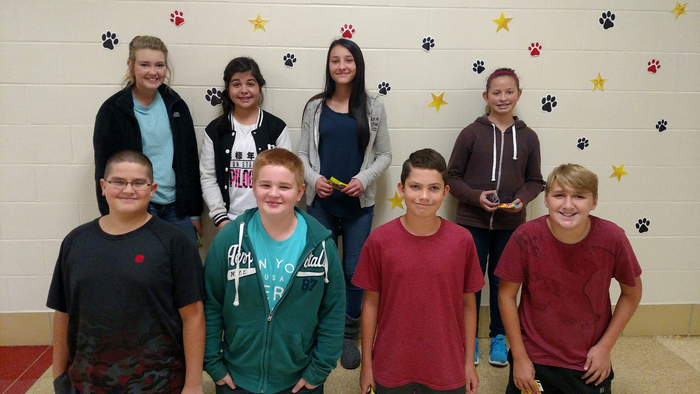 Way to go, 7th Graders with Perfect Attendance 1st Quarter and R-Factor winners! 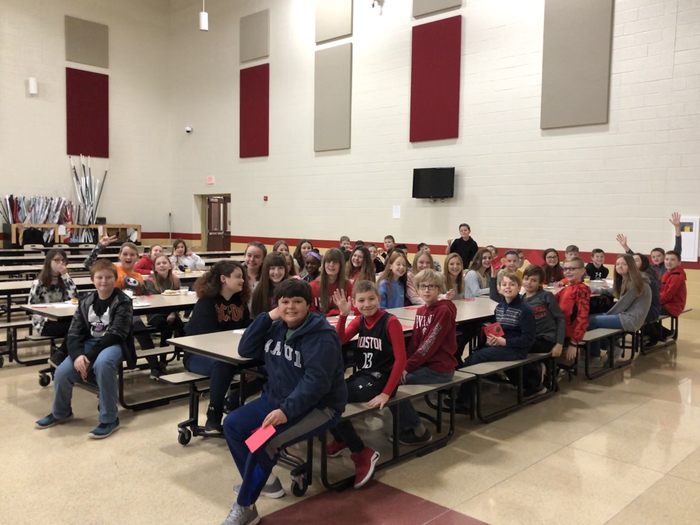 Congratulations to our 7th Graders who earned awards and breakfast for academic excellence! 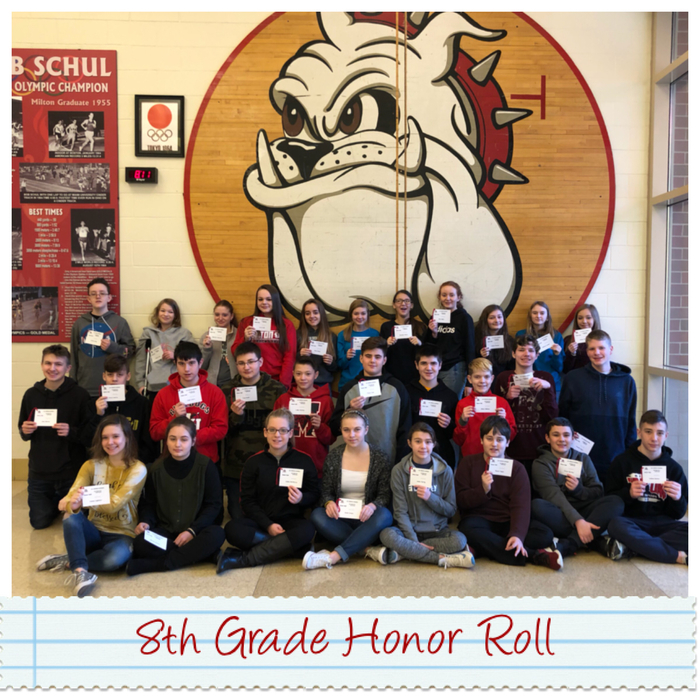 Special congratulations to our 8th Graders who earned straight As first quarter! 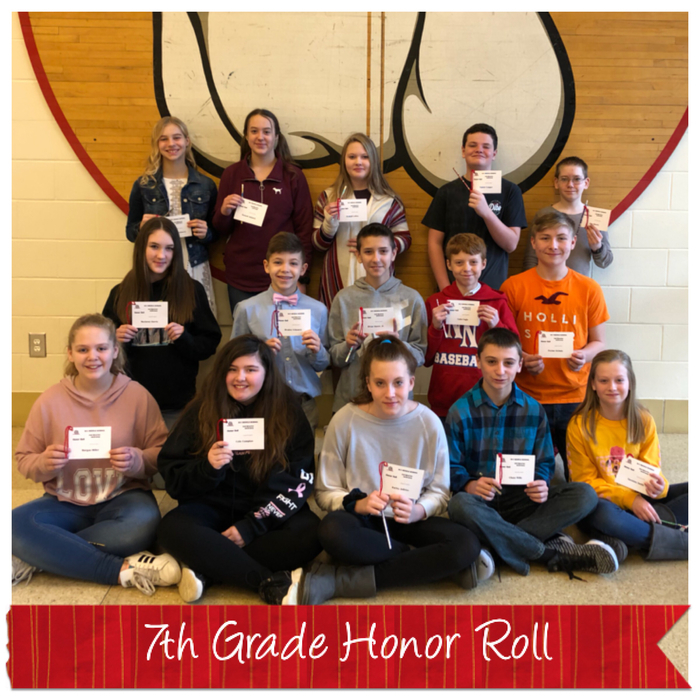 This morning we celebrated the hard work of some of our 8th Grade students with an Honors Breakfast. 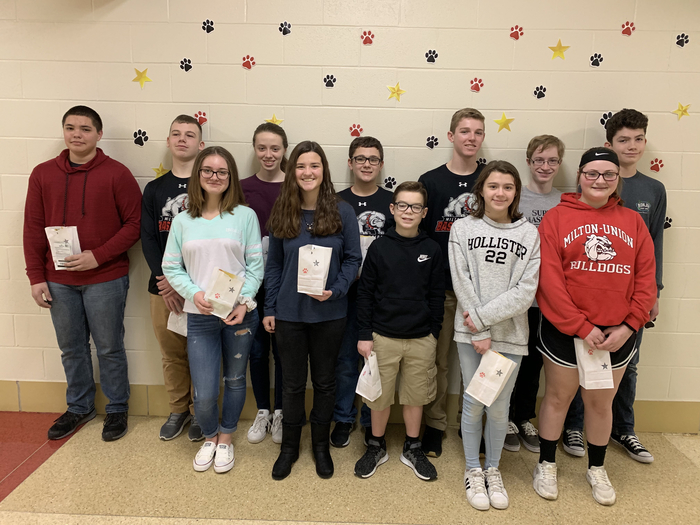 Congratulations to all who earned awards! 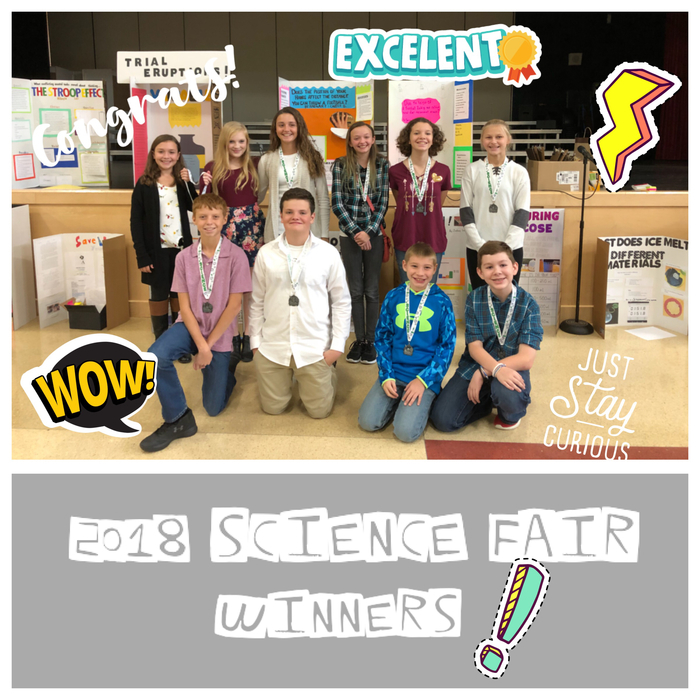 Congratulations to the winners from last Friday’s school science fair! 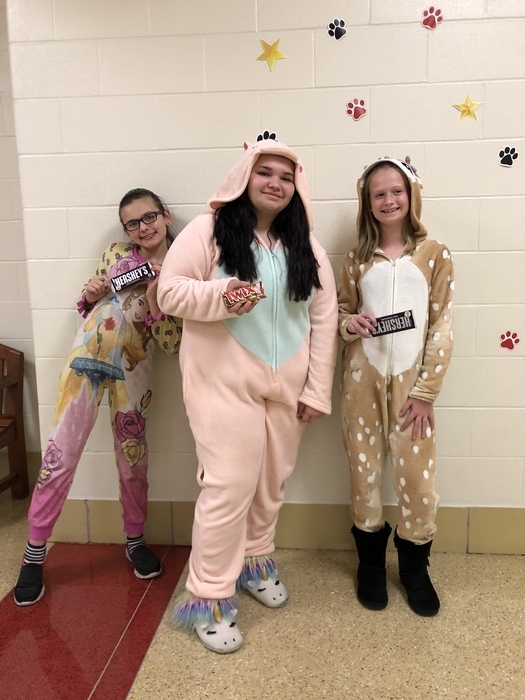 Winners in the Life Science category are: Carly, Alaina, and Mikayla. 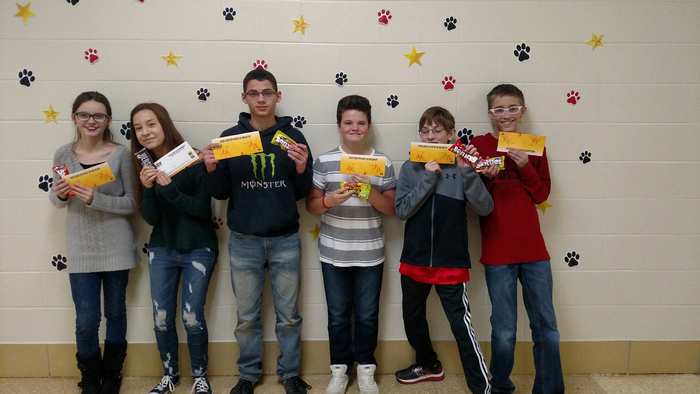 Winners in the Physical Science category are: Haley & Madison, Liam, and Colin & Tanner. 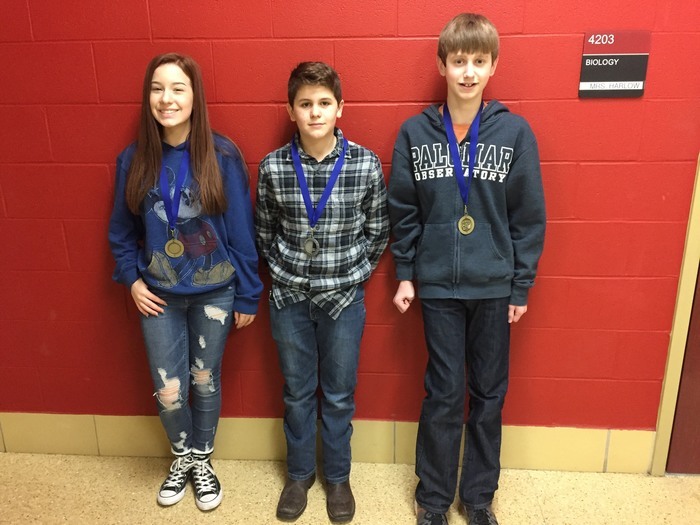 Winners in the Earth and Environmental Science category: Carter & Raegan, Hunter and Bryson. Great job!! 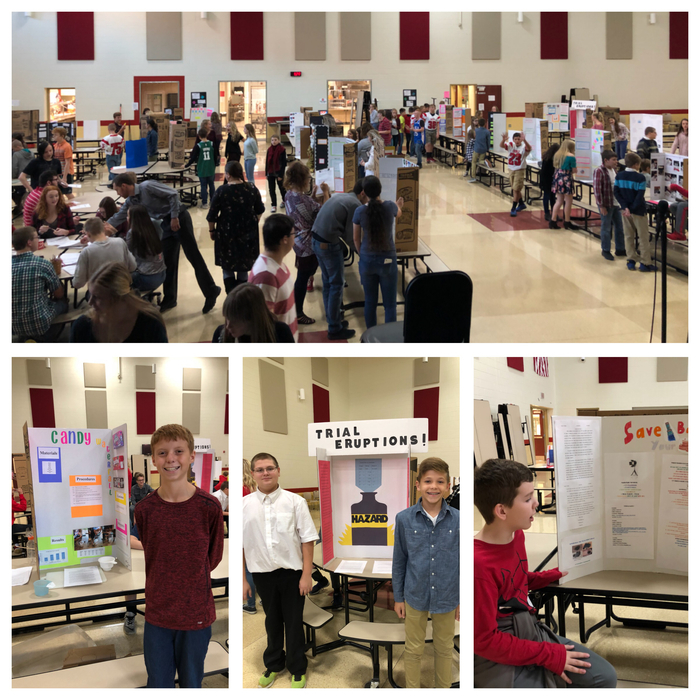 Sorry I’m a day late, but the 7th Grade Science Fair was amazing! 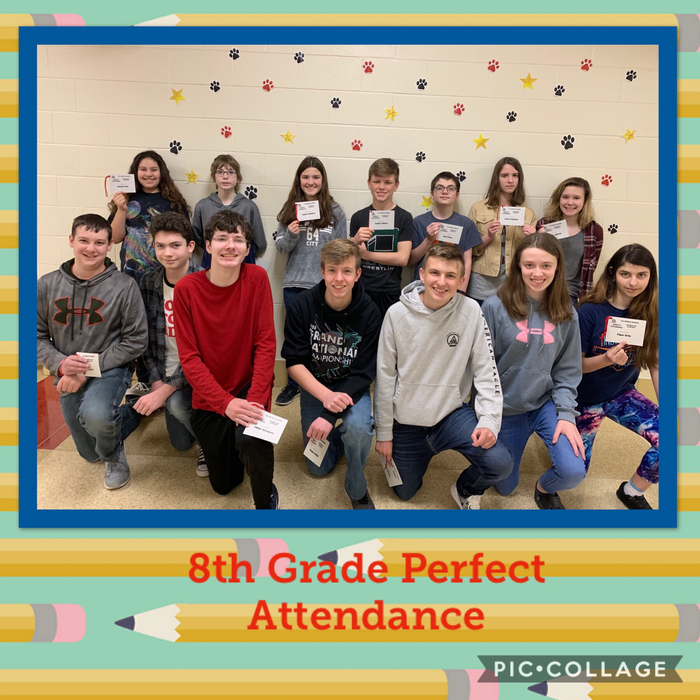 Congratulations to all of our students on their hard work, and thanks to Mrs Kepler for organizing everything, and the high school students for helping judge! Finalists will be judged by outside experts tomorrow morning. Good luck!! 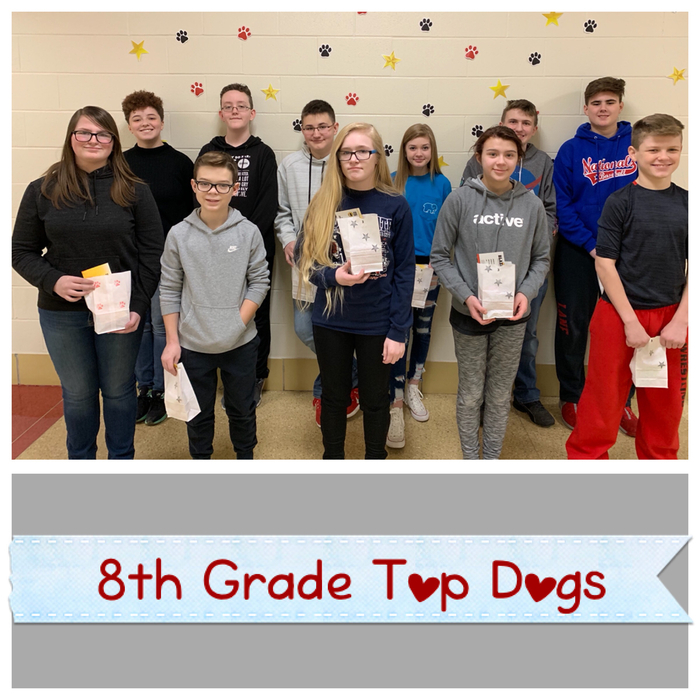 Congratulations to our 8th Grade Top Dogs raffle winners this month! 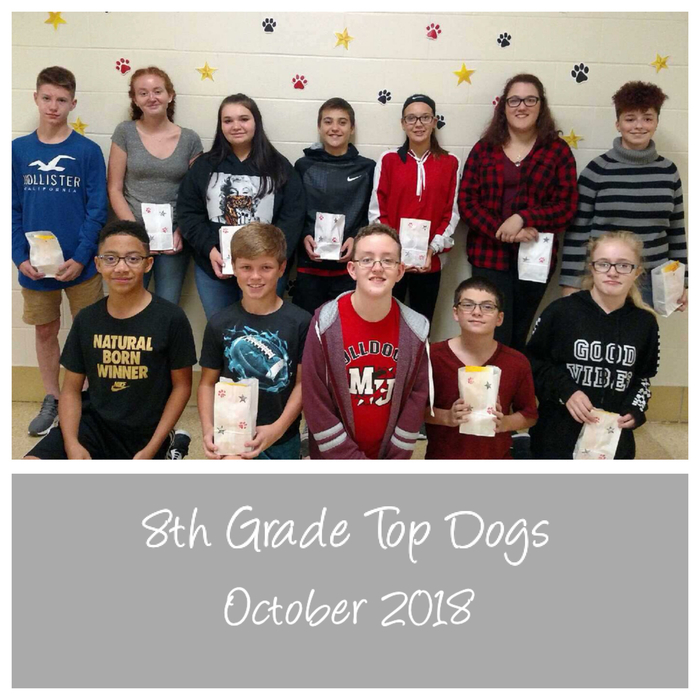 Too Dogs is a monthly raffle we do here at the Middle School to promote good grades, perfect attendance, and good behavior choices. 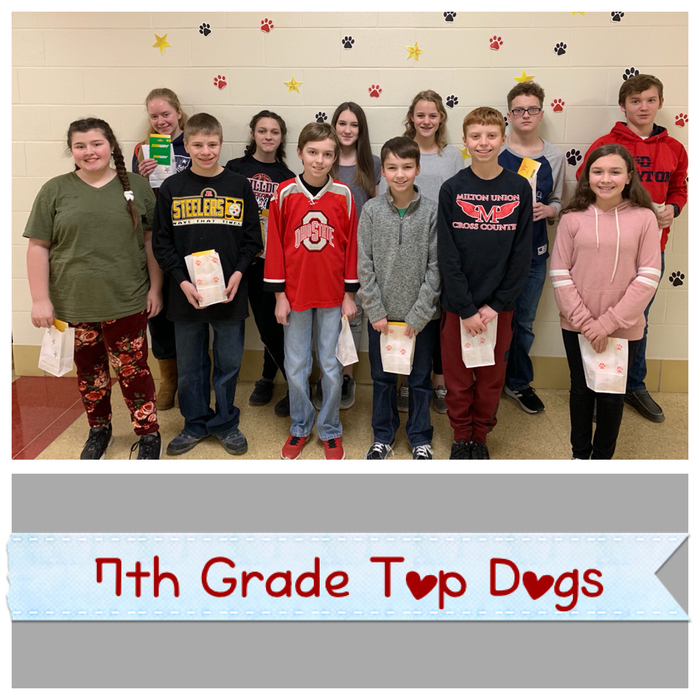 Congratulations to our 7th Grade Top Dogs raffle winners this month! 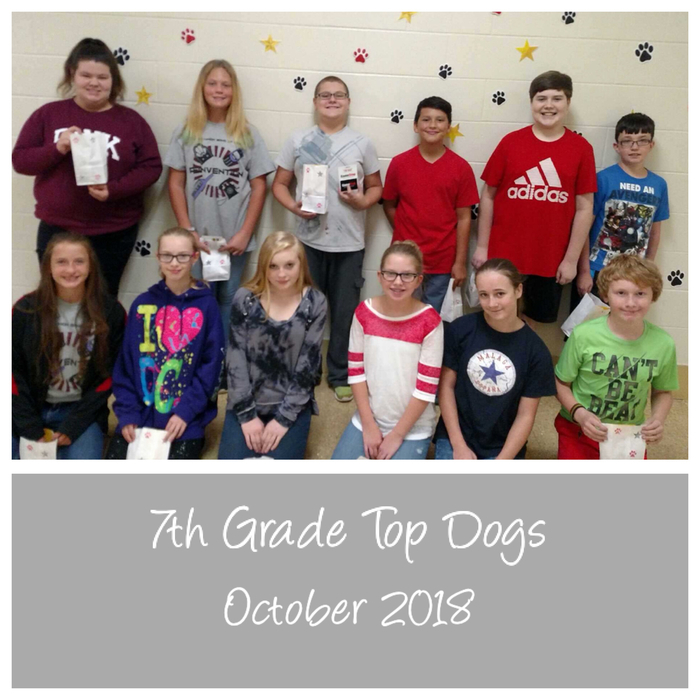 Too Dogs is a monthly raffle we do here at the Middle School to promote good grades, perfect attendance, and good behavior choices. 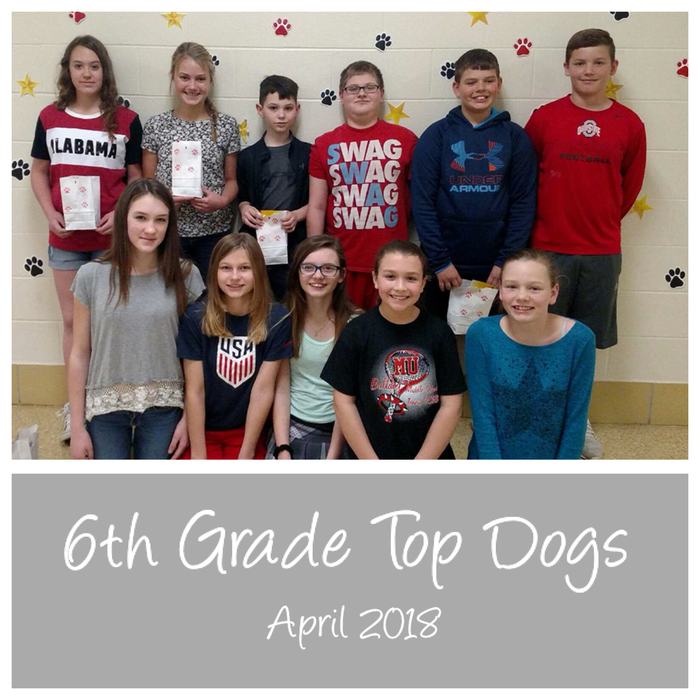 Congratulations to our 6th Grade Top Dogs raffle winners this month! 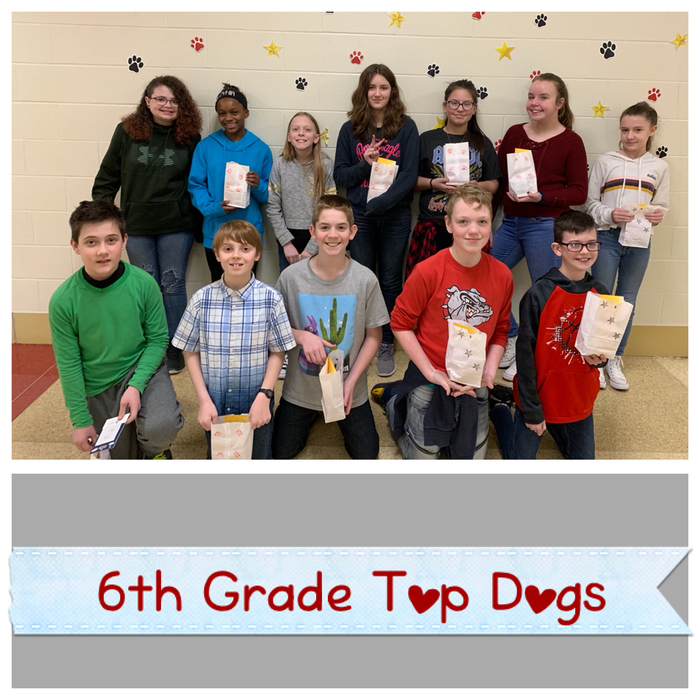 Too Dogs is a monthly raffle we do here at the Middle School to promote good grades, perfect attendance, and good behavior choices. Picture Retake day is tomorrow, October 11th :) Sorry for the late notice! 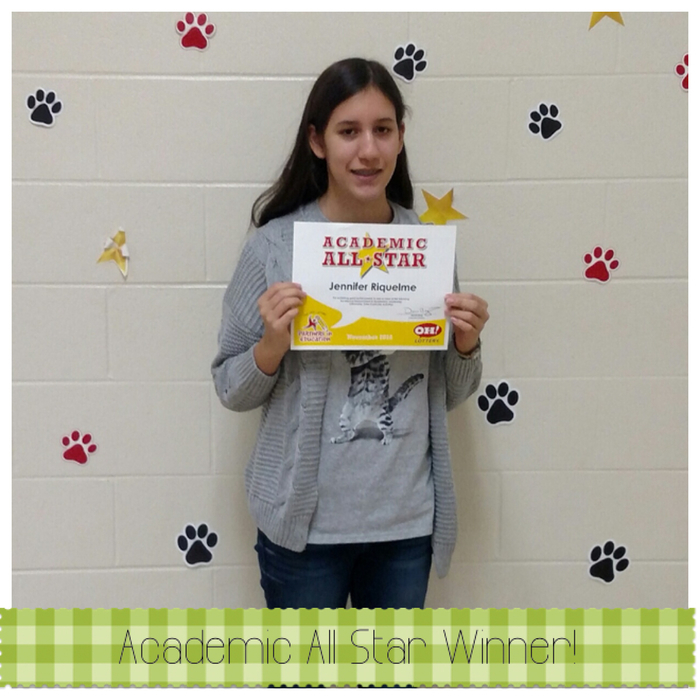 Congratulations to Emma Lightner! 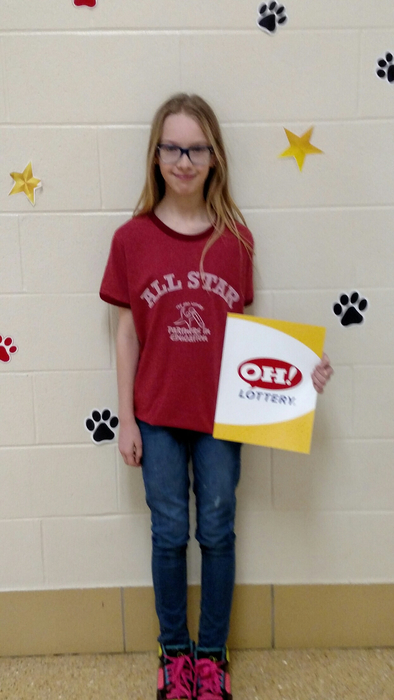 Emma was chosen by the Ohio Lottery as the regional winner this month for the Academic All Stars program! 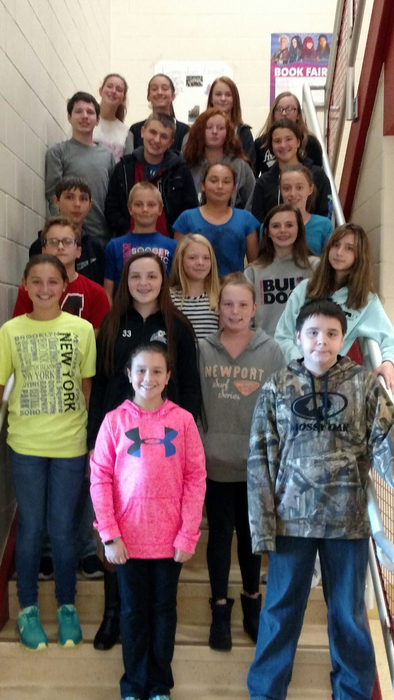 NJHS and Student Council members collected parking fees for the Miami County Invitational Saturday. 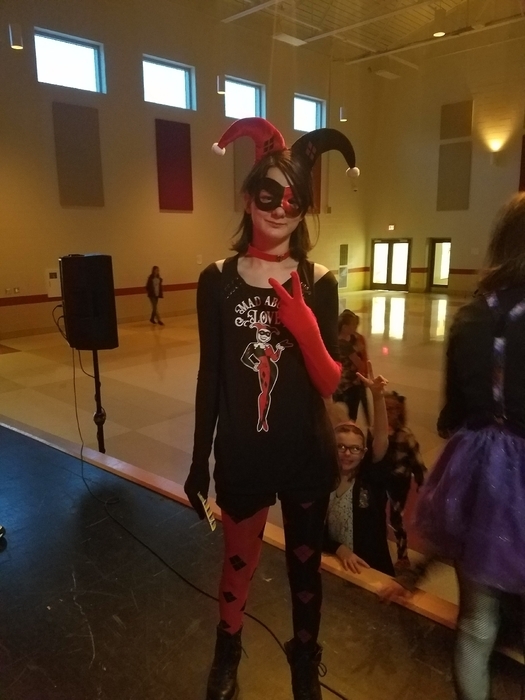 They did a SUPER job! 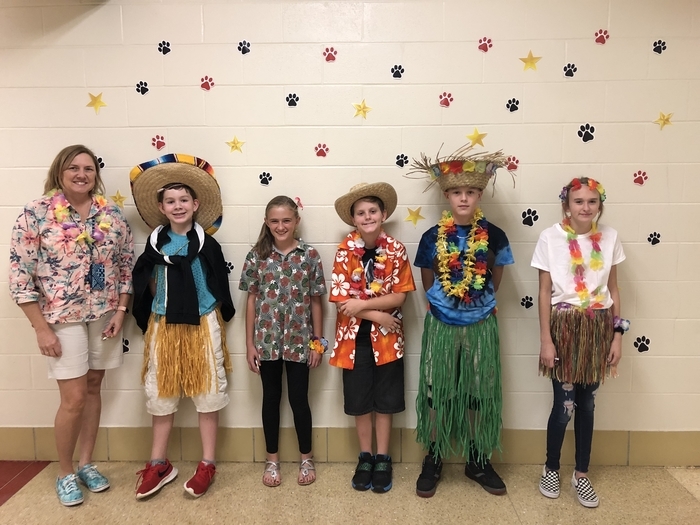 Most spirited winners for Ohana Thursday! 😊 Tomorrow is Mickey and Minnie / Black & Red day! 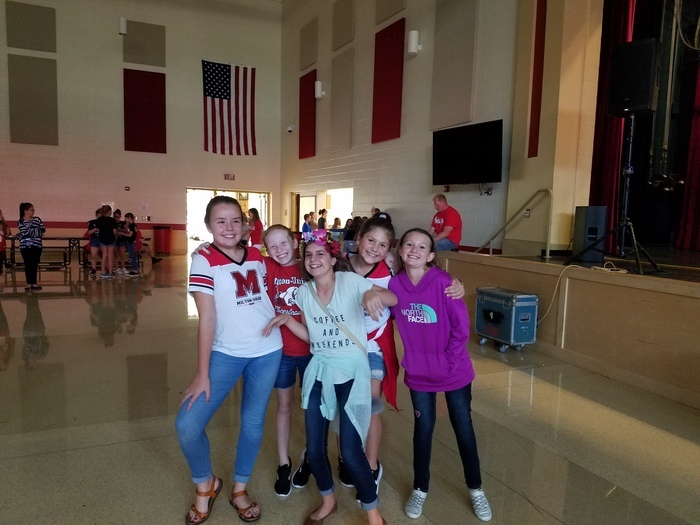 Homecoming week continues! 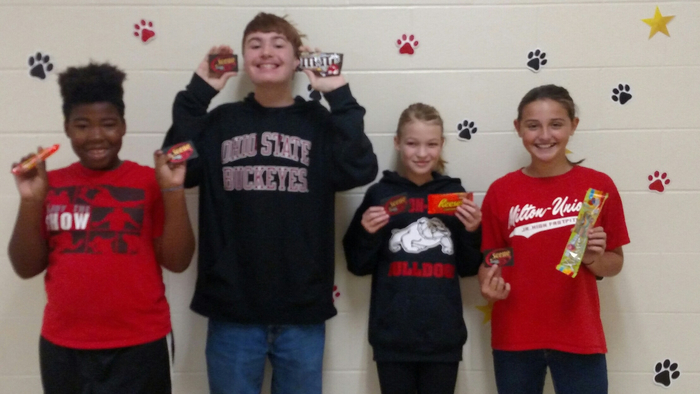 Congrats to today’s school spirit winners! 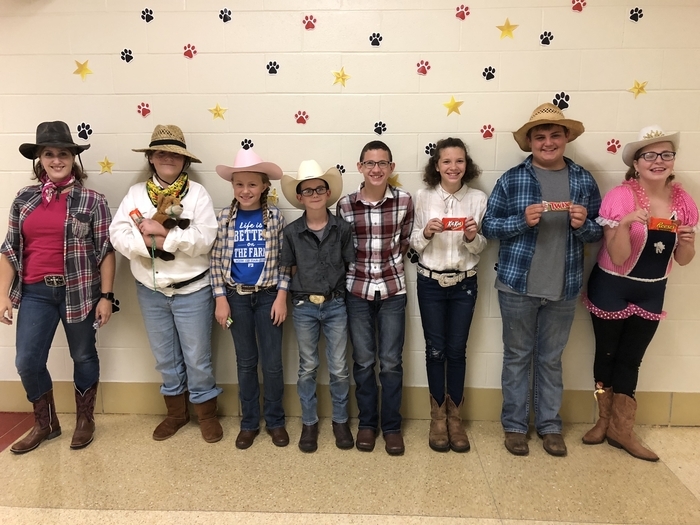 We had a great Woody’s Wild West Wednesday! Sept. 17 - 23rd is National Box Tops for Education Week. The Middle School will collect box tops beginning Monday, Sept. 17th. There will be a contest for the Academic Assist class that collects the most by October 12th. 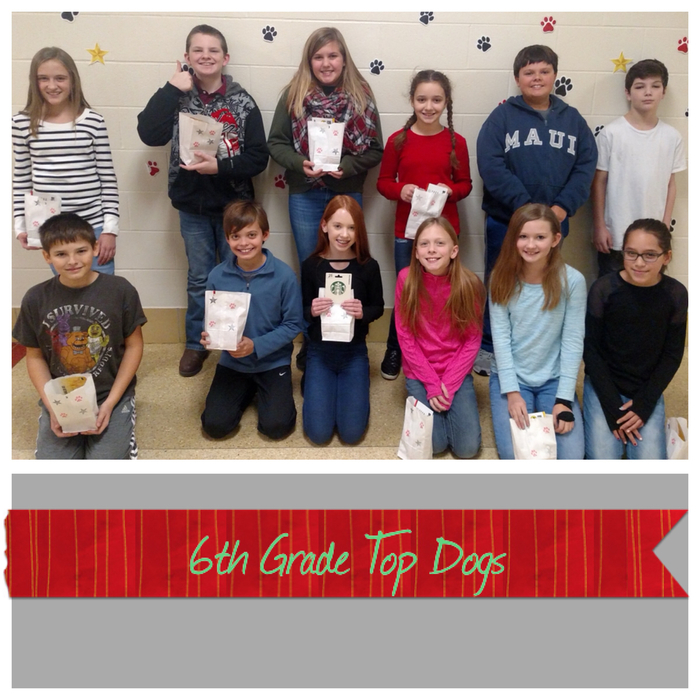 Cut or tear Box Tops off of participating product packages and turn them in to school. Each Box Tops clip must have a visible product acronym and expiration date. Please do not send in expired Box Tops. Each valid Box Tops clip is worth 10 cents for our school. 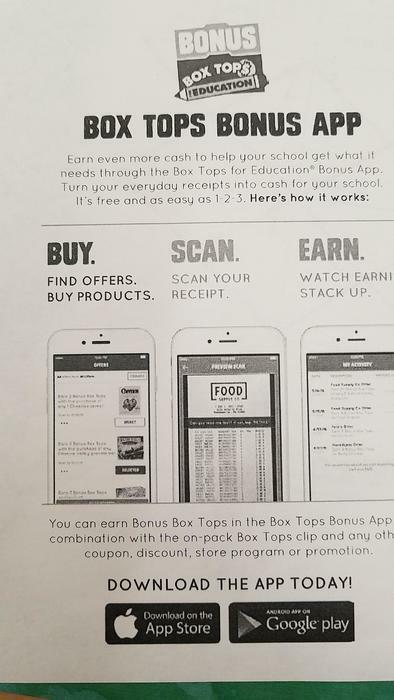 Also, turn your everyday receipts into cash for our school by downloading the Box Tops Bonus App and scanning your receipt. 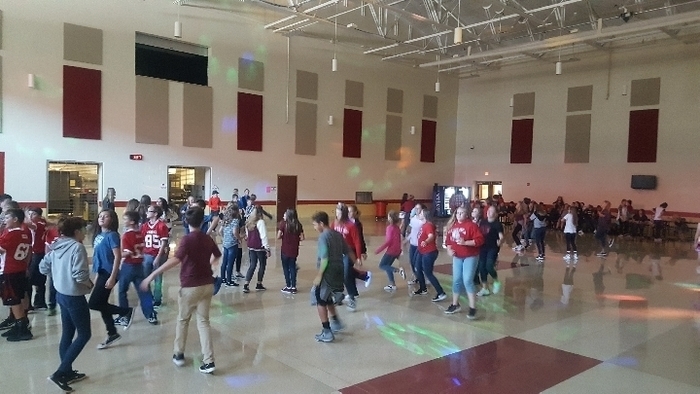 Our back-to-school Middle School dance was a huge success! 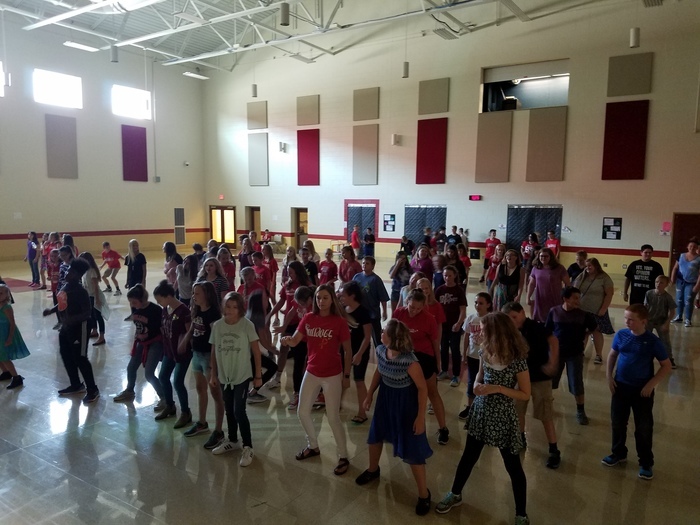 Watch for dates for upcoming dances. 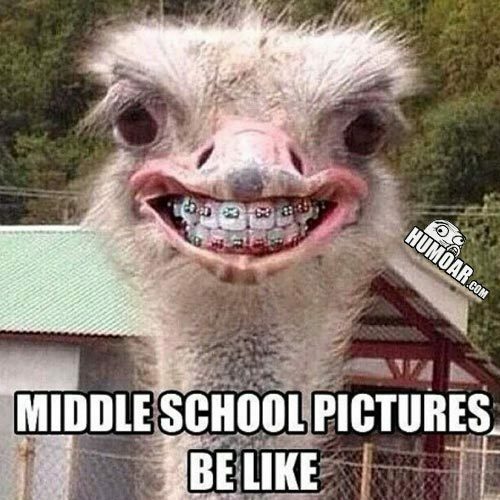 Middle School picture day will be next Wednesday, September 5th. :) All students were given order envelopes last Friday. Extra envelopes are available in the office. 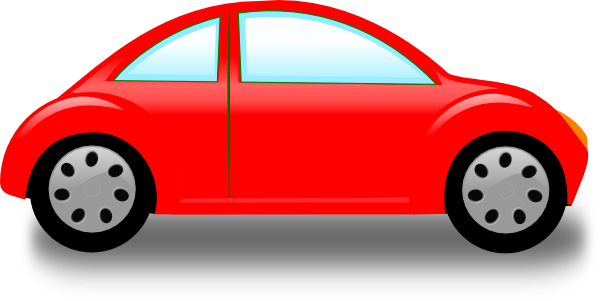 This is just a reminder that there is a parent/student meeting tonight at 7:00 in the cafeteria for device handout. If you are unable to make it tonight, paperwork will be sent home the first week of school. Also, the MS office is open to pay fees and pick up schedules today and tomorrow from 8-2, as well as this evening from 5-7. See you soon! Important Dates & Times for August: The following information was included in a letter mailed to all students this week. 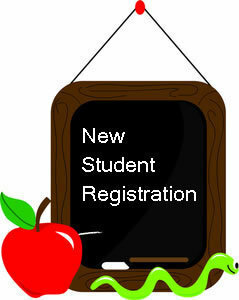 :) The week of August 6th – 10th will be new student registration for the middle school. 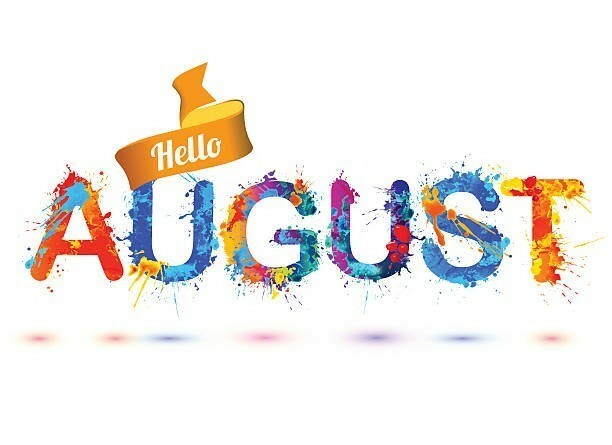 If you know of any new students who have moved to the area over the summer, please let them know to stop in the office between 8:00 and 2:00 any day that week to complete enrollment paperwork. 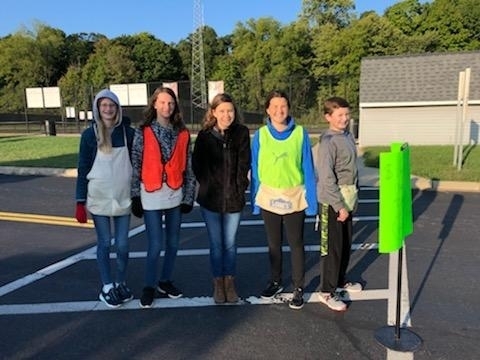 Students and parents will be able to stop in any time between 8:00 and 2:00 the week of August 13th – 17th to pay school fees, pick up their schedule for the year, and can access the building to find their classrooms and practice opening their lockers. 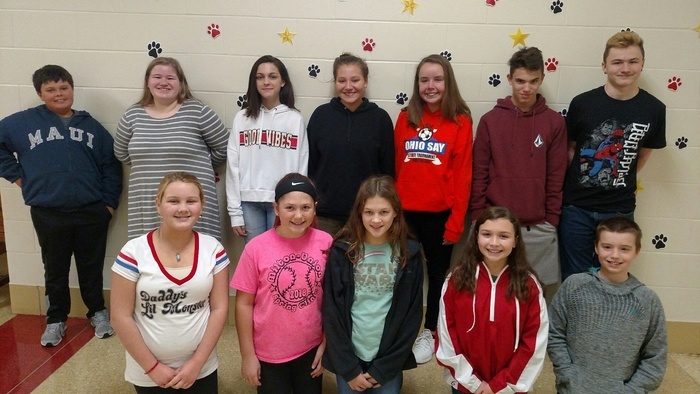 We will have student volunteers here all week that week from our National Junior Honor Society who will be able to help any new students finding rooms or answer questions about the middle school. 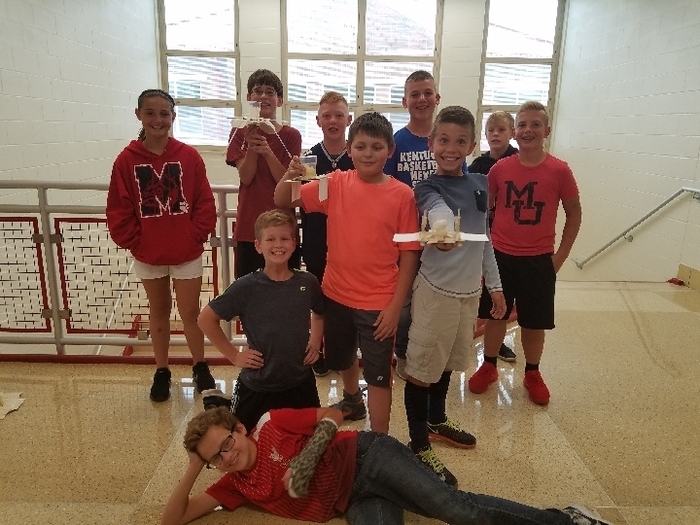  In addition to these days, the middle school office will also be open Thursday, August 16th from 5:00 to 7:00 pm to accommodate parents who are unable to make it in during the day. 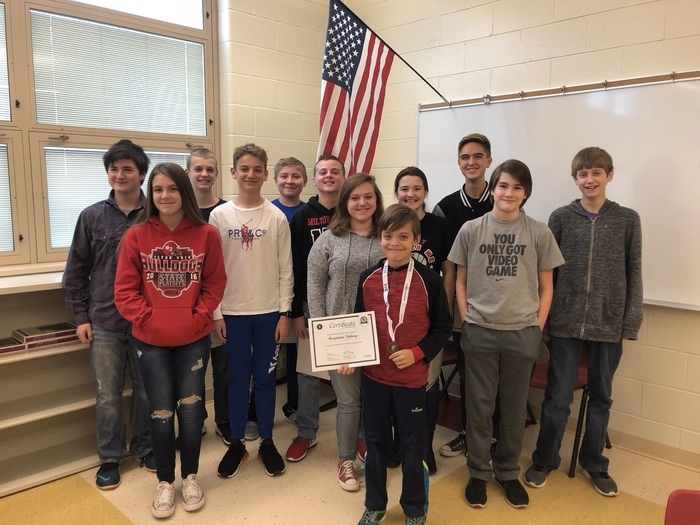 As we are a One-To-One school district, all middle school students will be issued a school-owned laptop for their use during the school year. There are two opportunities for students and parents to learn about and receive the devices before school starts. 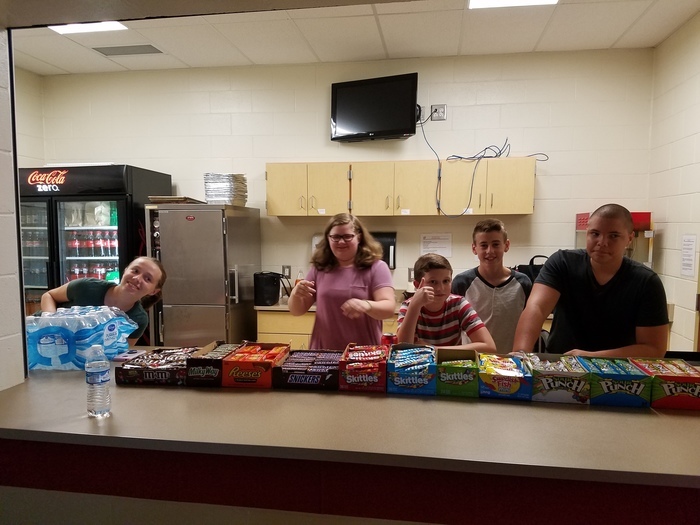 We are having meetings from 7 – 8 pm on Tuesday, August 14th and Thursday, August 16th in the cafeteria. You don’t need to attend both, as they are the same meeting being held twice for families’ convenience. 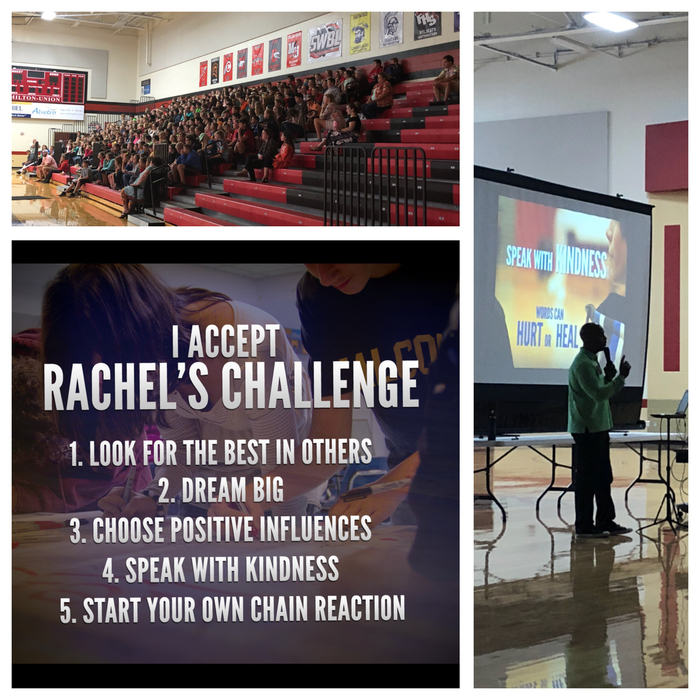 At these meetings, we will introduce some of the R-Factor skills we will be working on this year across the district, as well as discuss the laptops students will be using. Parents do need to be present and sign the consent form for students to receive their laptop. Lastly, we will have our district Open House on Monday, August 20th from 5 – 7 pm. This is a great opportunity to meet the teachers, view completed classrooms, and have any questions you have answered. 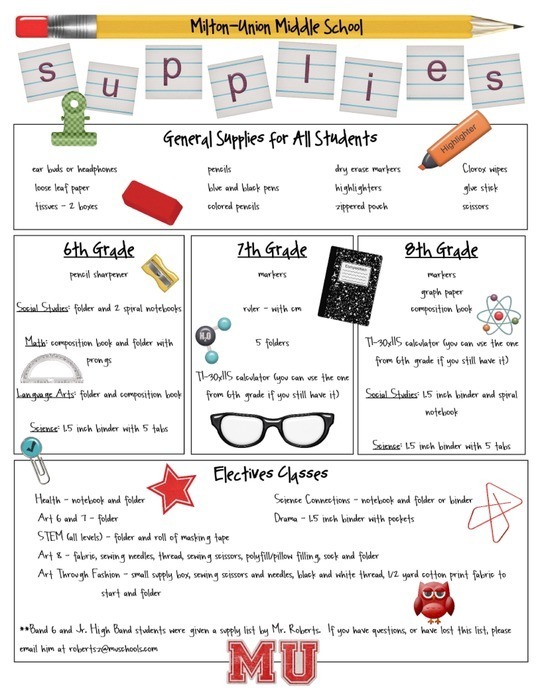 Students often like to bring some or all of their supplies that evening to avoid having to carry so many items with them on the first day. If you wish to do this, simply put your name on your supplies and items, and leave them in your first period teacher’s classroom. 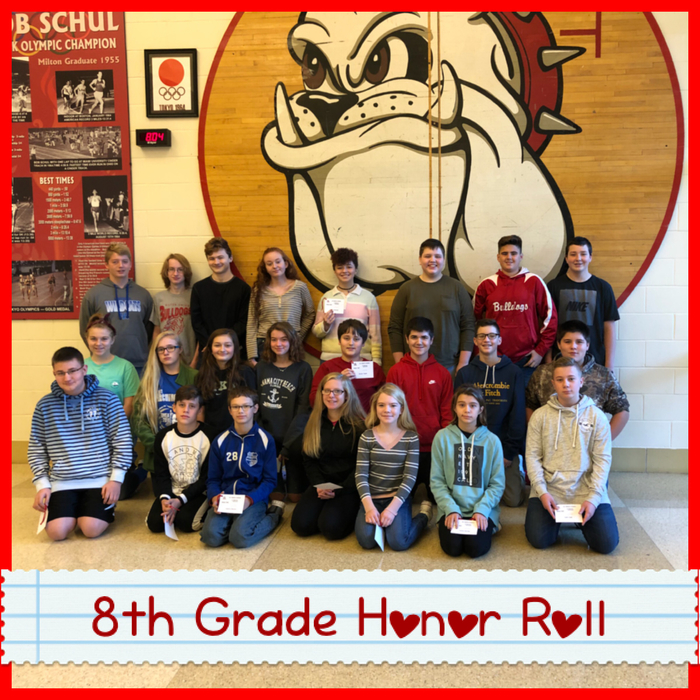 Attention 8th Grade families: please enter the athletic entrance tomorrow morning between 8:00 and 8:20 for the promotion ceremony. Thanks! 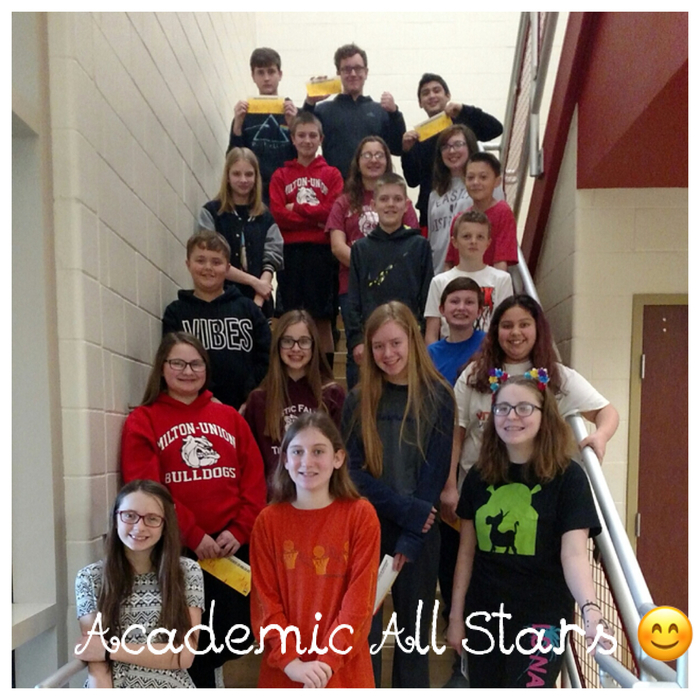 Congratulations to our final group of Academic All Stars nominees for the year! Kona Ice will be at Field Day tomorrow!! 😁 Prices are $3, $4, $5 or $6. Bring your Kona cup if you have one for a discount! On Tuesday, May 29th, all middle school students will be turning in their school device, charger and stylus. Please make sure that you have all three of these items with you on that day. If you have lost your charger, they are $20 to replace. If you have lost your stylus, they are $40 to replace. Thanks! 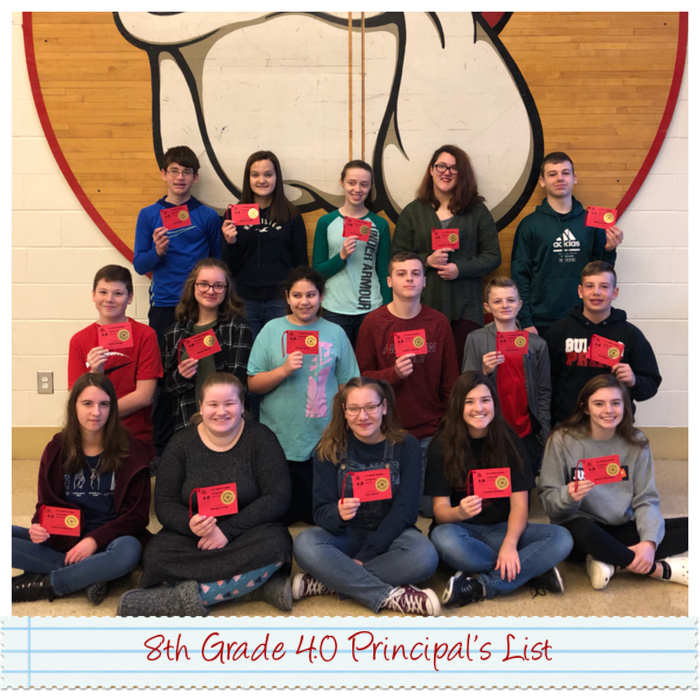 New National Junior Honor Society members of 2018-2019 school year will be selected by the end of the school year. 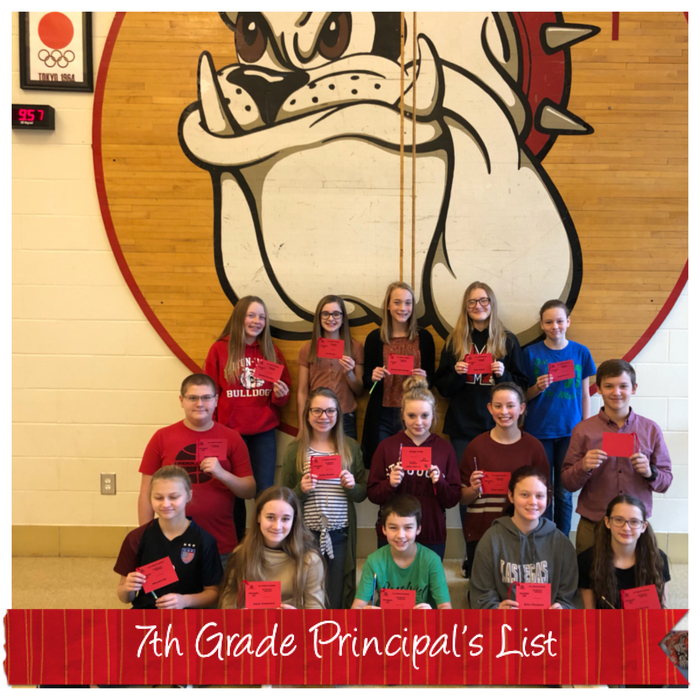 Current 7th graders with a cumulative GPA for second semester are eligible. Paperwork will be available in the office soon. 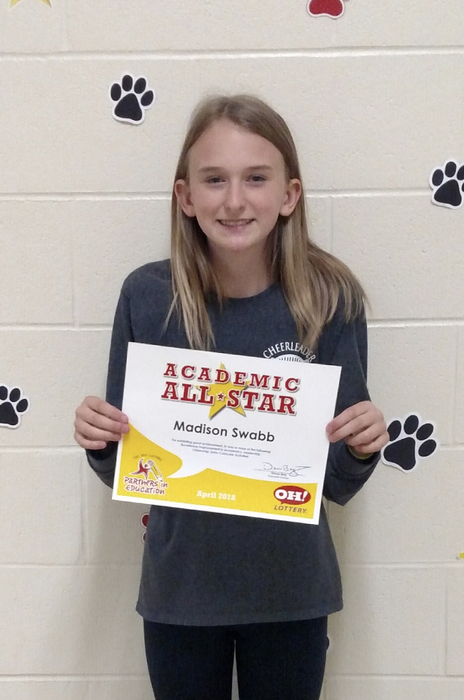 Congratulations to Madison Swabb! 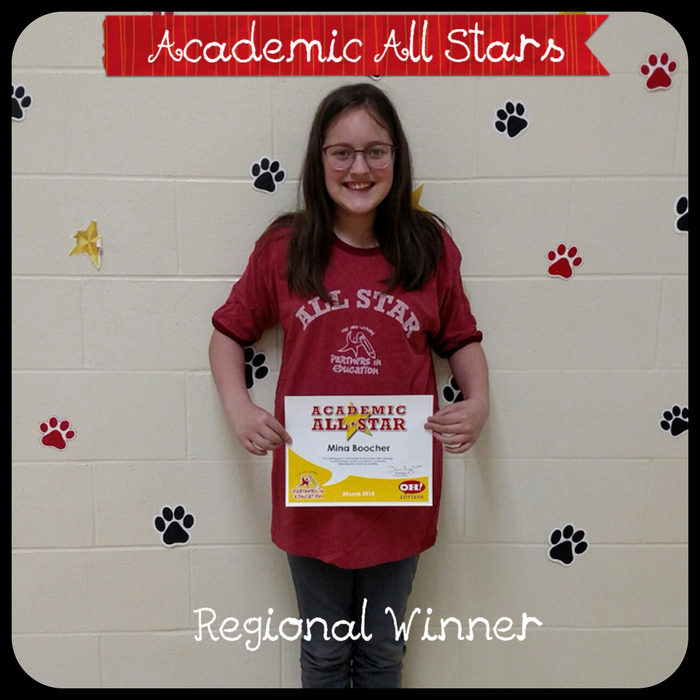 She was chosen as the regional Academic All Stars winner this month! 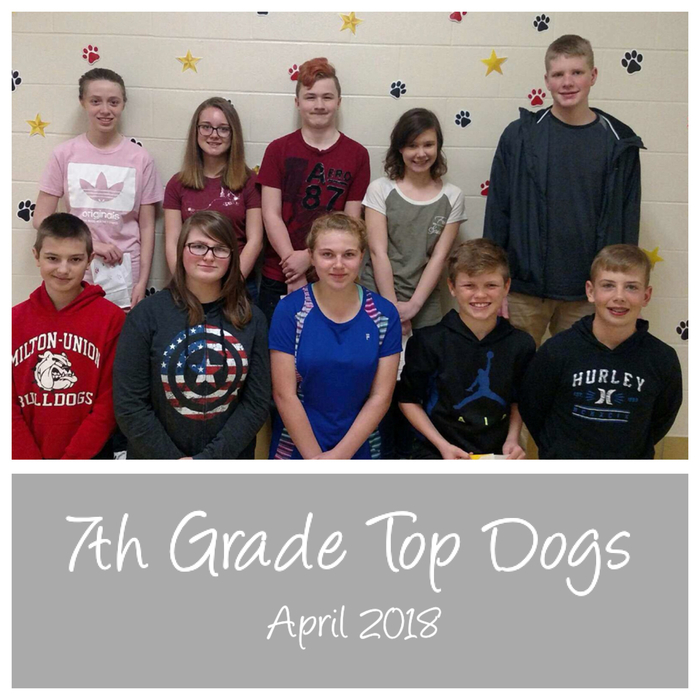 Top Dogs winners were drawn fir this month. Students earn raffle tickets for this drawing by having good grades, perfect attendance, or no behavior issues. 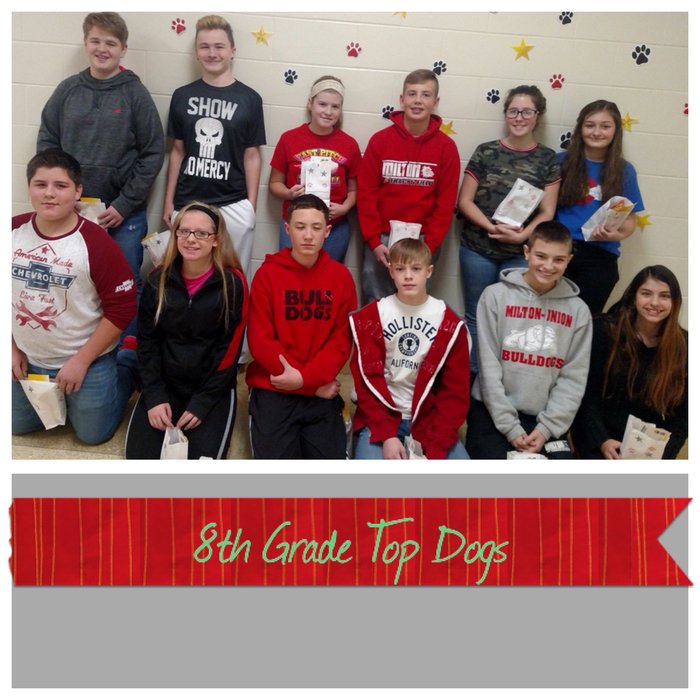 Congrats to this month’s 8th grade winners! 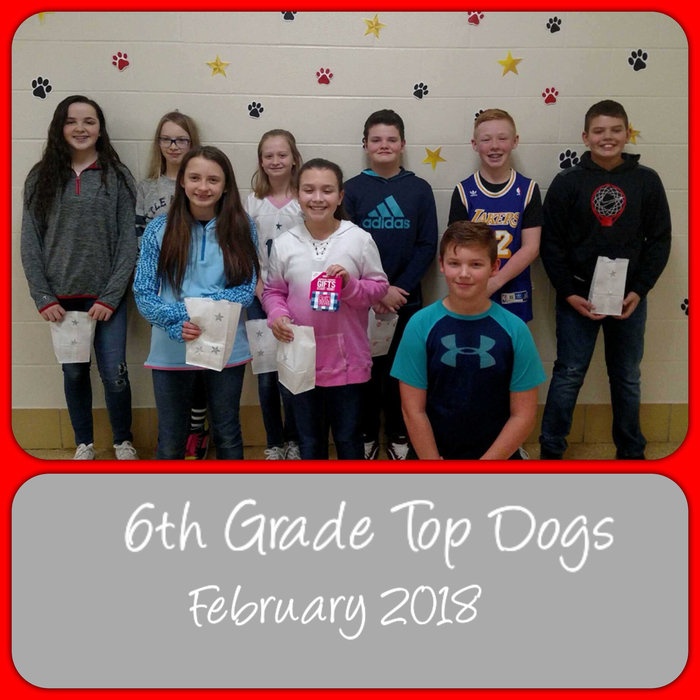 Top Dogs winners were drawn fir this month. Students earn raffle tickets for this drawing by having good grades, perfect attendance, or no behavior issues. 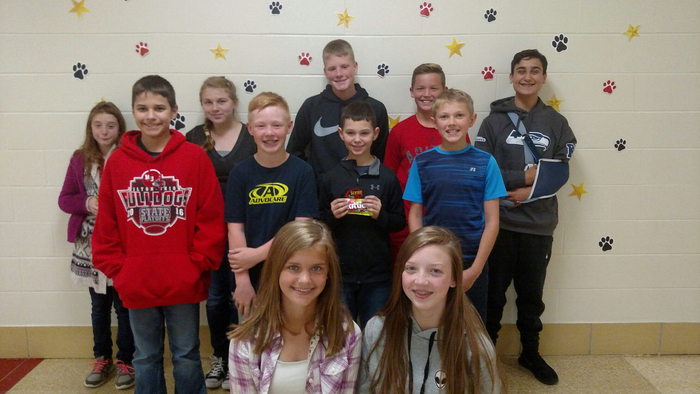 Congrats to this month’s 7th grade winners! 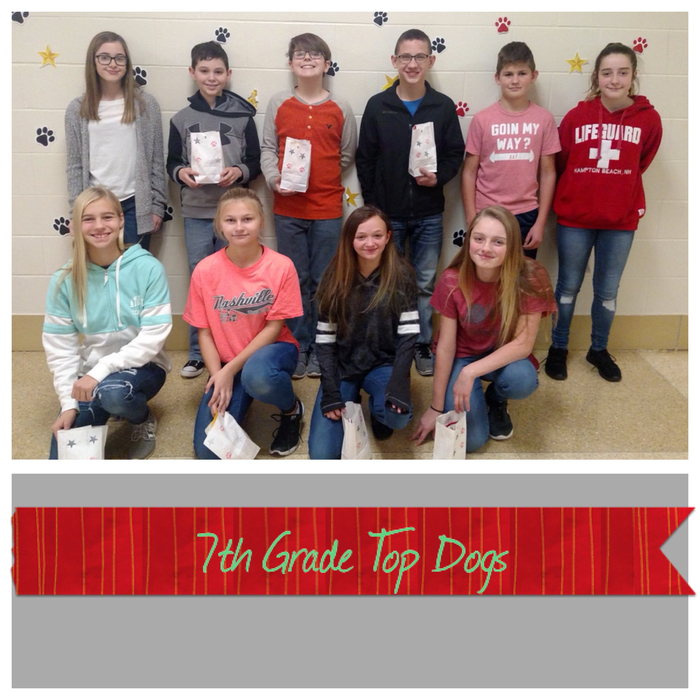 Top Dogs winners were drawn fir this month. Students earn raffle tickets for this drawing by having good grades, perfect attendance, or no behavior issues. 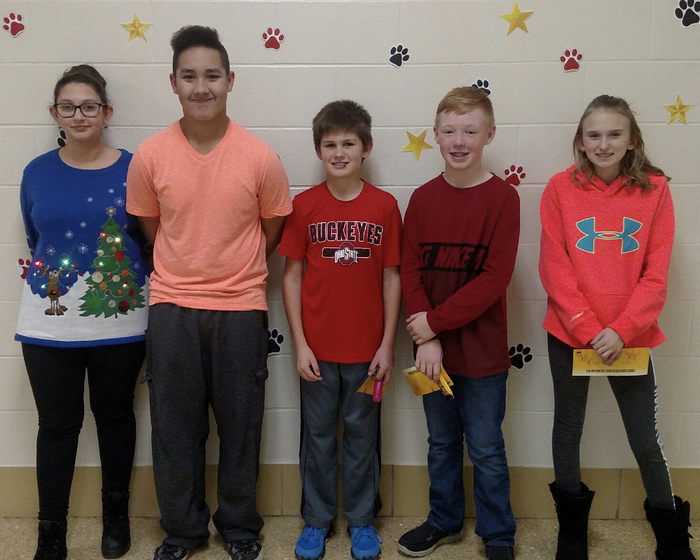 Congrats to this month’s 6th grade winners! 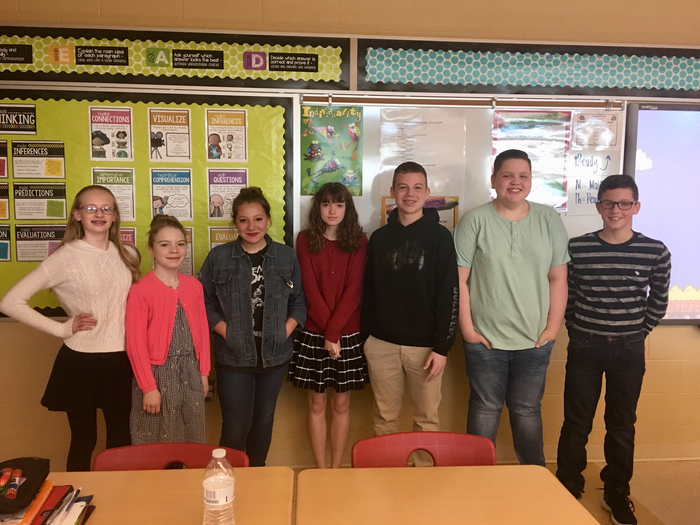 The best laid plans..... 😊 Due to a problem with Ohio’s state testing website, some of our middle schoolers were able to take part 1 of their language arts test today, and some weren’t. We will work to remedy this without disrupting students’ normal schedules. Thanks! 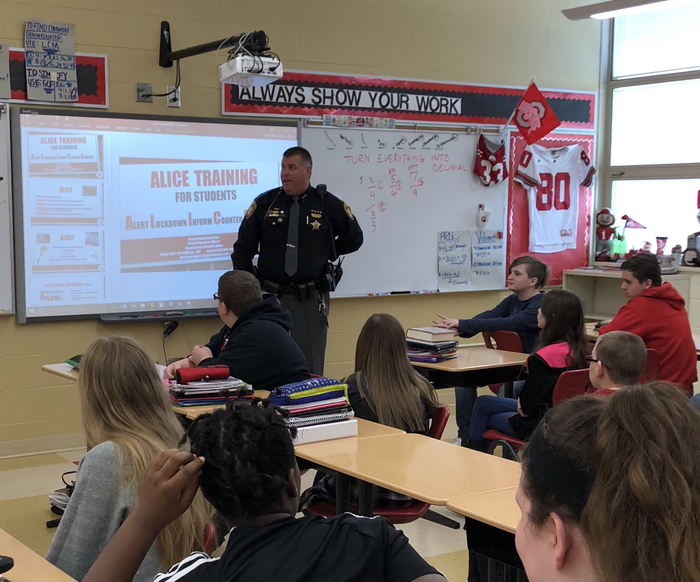 Our School Resource Officer, Deputy Davidson, taught lessons to all of our 6th graders today about what to do if there is an intruder in our school. Please ask your child about this very important lesson. 7th and 8th graders will also have this lesson this week. Feel free to contact the office if you have any questions for Deputy Davidson. 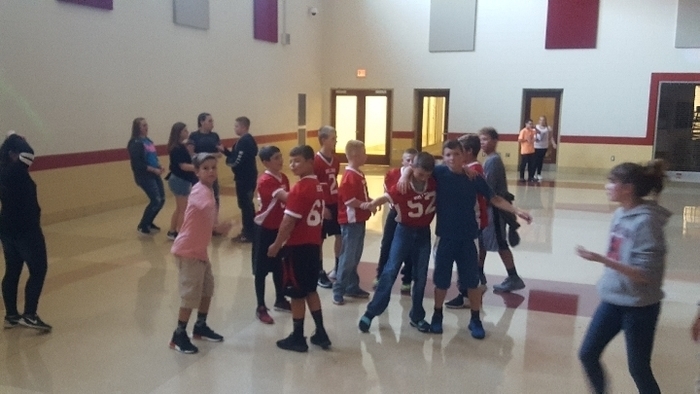 Students in Miss Adkins’ language arts classes have recently read the book The Outsiders. 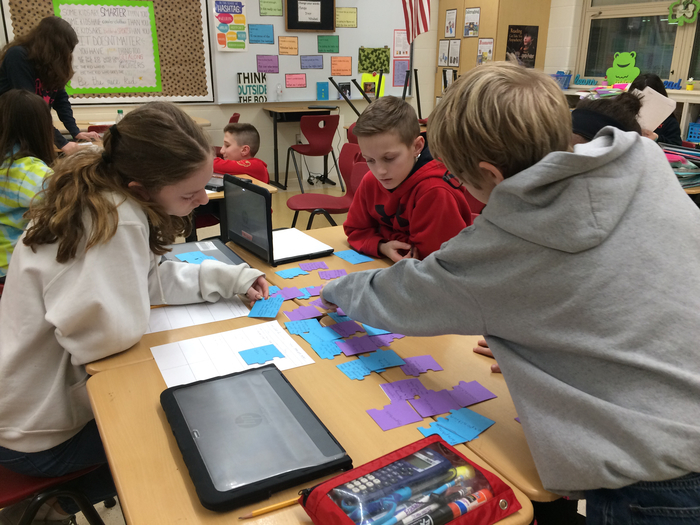 Check out some of their cool projects and responses to the literature! 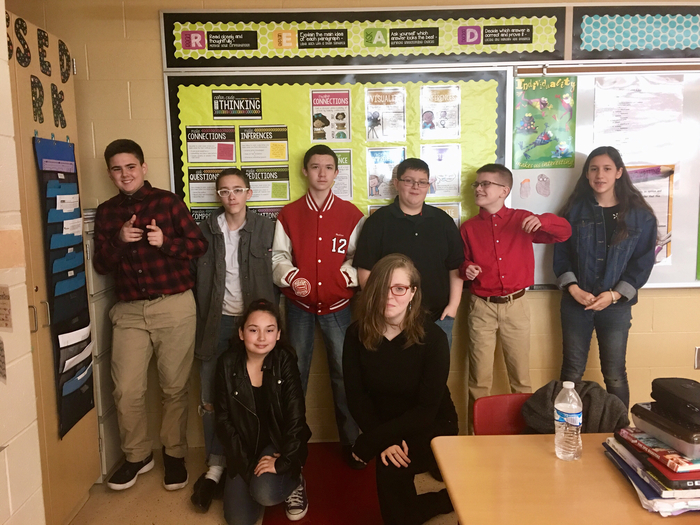 Students prepare for their presentations dressed as Greasers and Socs from the novel. 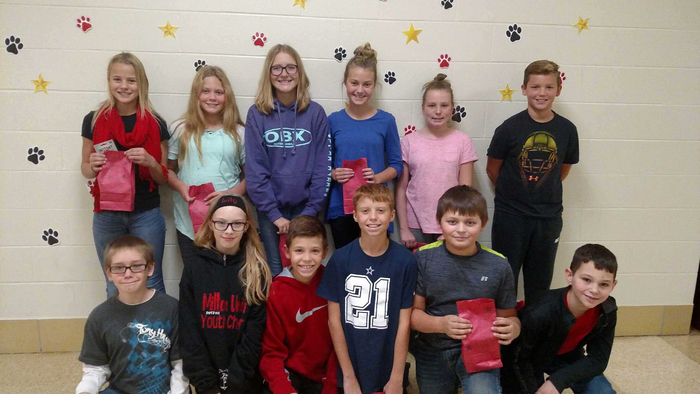 Students in Miss Adkins’ language arts classes have recently read the book The Outsiders. 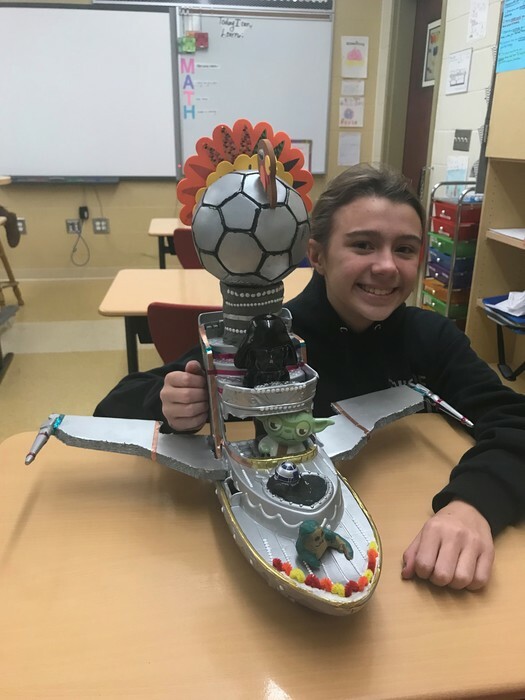 Check out some of their cool projects and responses to the literature! 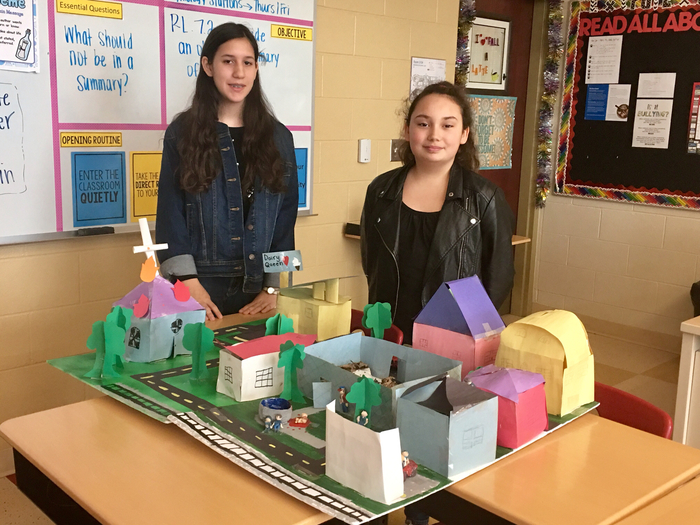 After reading the novel, The Outsiders, Malaysee and Jennifer created a 3D model for their project. 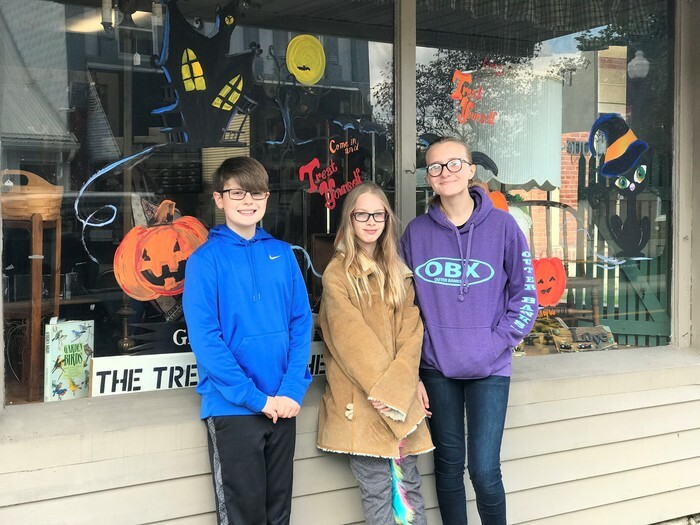 Their model was complete with several scenes from the novel, handmade clay figures, and a drive in showing “The Outsiders” movie. 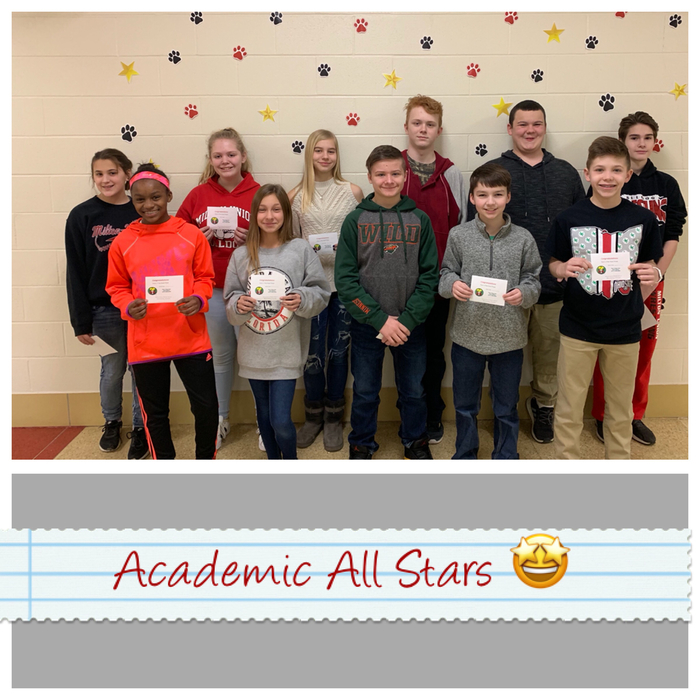 Congrats to these kiddos who were nominated for the Academic All Stars by their teachers! Crazy Sock Day is Wednesday March 21st. Wear your craziest socks to support World Down Syndrome Day! 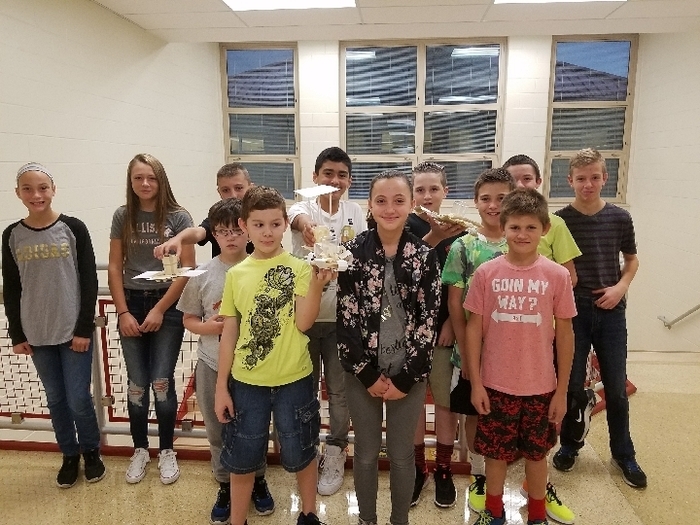 8th graders in Mr. Kinninger's science classes all participated in a Balloon Vehicle Challenge. 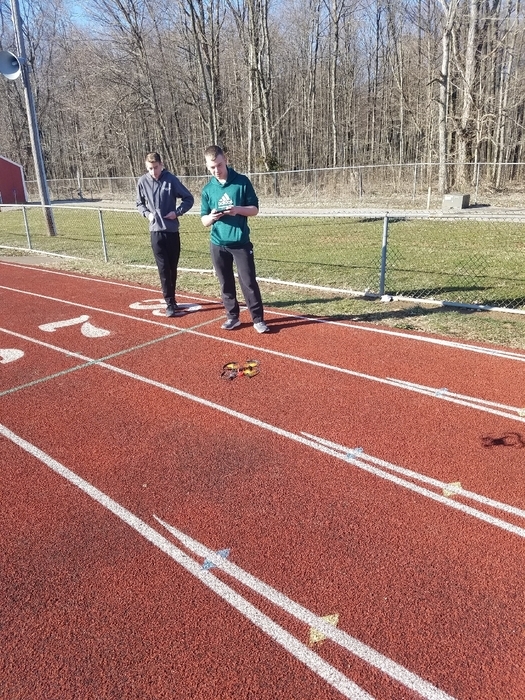 Huge congratulations to the winners: Nik Brown (27 meters 70 cm), Xiera Younce (24 meters 45 cm), and Jacob Lauber (19 meters 12 cm)! 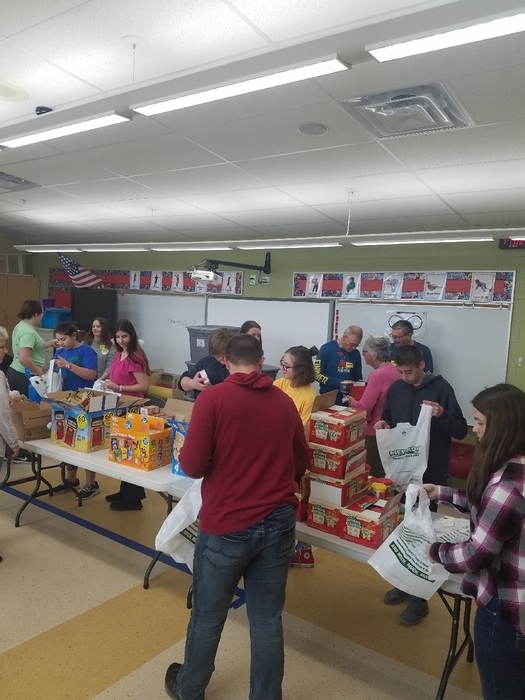 The National Junior Honor Society is sponsoring a food drive. 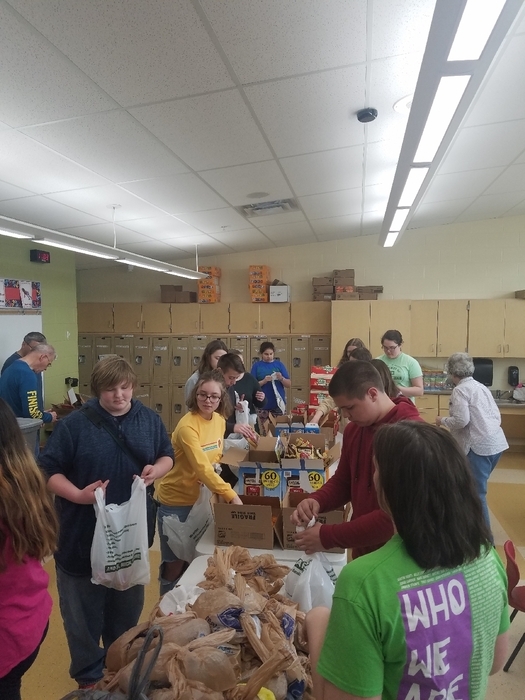 Canned and boxed goods can be dropped off March 19 through March 29th. 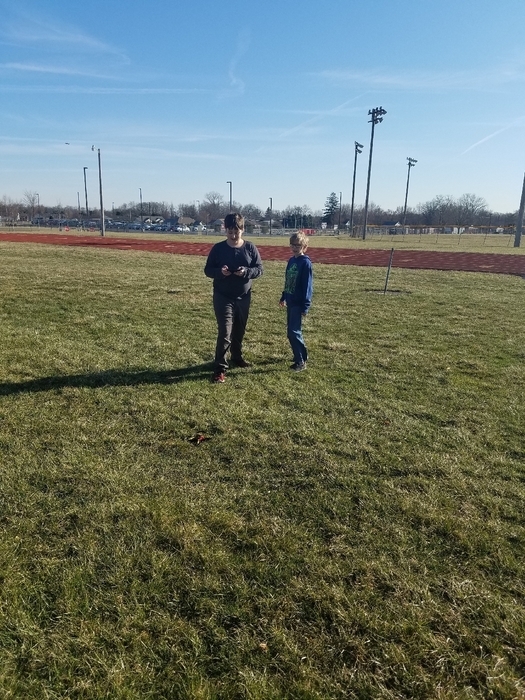 On Wednesday, March 14th, students at Milton-Union Middle School will explore positive and proactive ways to make their world a better place. There have been movements and suggestions across the country for a student walk-out based on the recent school shooting in Florida. 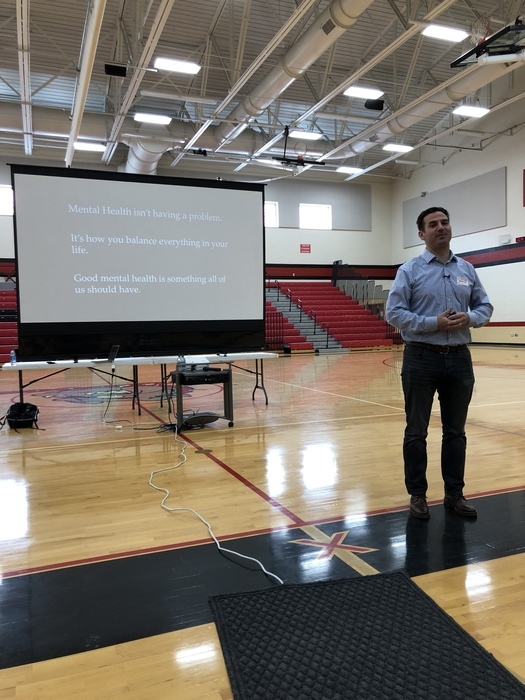 The teachers and I feel that this is not safe and may not send the right message to our students and community. Instead, we are going to offer them suggestions for ways that they can act to help make their voices heard, and their world a better place. 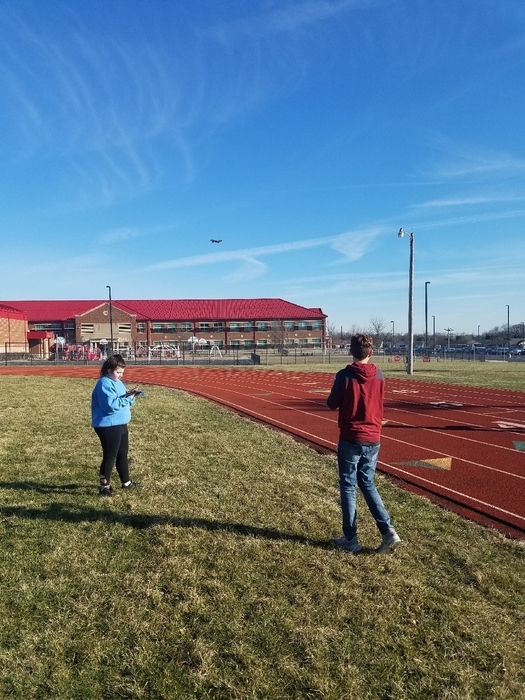 Some of the suggested activities for students are: Develop an invention or an idea to improve school safety ; Honor the victims of the Florida school shooting with 17 positive acts ; and Write letters to elected officials about your ideas for positive change. 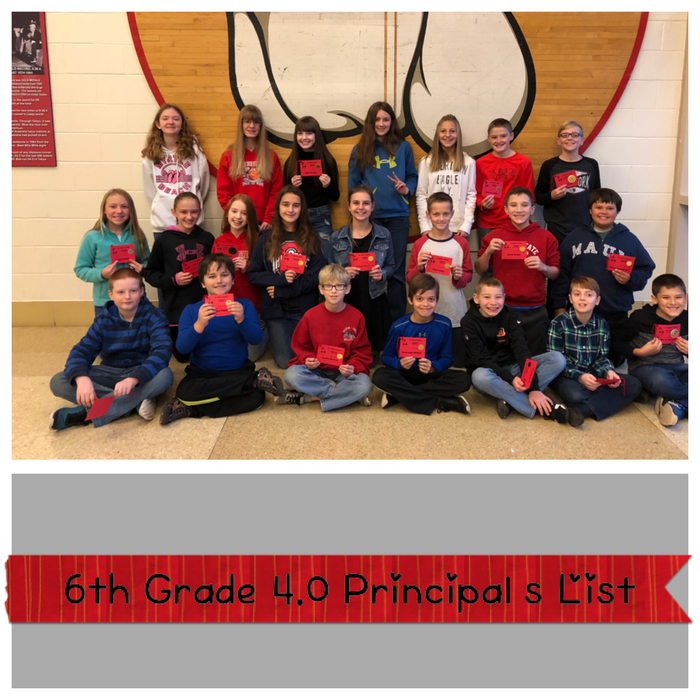 If you would like more information, have ideas for our students, or would like to help in any way, please contact your child's Academic Assist teacher or the office. Thank you! 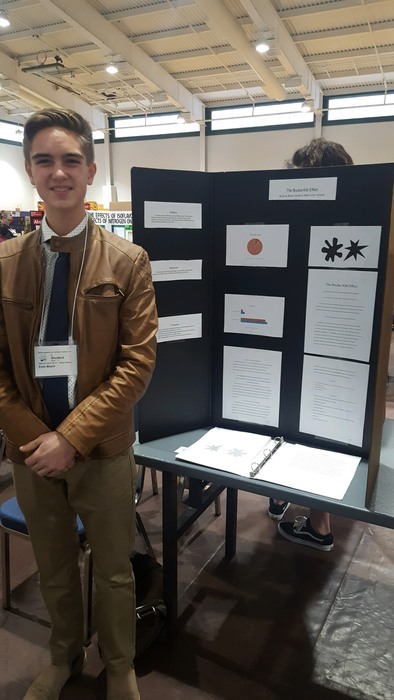 Last Saturday, at Edison Community College, Evan Beard and Madison Stasiak presented their science fair projects to multiple judges. 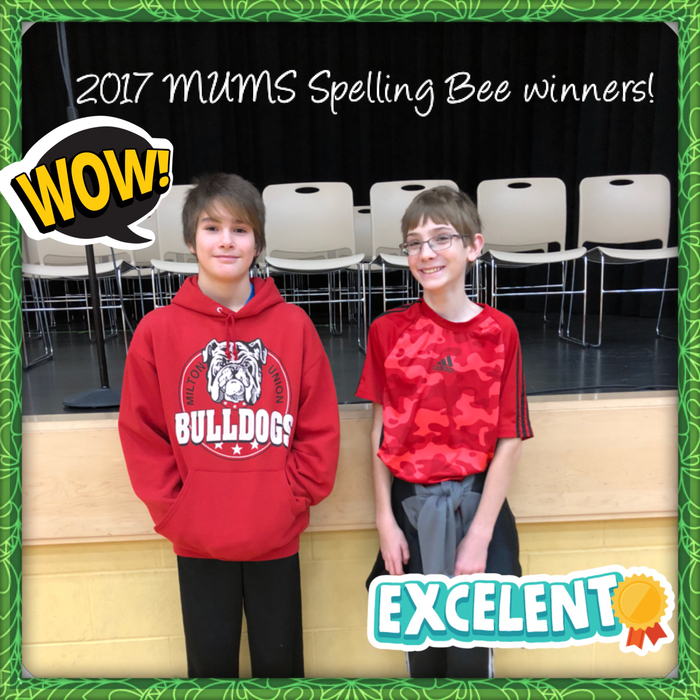 Congratulations to these two students on all of their hard work. 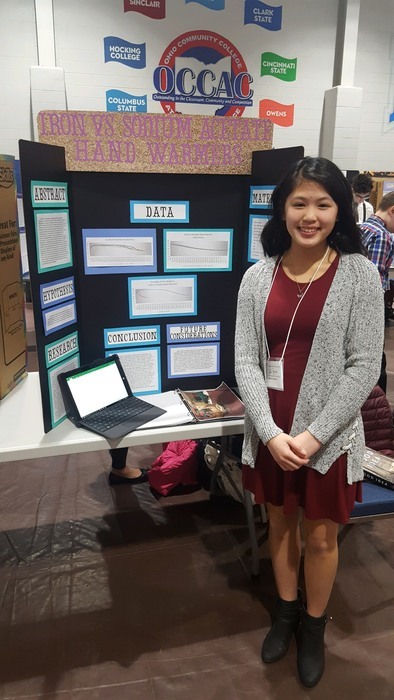 Special congrats to Maddie, whose project was scored as superior, meaning she is eligible for the State Science Fair held at The Ohio State University in May! :) Thanks to Mr. Kinninger for guiding them through this process. 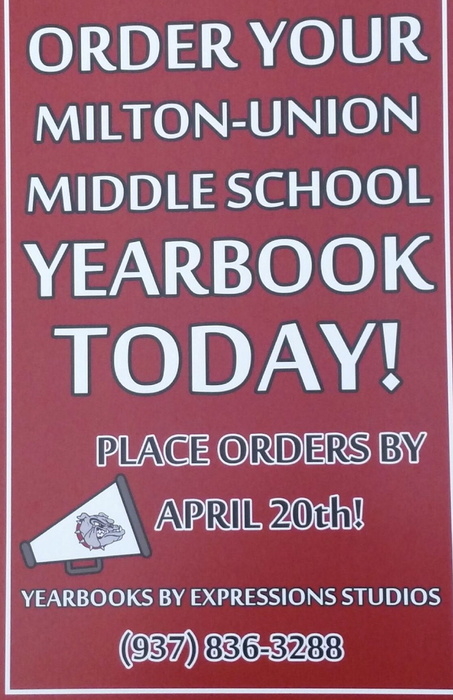 It’s time to order your yearbook! 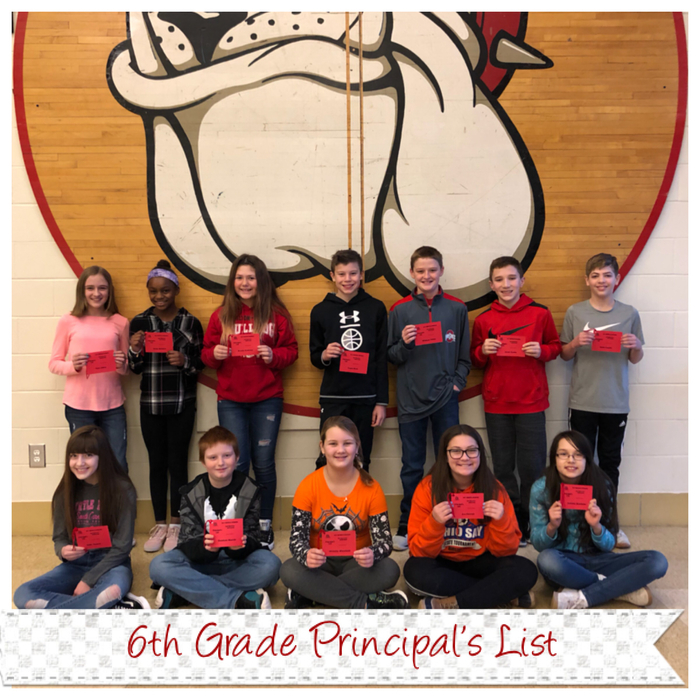 Order envelopes were sent home with all MS students last week. Yearbooks are $22, and orders are due April 20th. 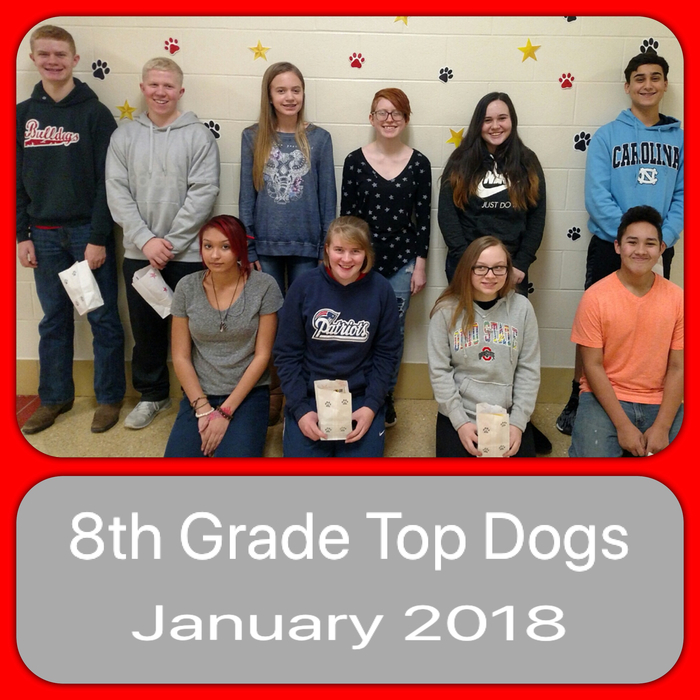 Congratulations to our 8th grade Top Dogs winners this month! 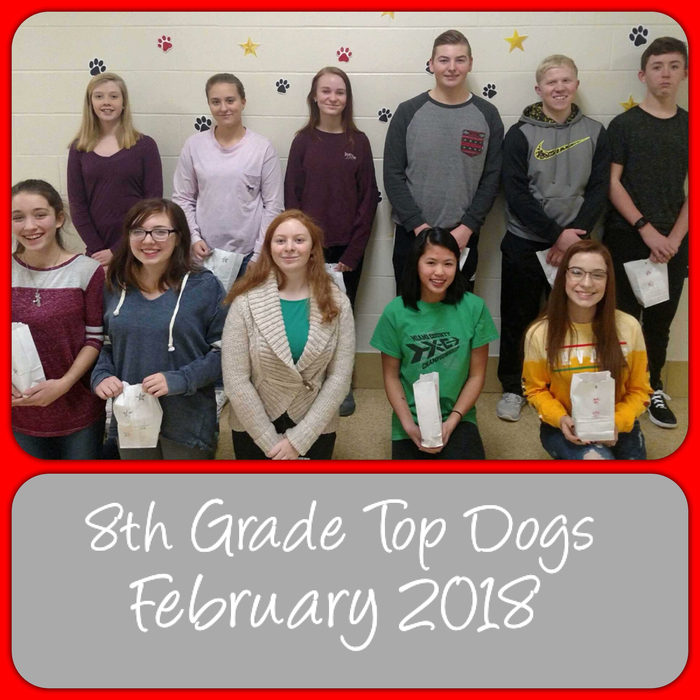 Congratulations to our 7th grade Top Dogs this month! 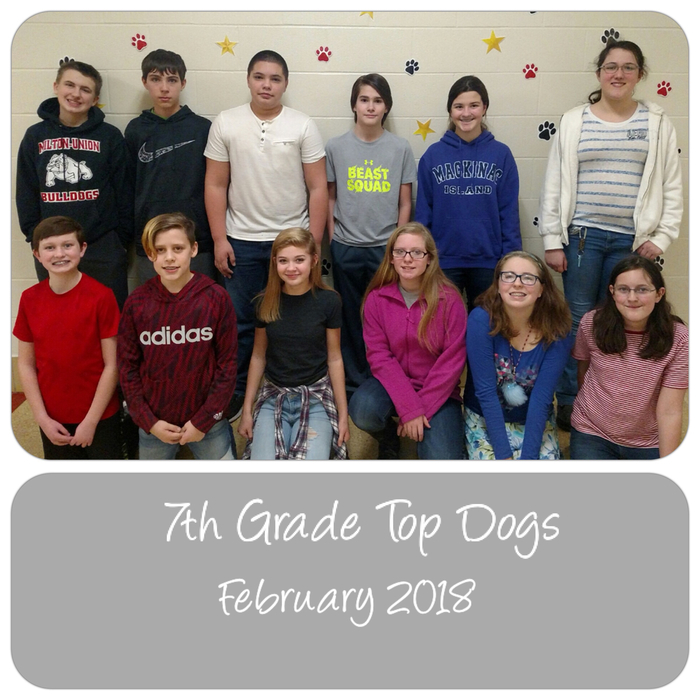 Congratulations to our 6th grade Top Dogs winners this month! Don’t forget that tomorrow, Monday, February 26th is parent-teacher conferences for the middle and high schools. We will have printed midterms available for pick up outside the office, and teachers will be available to meet with parents and students. Conferences will be 3:00 - 6:30. See you there! 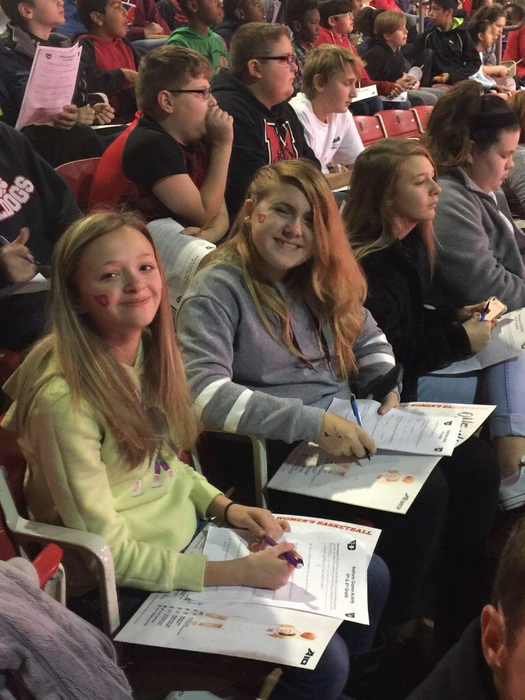 Attention 8th grade parents: On Monday, February 5th, the high school counselors will meet with 8th grade students at school to schedule courses for their freshman year. 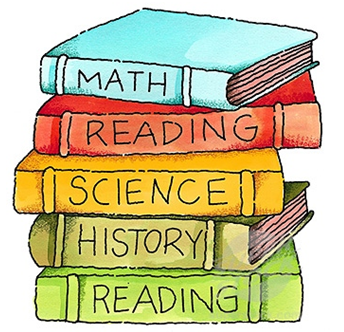 Teachers have made recommendations for math, English, and science courses. 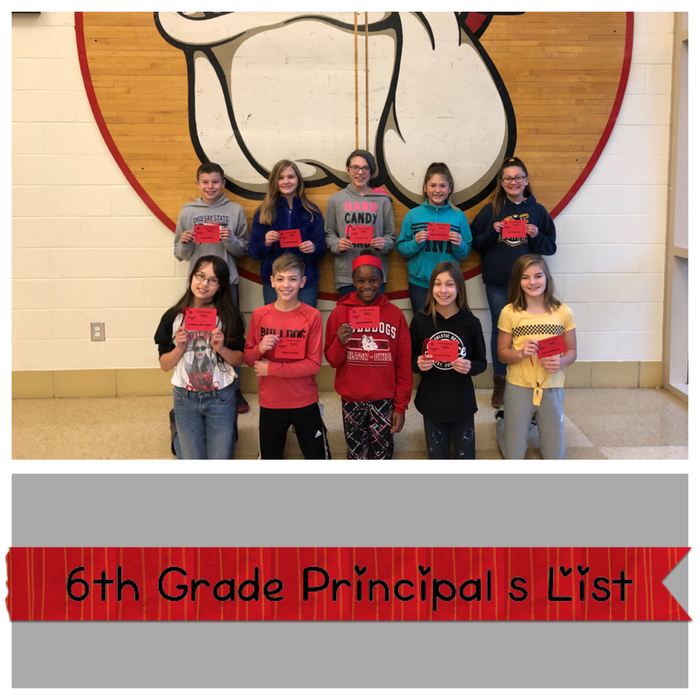 You can view these recommendations online through Power School. After Monday, parents and students will have a two week window in which to view requests and make any changes. 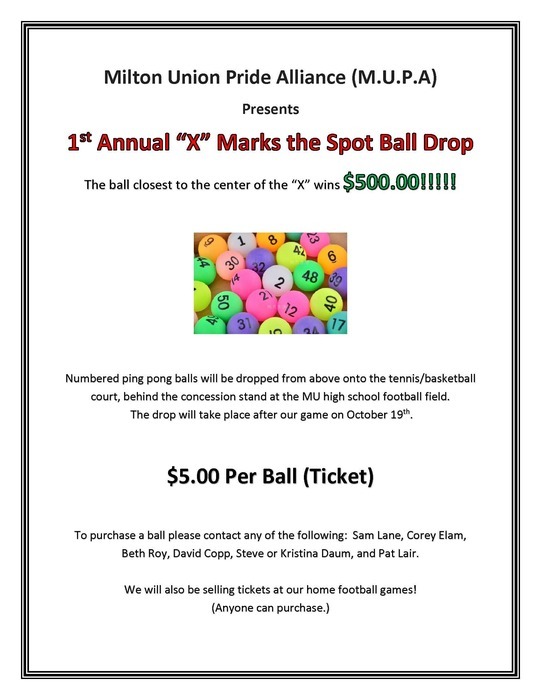 If you have any questions, please contact Paula Shaw at 884-7951. Thanks! 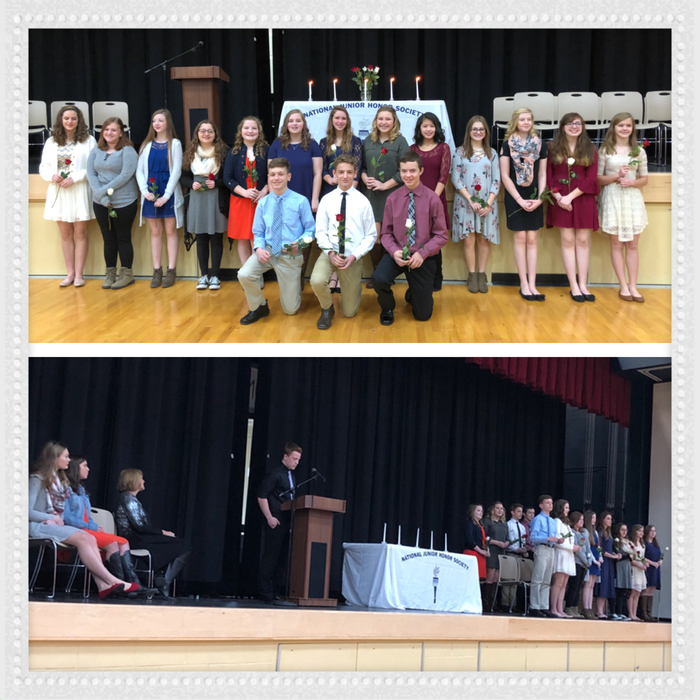 Congratulations to our National Junior Honor Society inductees! 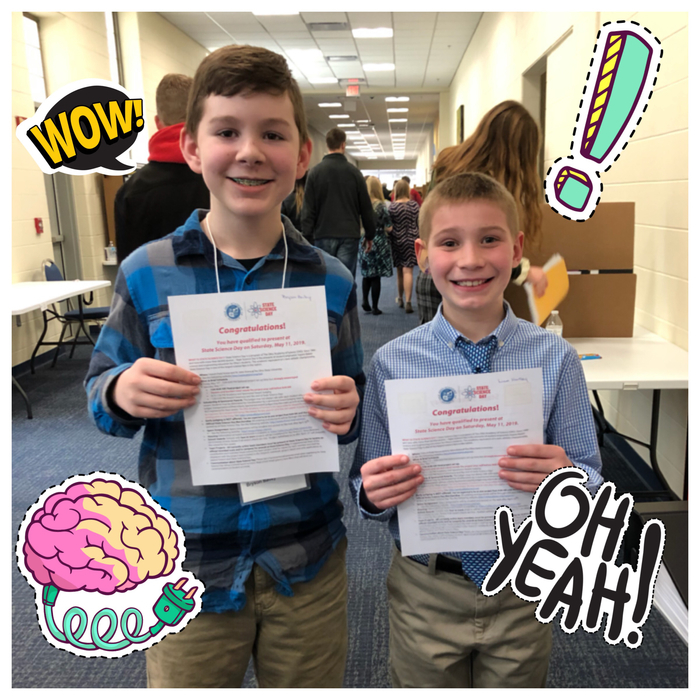 We’re so proud of you! 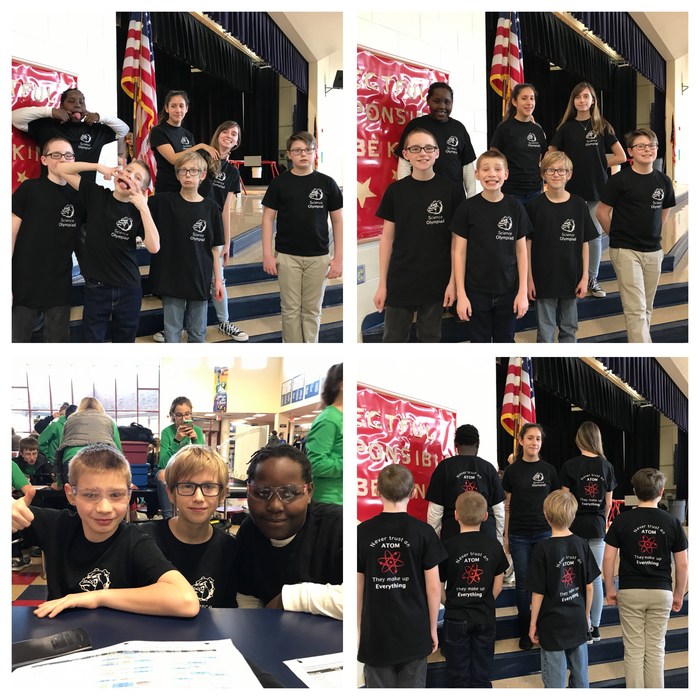 National Geographic Bee was a success. 😊 Congratulations to Ben Iddings, our winner! 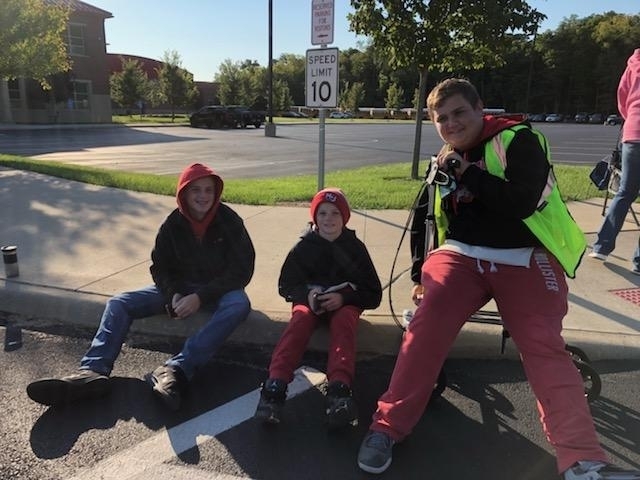 A few reminders for students who are dropped off in the morning: no students are to be dropped off in the back of the building, students need to be dropped off in the front of the building in the right curbside lane, and students are expected to be in class and ready to learn by 7:30 at the latest. Thanks for your help! 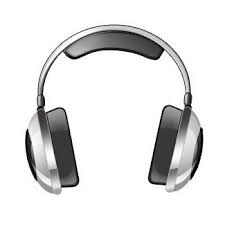 Students and parents are reminded that all students should have ear buds or headphones with them at school at all times. These were on the supply list at the beginning of the year. Thanks for your help! 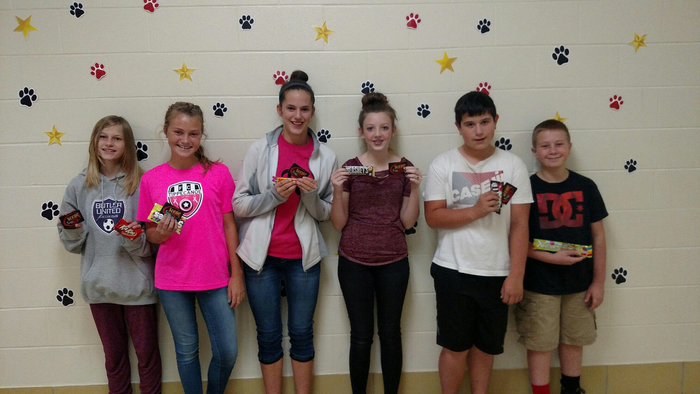 Congratulations to Alyssa Smith, Bella Fox, Lauren Johnson, Ben Schommer, Austin Isbel, and Braden Griffith! 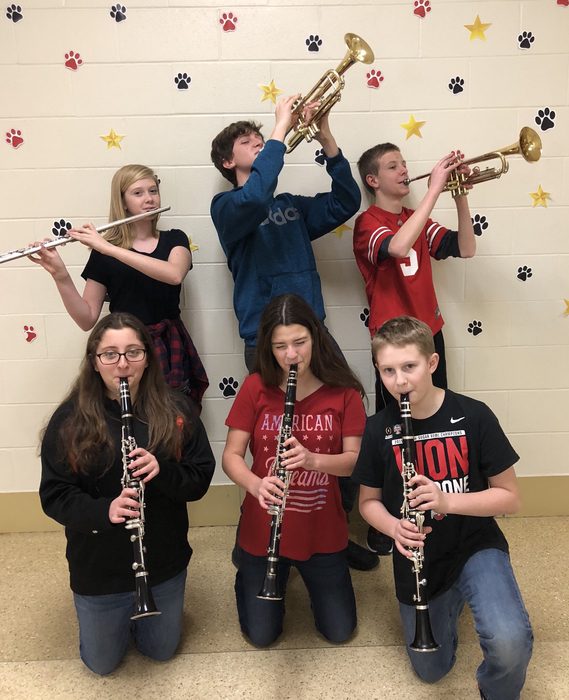 They were selected to participate in the OMEA Honor Band! 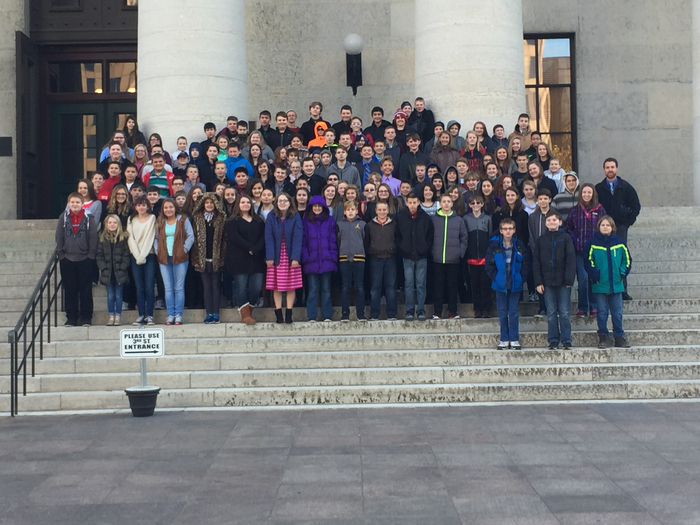 In addition, Austin was also chosen to participate in Ohio State’s Middle School Honor Band. Way to go!! 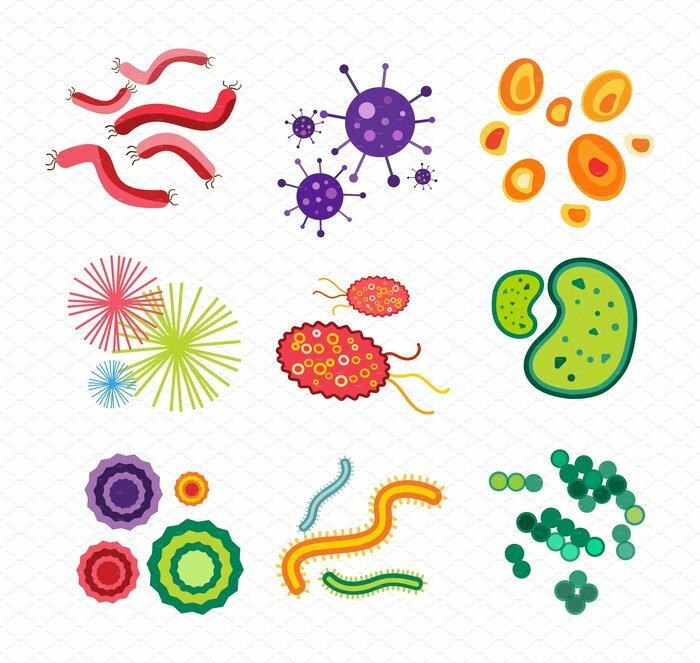 Flu and cold season is here. We'd like to remind parents and students that the absence hotline number is 884-7933. 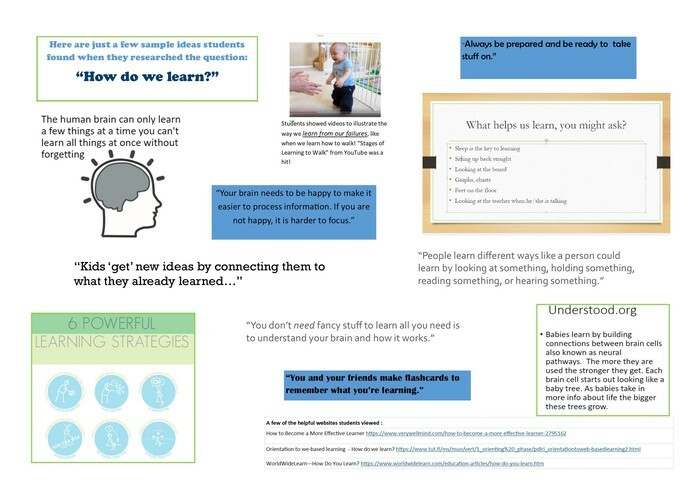 Also, if the student is able to complete work at home, that significantly helps when they return to school. Please remember to request and pick up work when you call the absence hotline number. Thanks! 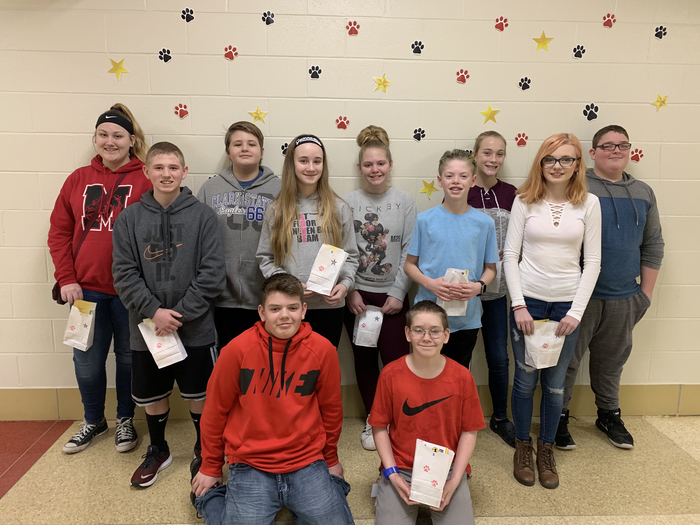 Congratulations to our big winners this month! 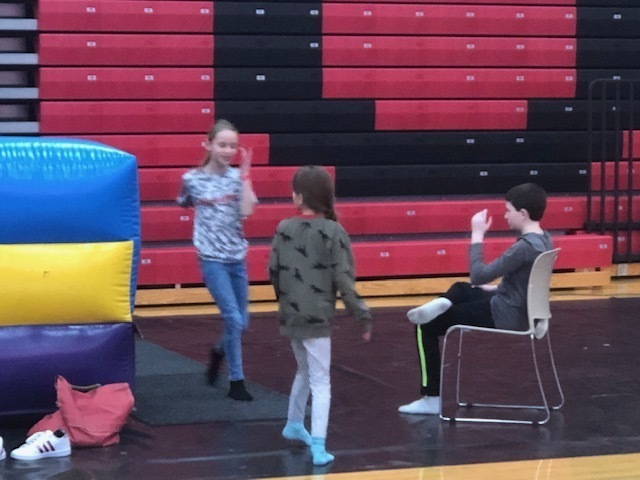 Remember to keep your grades up, follow school rules, and come to school every day to earn tickets for next month’s raffle! 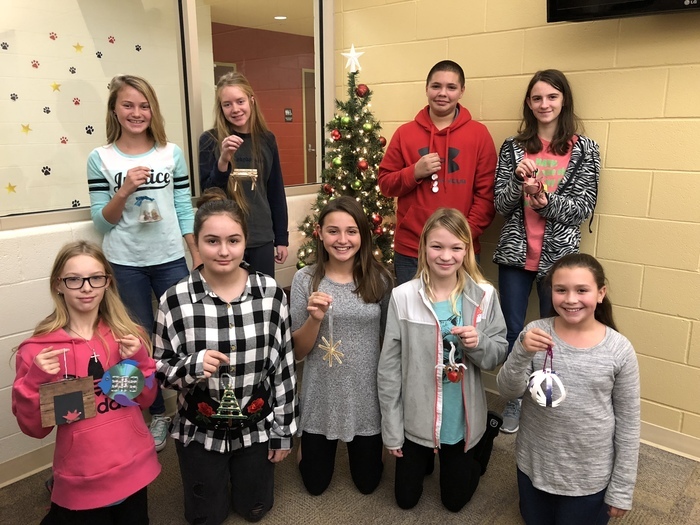 NJHS will collect money for Pennies for Patients from Monday, Jan. 22 through Friday, Feb. 9. This campaign is in conjunction with the Leukemia & Lymphoma Society to raise funds needed to support blood cancer research. The Assist class that raises the most money will earn a pizza party. 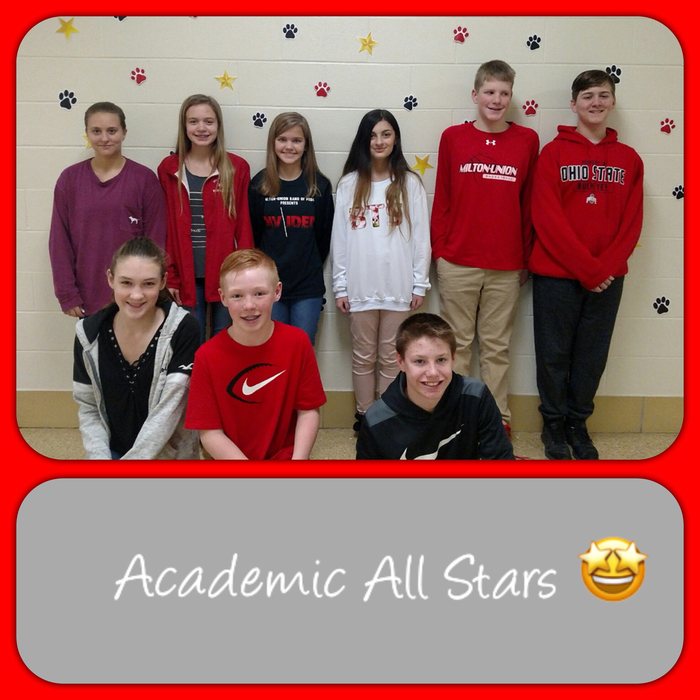 Congratulations to our students who were nominated by their teachers for the Academic All Stars program! 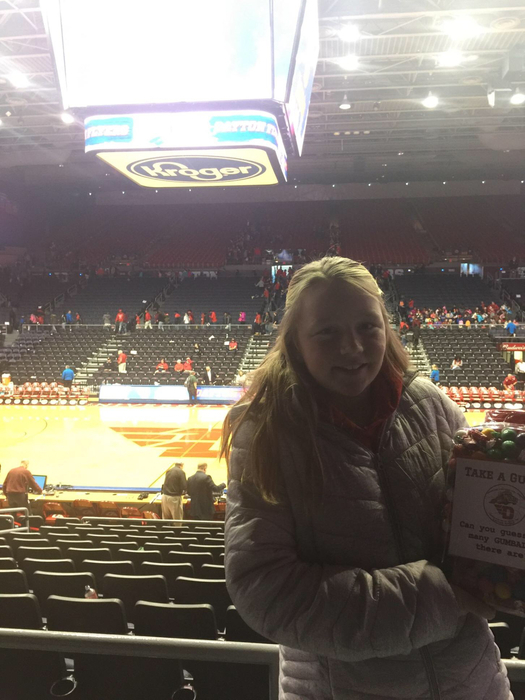 Our 6th graders are having a terrific time at the UD basketball game! 😊 Math and badketball; what could be better?? 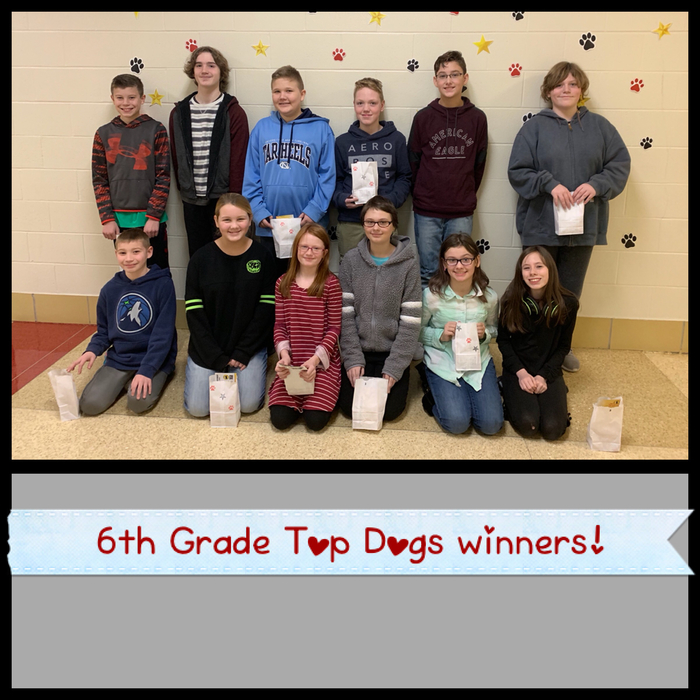 Today was our monthly Top Dogs drawing. 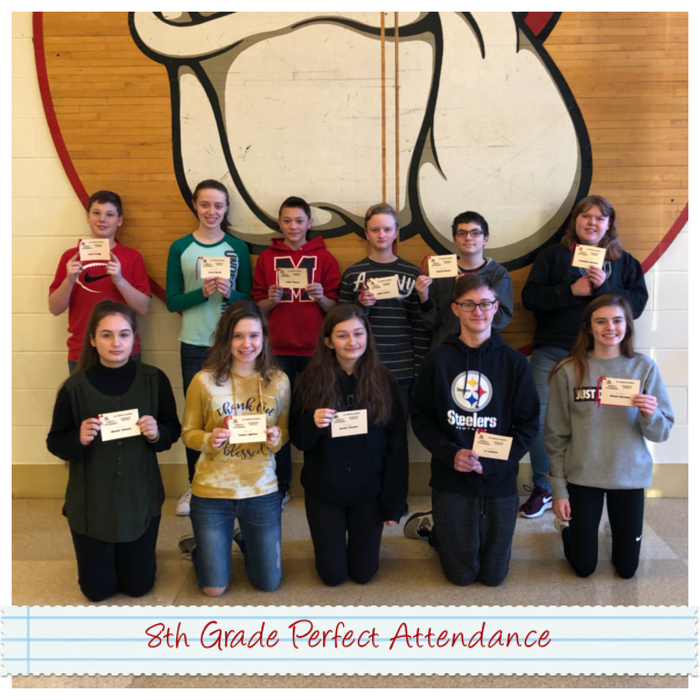 Students earn tickets for their good grades, perfect attendance, and excellent behavior. 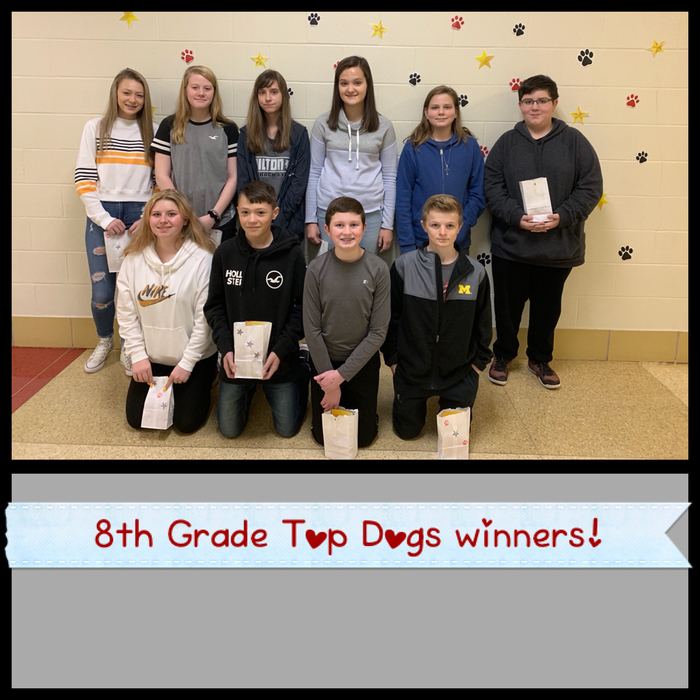 Congrats to the 8th grade winners! 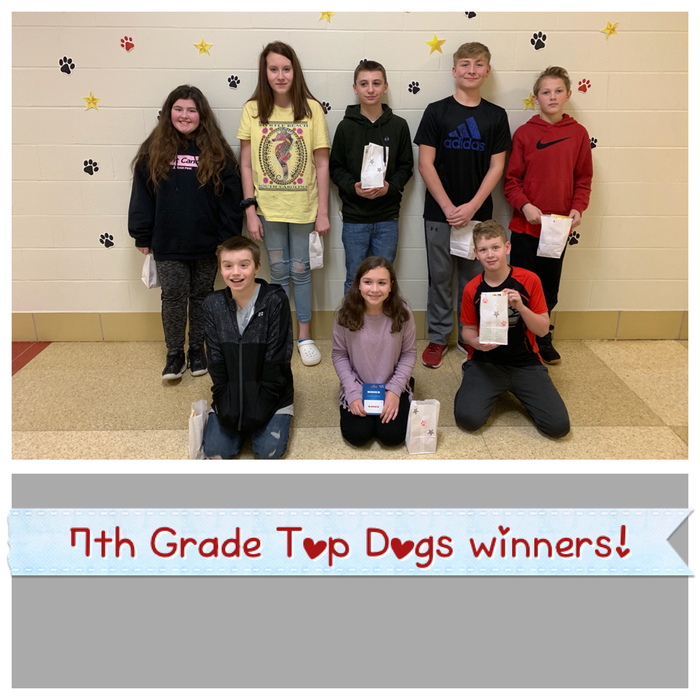 Today was our monthly Top Dogs drawing. 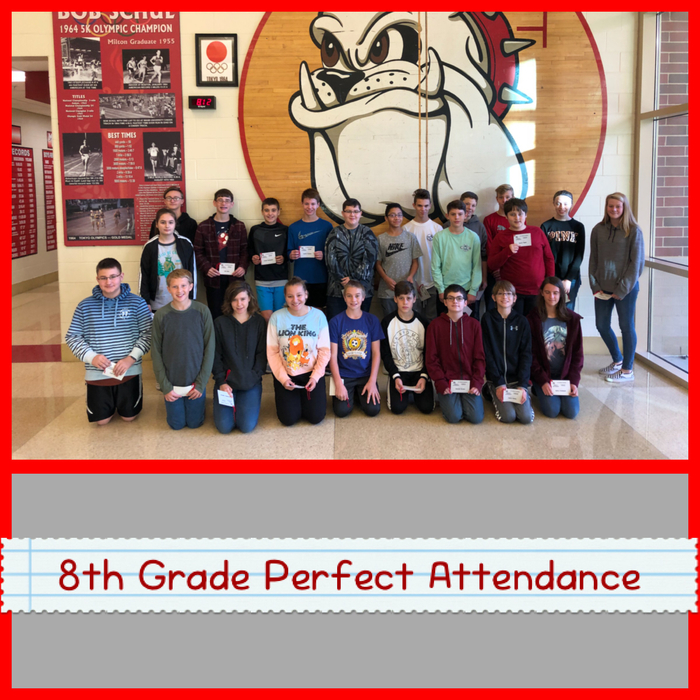 Students earn tickets for their good grades, perfect attendance, and excellent behavior. 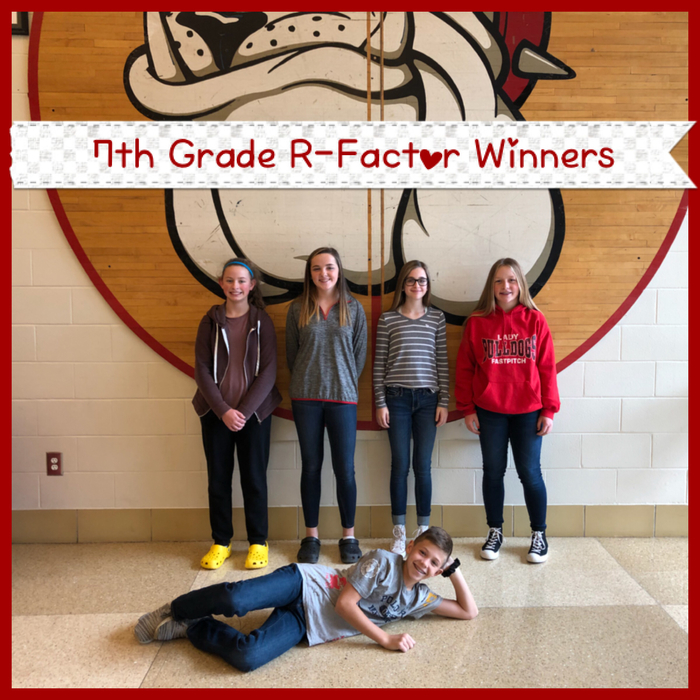 Congrats to the 7th grade winners! 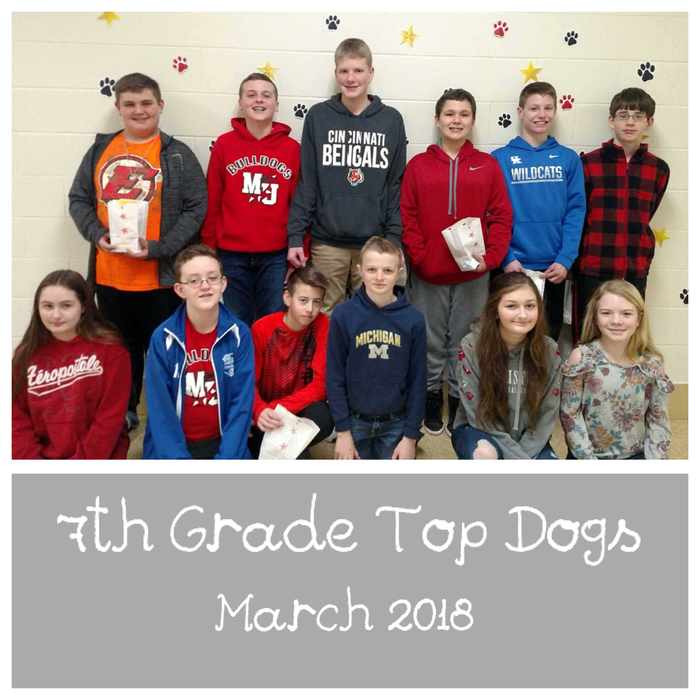 Today was our monthly Top Dogs drawing. 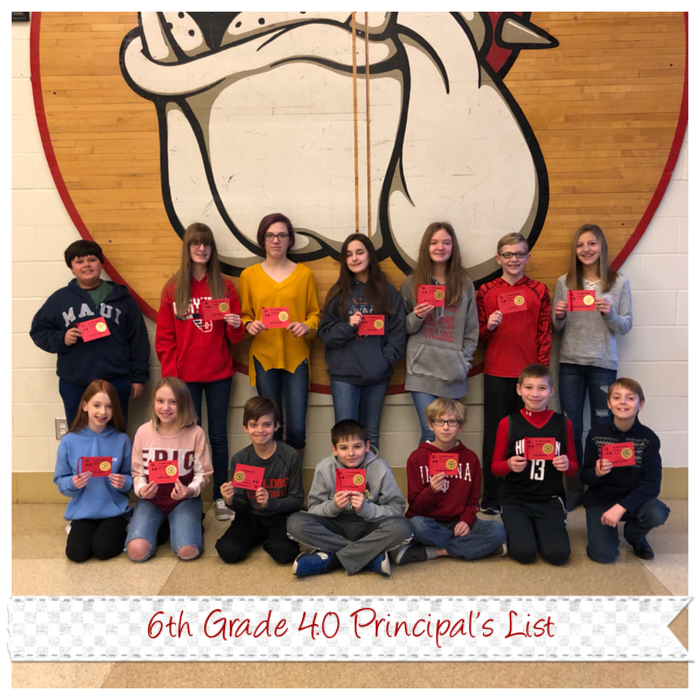 Students earn tickets for their good grades, perfect attendance, and excellent behavior. 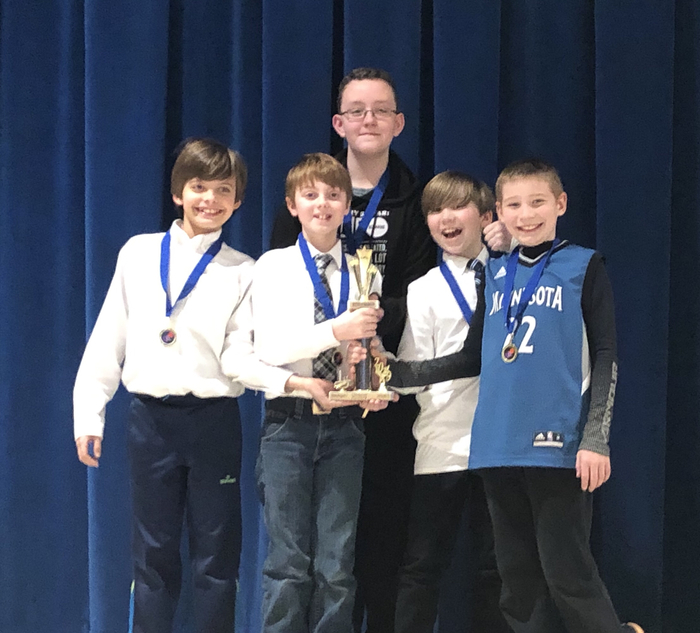 Congrats to the 6th grade winners! 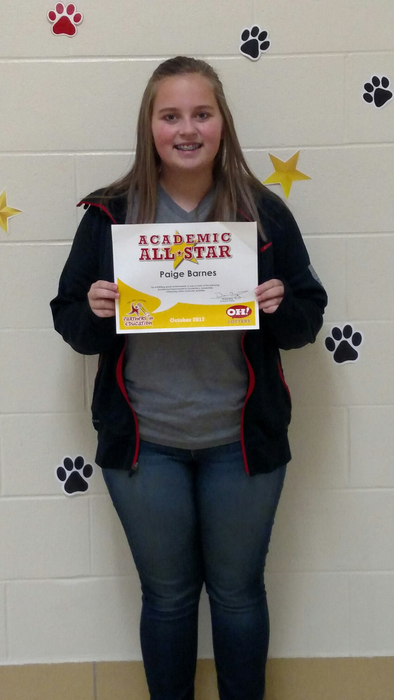 Congratulations to Paige Barnes! 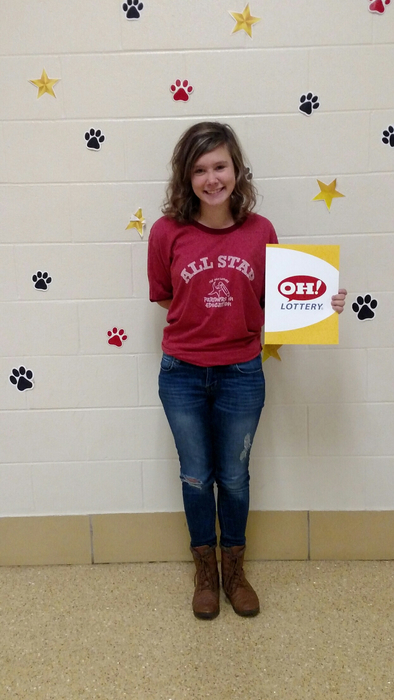 Paige was selected by the Ohio Lottery as the Regional Academic All Star. 😊 Way to go, Paige!! On Friday, November 3rd, all MUMS students will receive their 1st Quarter report card, along with the November newsletter and a paper copy of the application for free and reduced lunch. 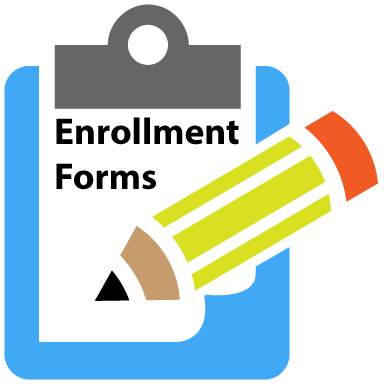 Please take a few minutes to review your child’s grades with them, and encourage them to set goals for themselves for 2nd quarter. If you have questions about any of these items, please contact our office at 884-7930. Thanks! 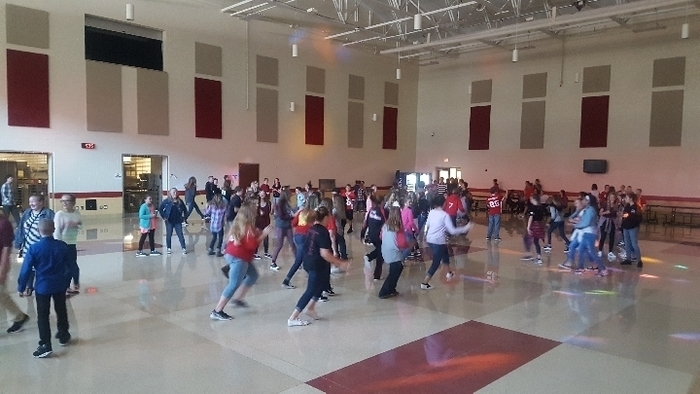 Having a blast at the Fall Fling! 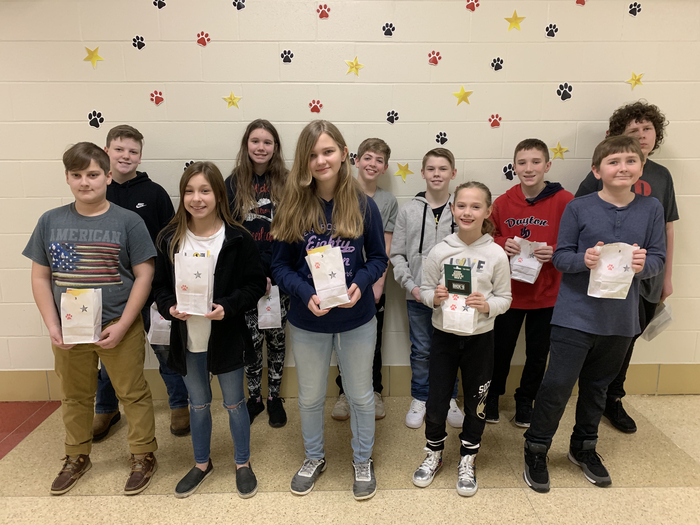 The Science Connections class will collect pull tabs for a contest sponsored by Miami County Solid Waste. Money earned from recycling the tabs is donated to the Ronald McDonald House. More info soon! 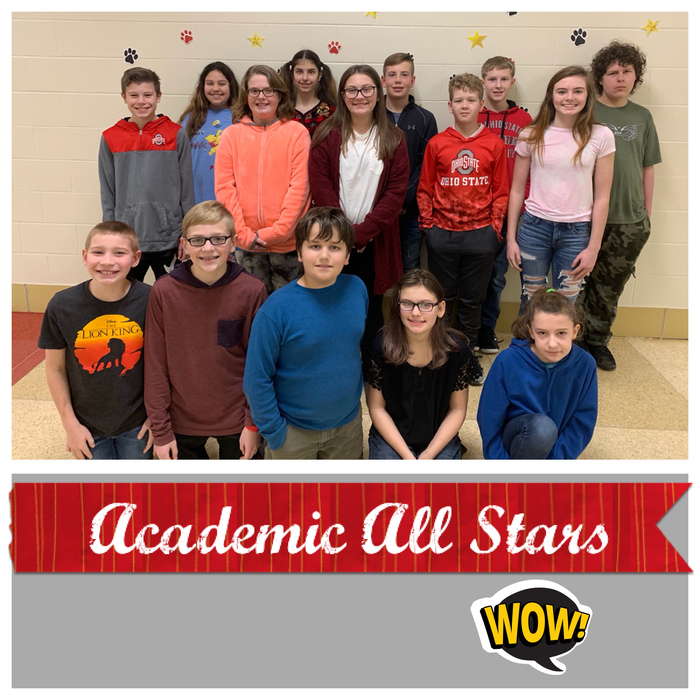 Academic All Stars is a program sponsored by the Ohio Lottery to allow teachers to recognize students for excellence in academics, responsibility, attitude, leadership, school spirit, citizenship, extra-curriculars, or community service. 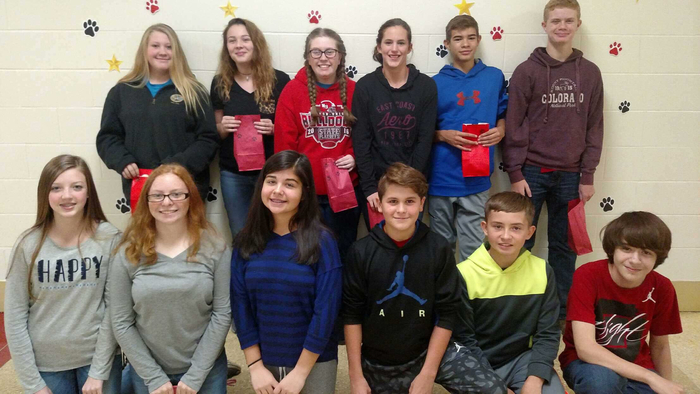 Join us in congratulating our nominees for September! 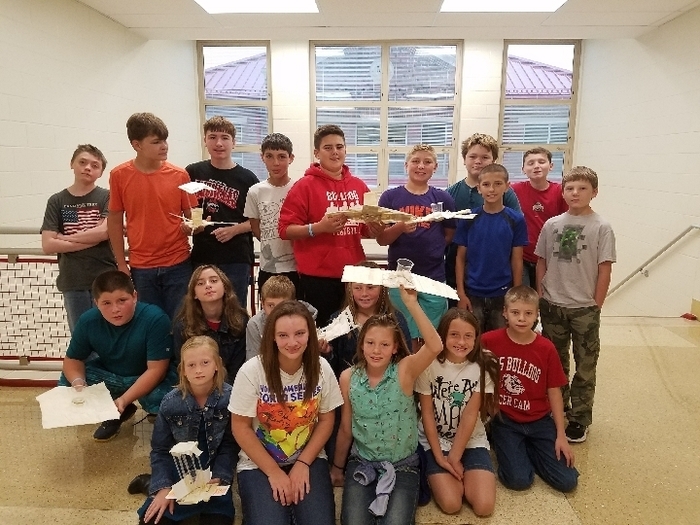 Intro to STEM classes design, build and test "Mars landers"
Bulldog Homecoming Spirit Week! Don't forget that tomorrow is Tone Up Tuesday! 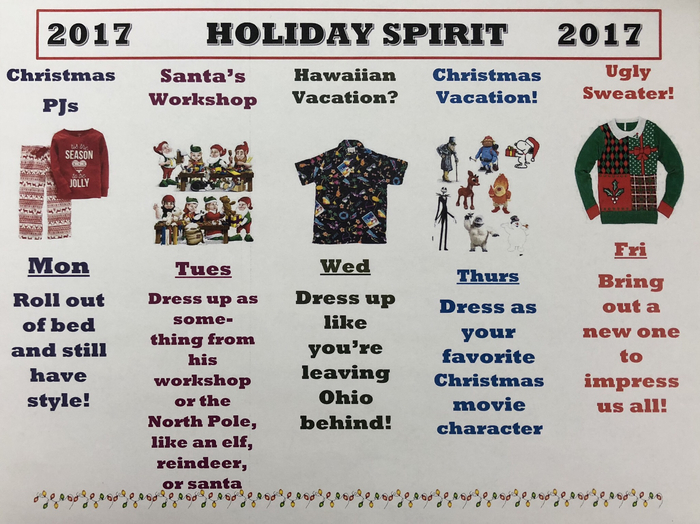 – wear workout gear, Wednesday is Wake Up Wednesday- wear pajamas and bed head, Thursday is The ‘Oz’ Day- wear emerald green and your bling, and Friday will be Spirit Wear Friday- wear your red and white Bulldogs gear! High school student council will be selling Homecoming t-shirts at lunch this Thursday and Friday at lunch in the cafeteria. Homecoming t-shirts are $13 each. 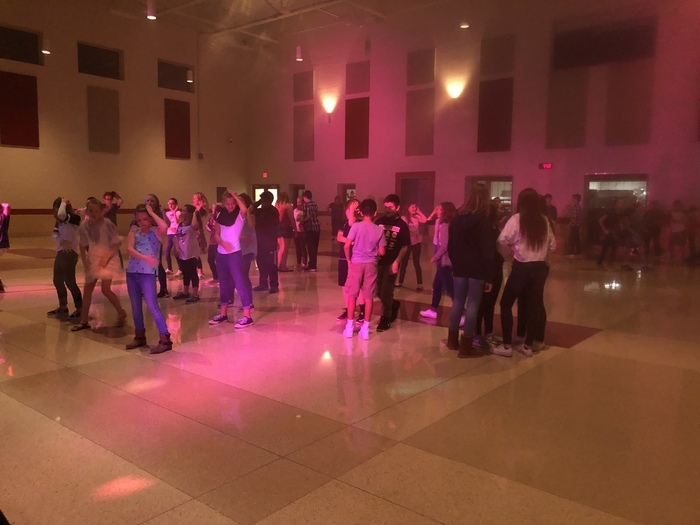 Back to school dance fun! Our National Junior Honor Society is currently collecting supplies to send to Hurricane Harvey survivors. Some suggested items to donate are: gift cards from Walmart, Lowe's, Home Depot; new packages of underwear or socks (any sizes); mosquito repellent; plastic totes with lids; heavy duty rubber boots and gloves; trash bags; Clorox wipes; cases of bottled water; bathroom and grooming supplies, etc. Items will be transported to the JVS on Friday to be loaded on a semi headed for Texas. Thanks for your help! 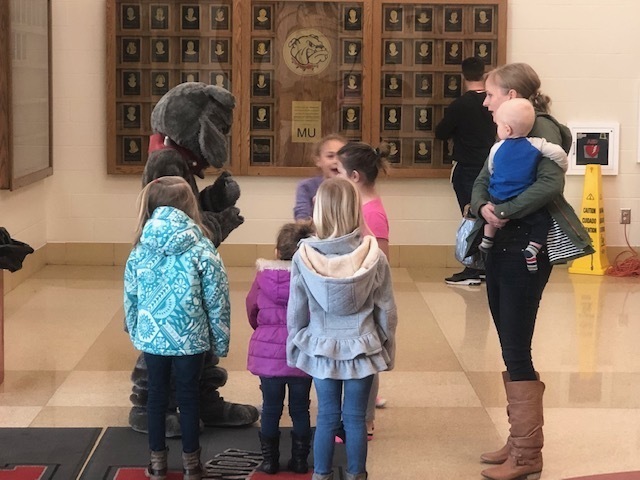 Effective immediately all students who attend Milton-Union Schools K-12, admission price to home athletic events is now $2.00. 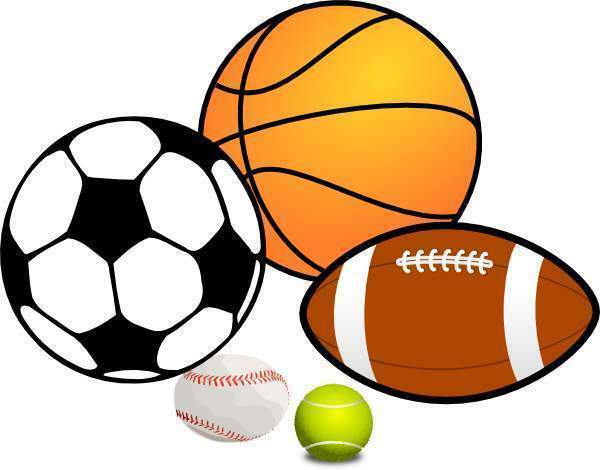 All High School and Junior High Student-Athletes for Milton-Union Schools will have free admission to home athletic events with their student-athlete pass. 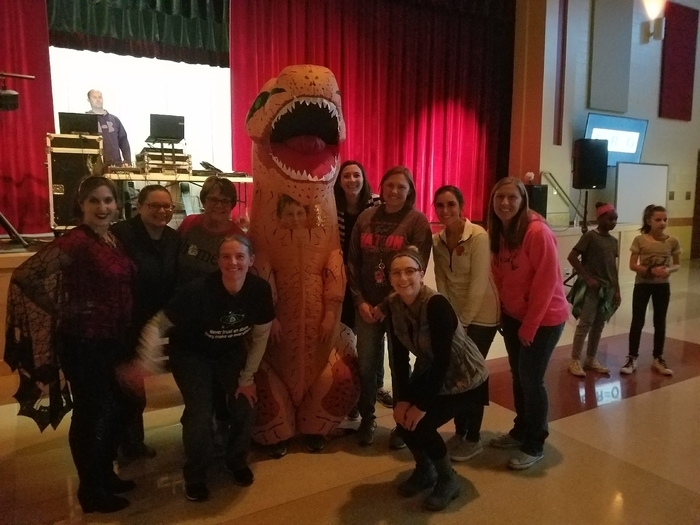 (they must have the pass with them) We look forward to seeing our students support one another! 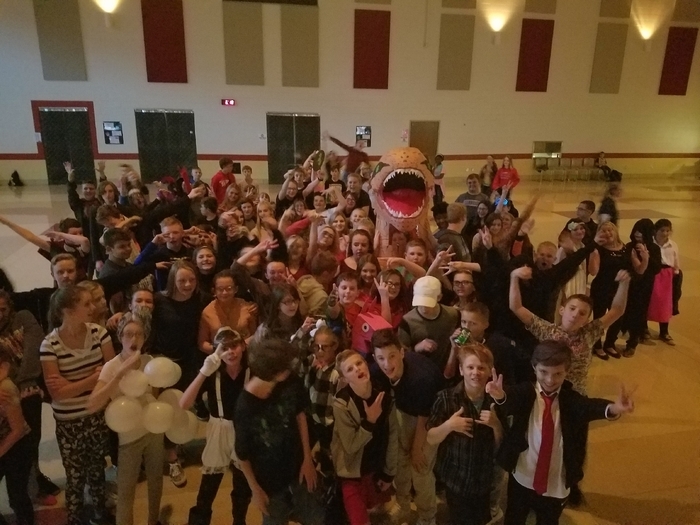 Great job 7th grade! 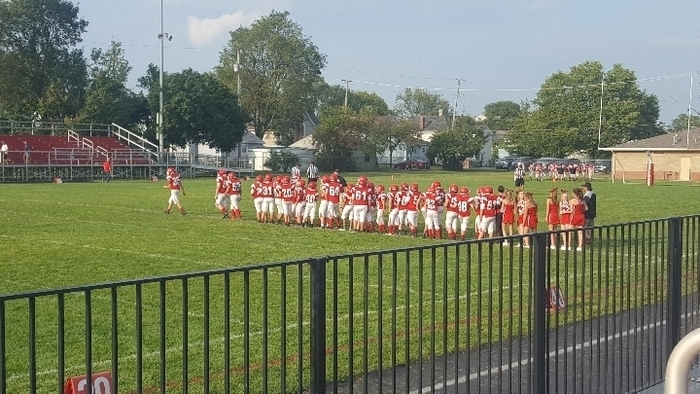 30-8 victory over Oakwood. 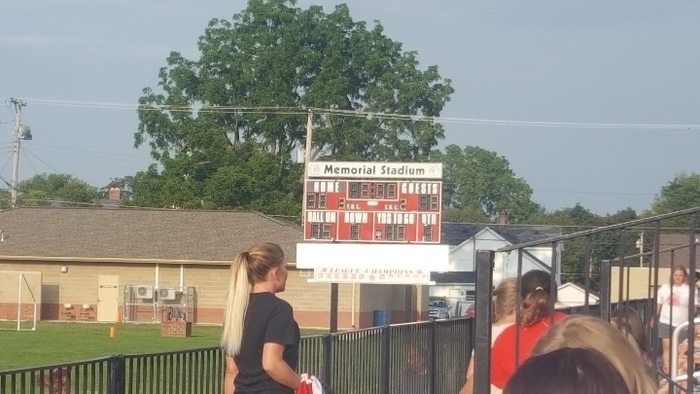 Let's go 8th! 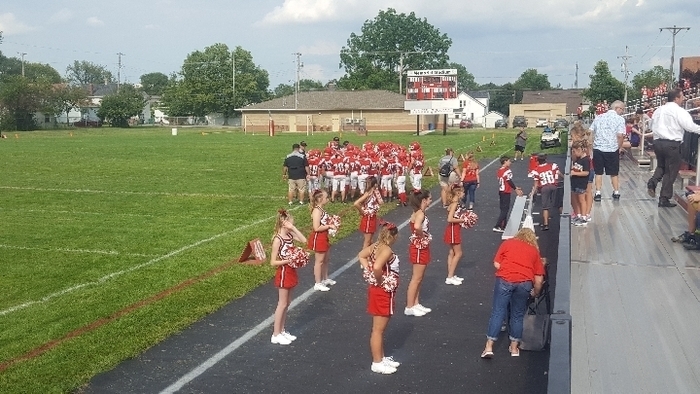 7th grade football and cheerleaders ready for action. 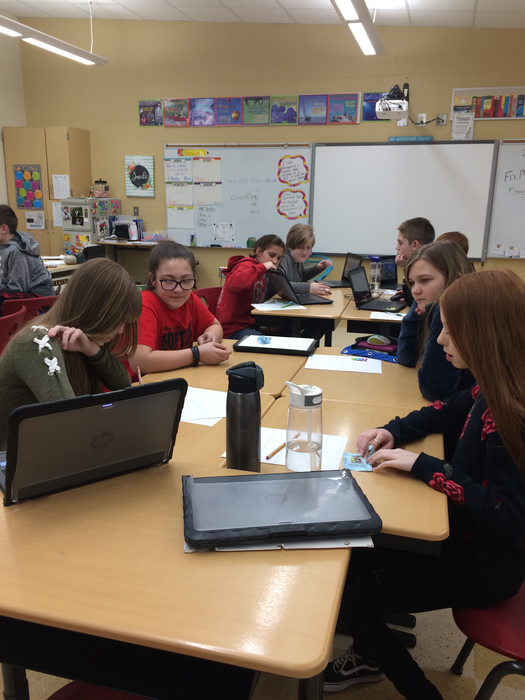 Homework Club started today after school. 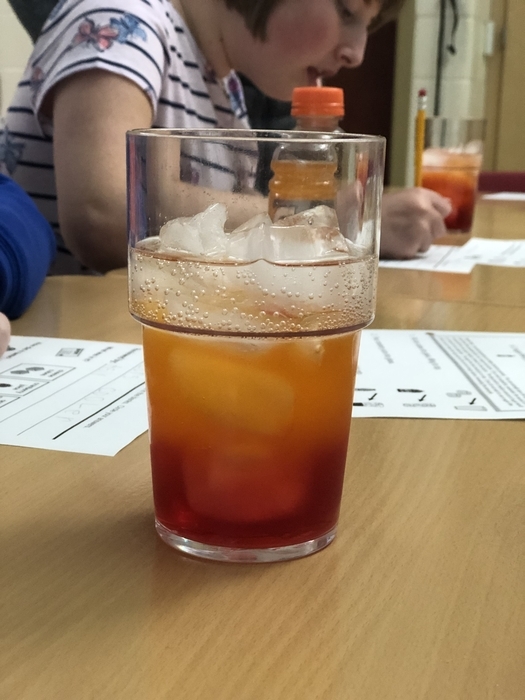 At MUMS, this is open to any student, and is held Mondays, Tuesdays, Wednesdays and Thursdays until 3:30. Please consider taking advantage of this opportunity! Oh, no! :( There was a computer glitch we just found out about, and the MS fees were not correct. We're so sorry about the confusion. We're working hard to get this corrected. For those parents who already paid fees, we will mail you an updated invoice. Again, we apologize for the confusion! Lunch prices will be going up by a nickel next year. Middle school lunches will be $2.45 next year. 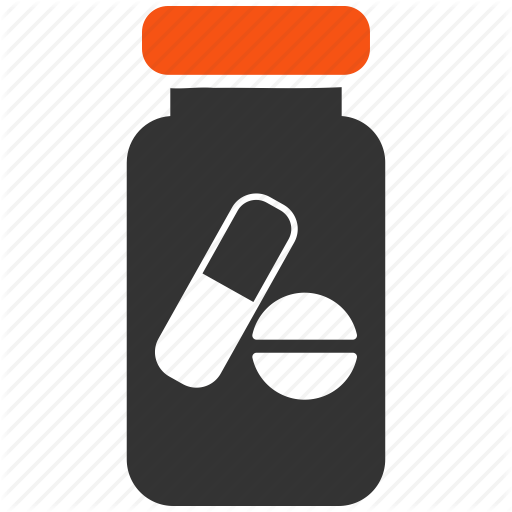 Medication Reminder: Parents need to pick up all medication/clinic supplies by the end of the school day Friday, June 2. All medicine not picked up will be discarded at the end of the day. 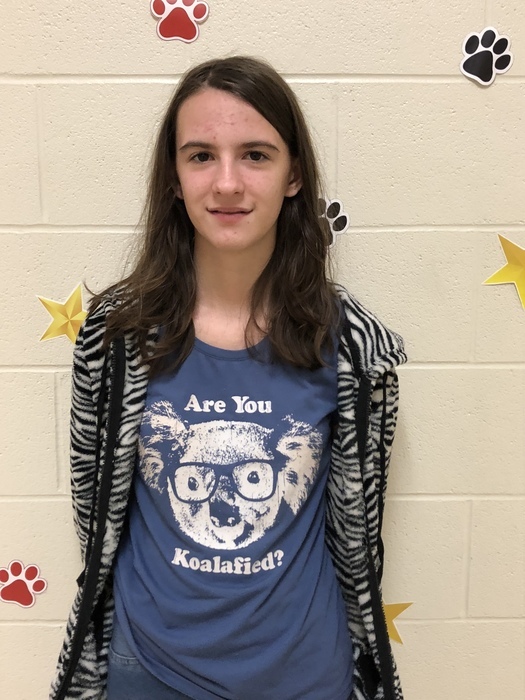 Diana Johnson won the spelling bee for grades six through eight. 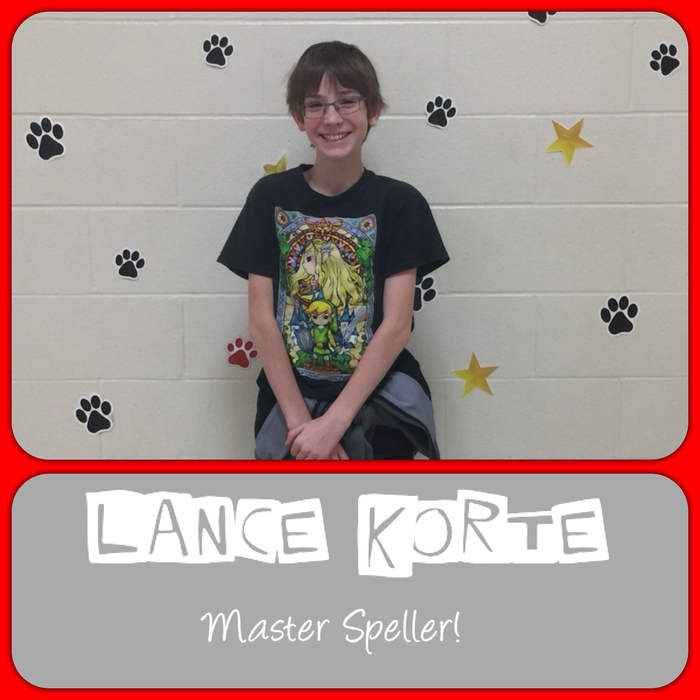 Lance Korte was the runner-up.